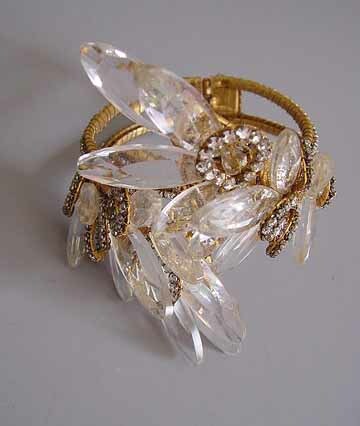 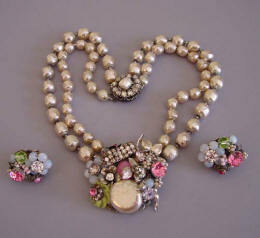 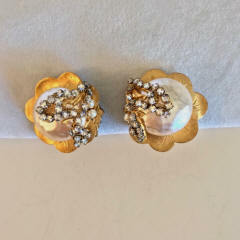 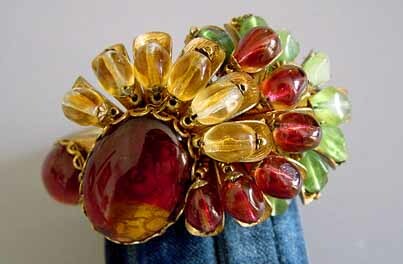 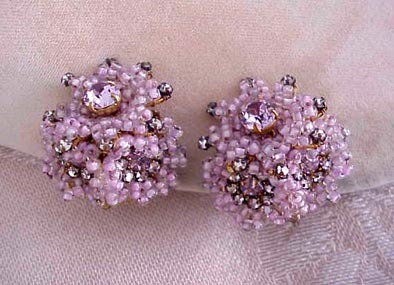 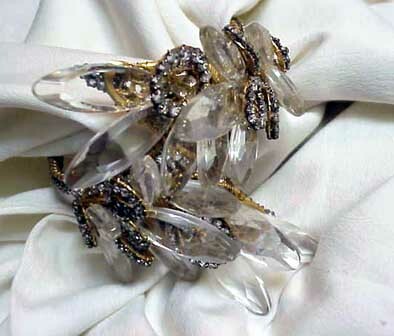 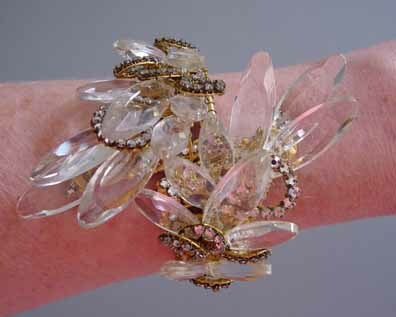 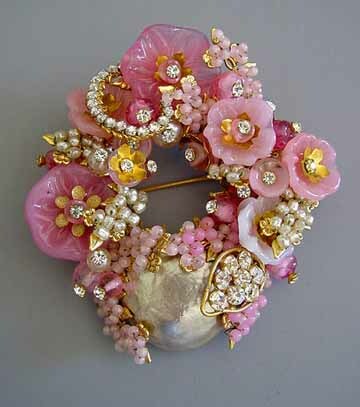 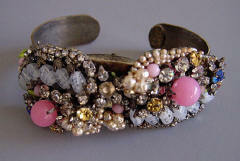 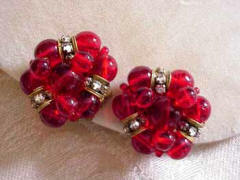 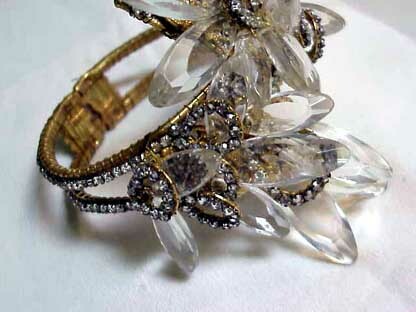 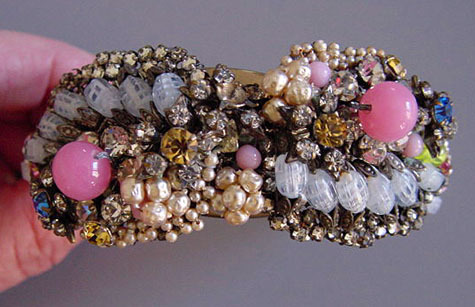 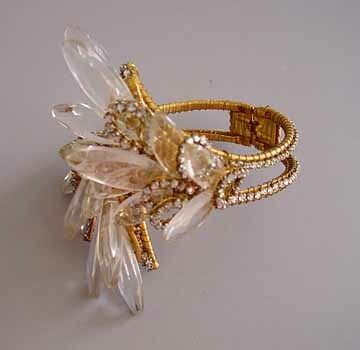 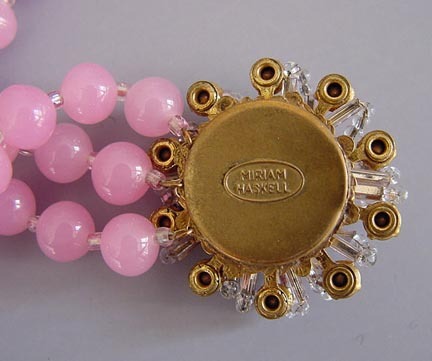 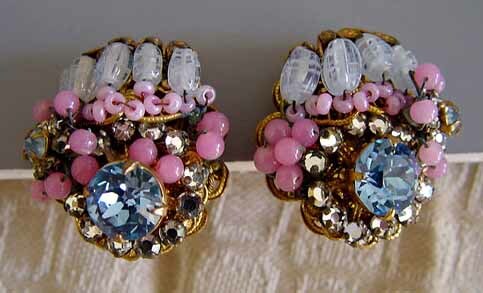 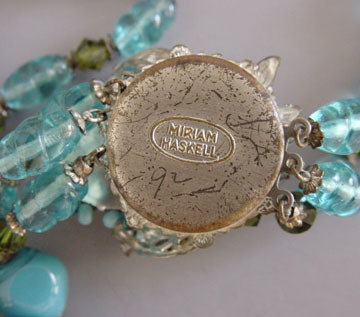 Miriam Haskell... the jewels that dreams are made of! 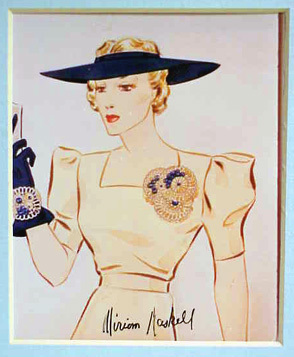 Her designs are legendary, and her look unique. 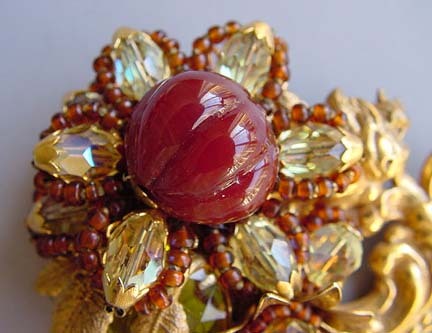 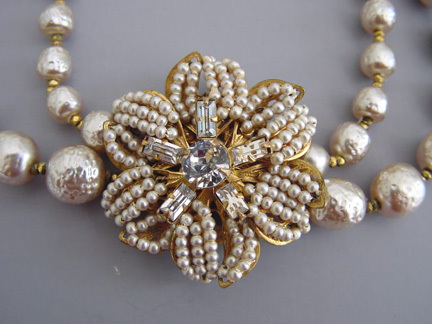 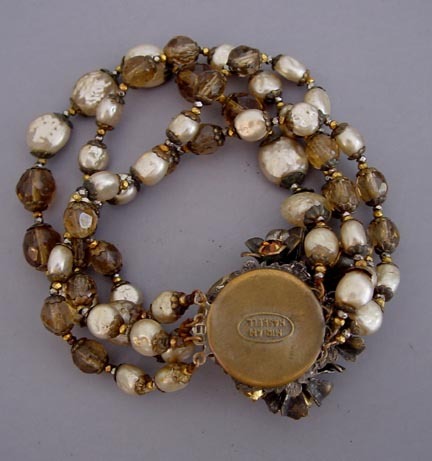 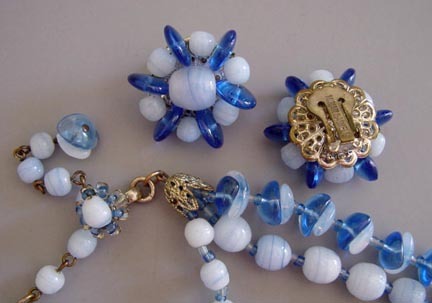 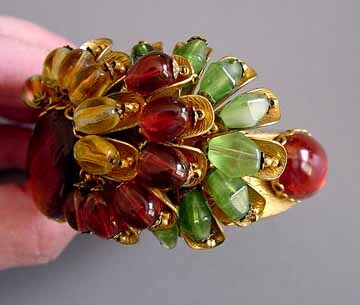 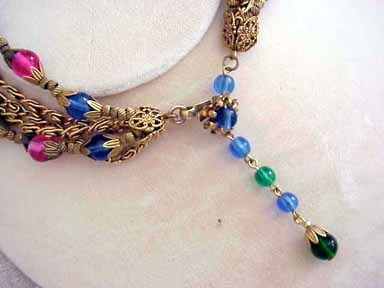 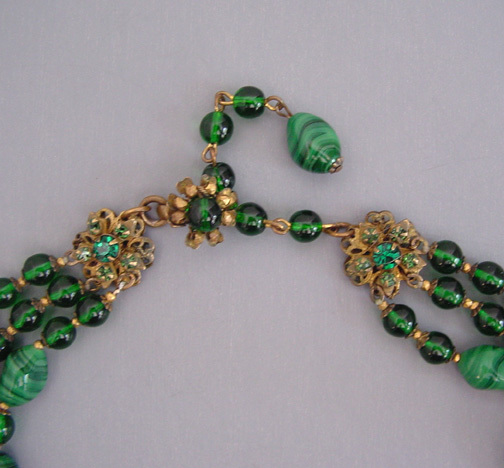 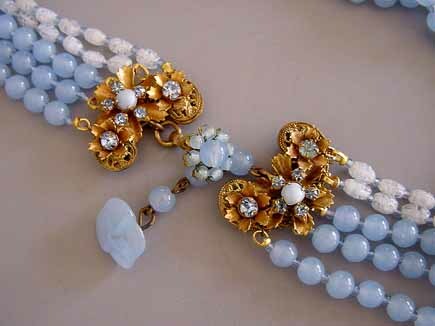 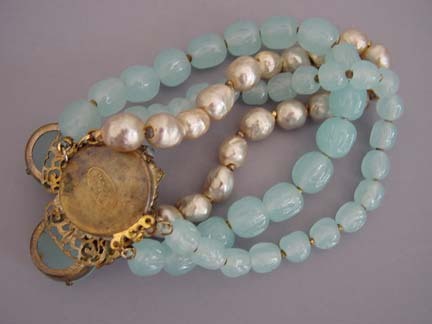 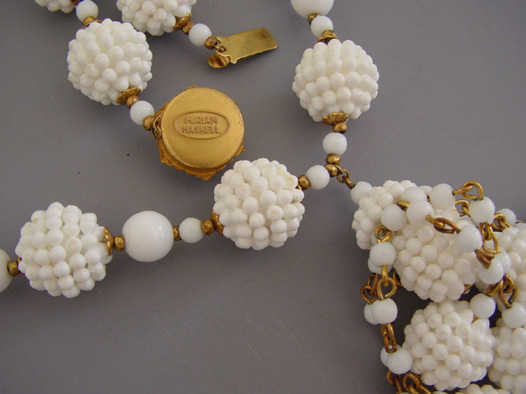 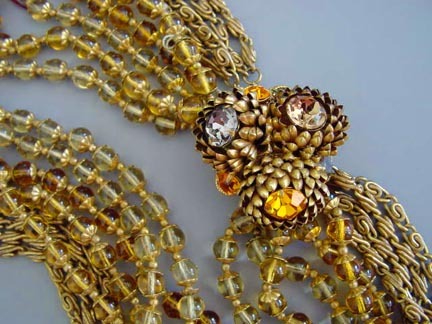 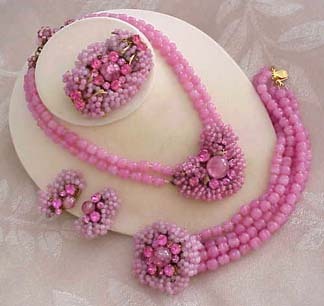 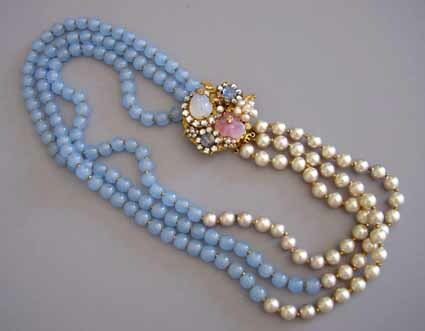 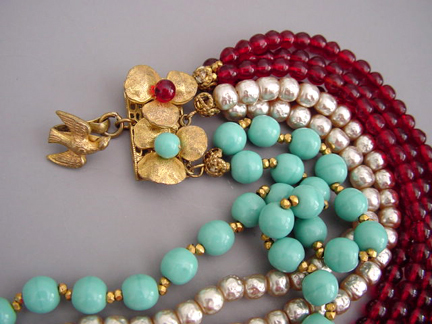 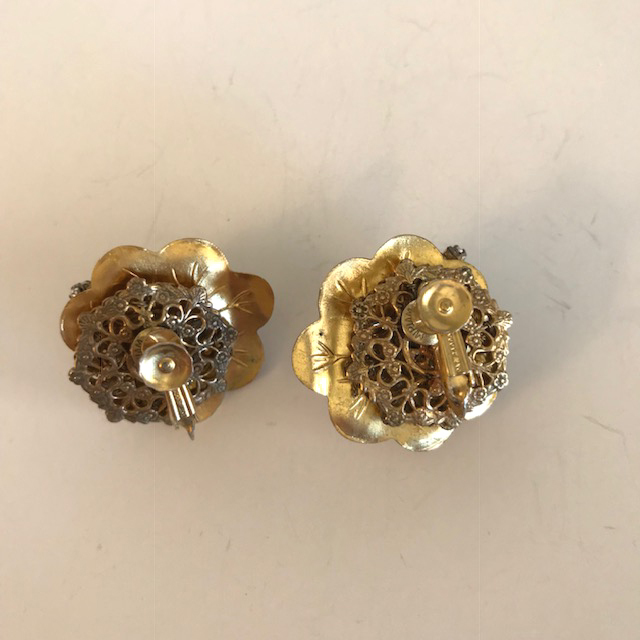 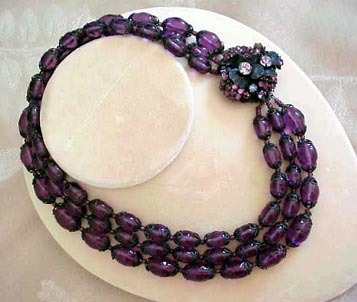 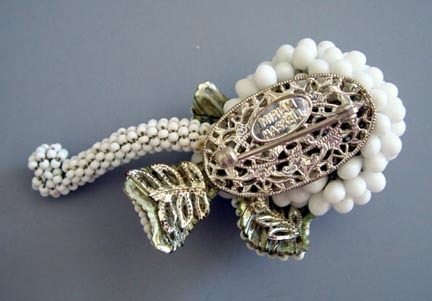 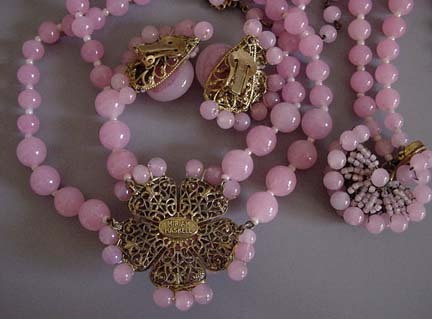 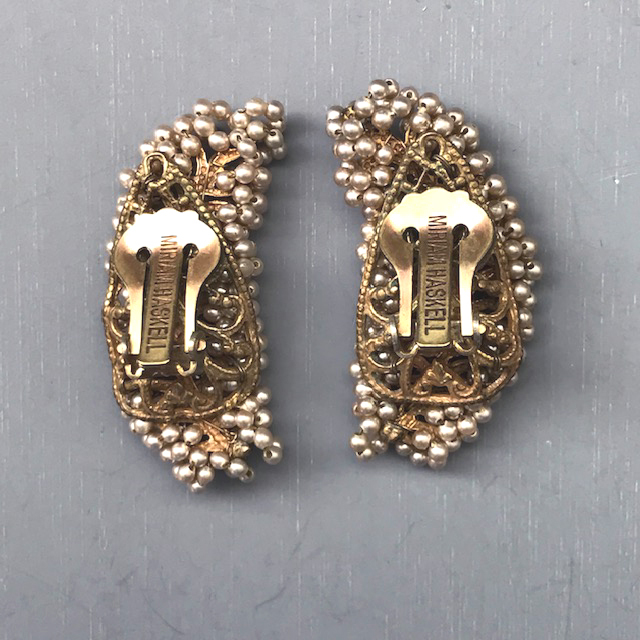 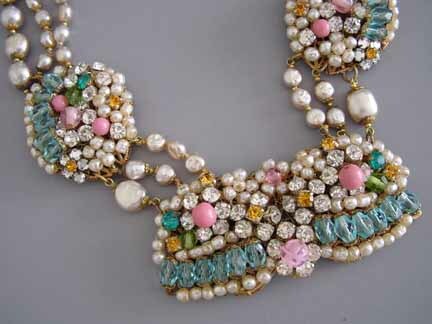 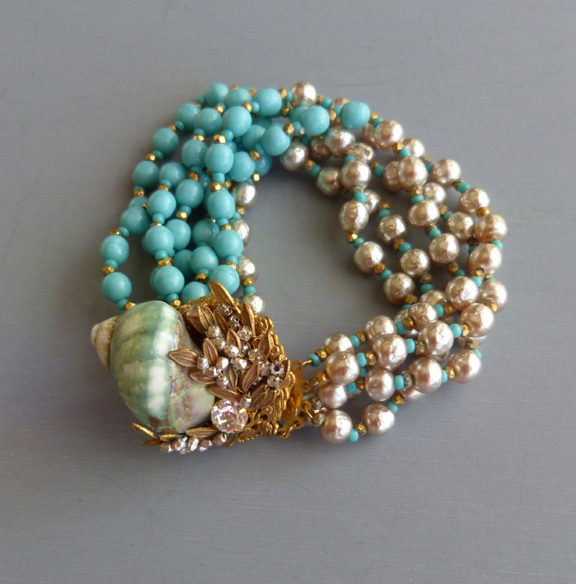 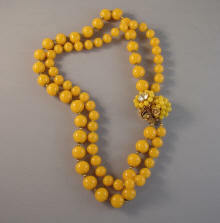 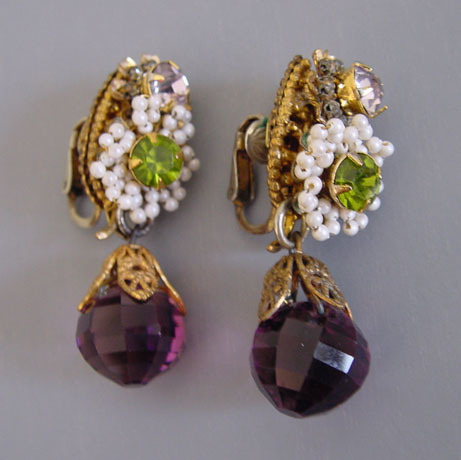 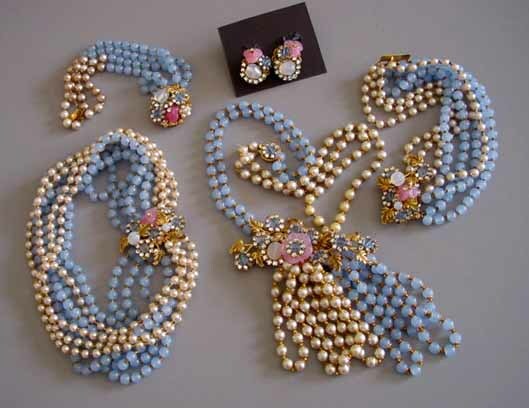 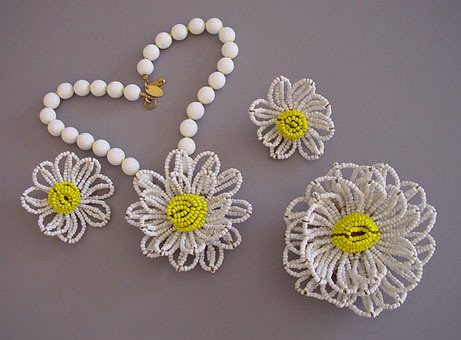 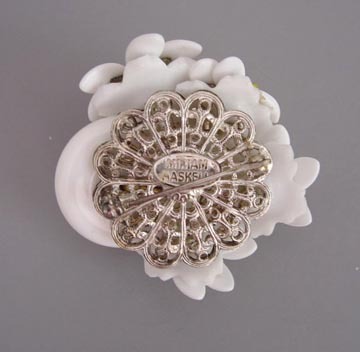 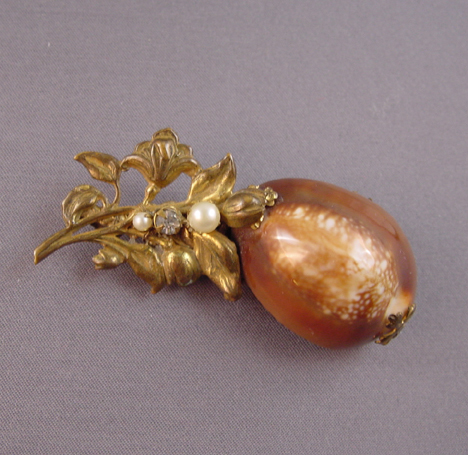 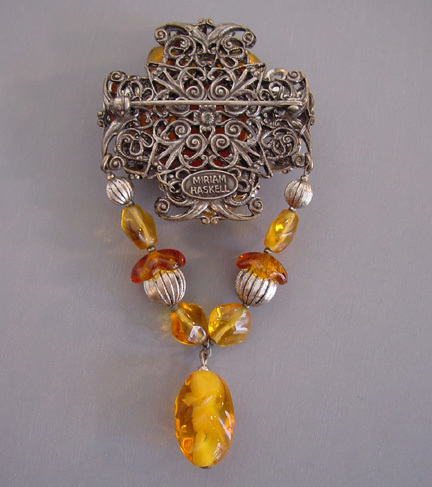 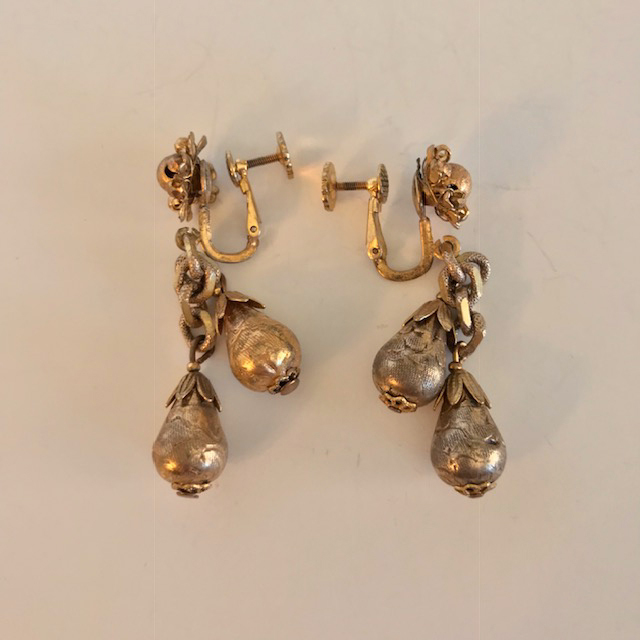 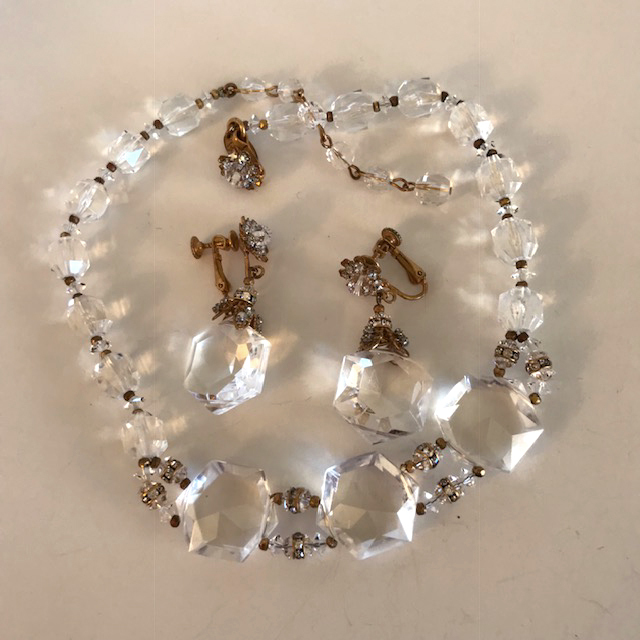 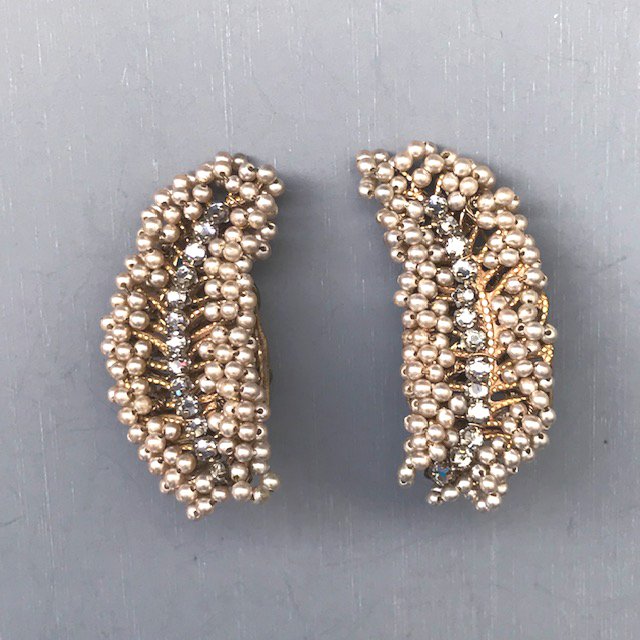 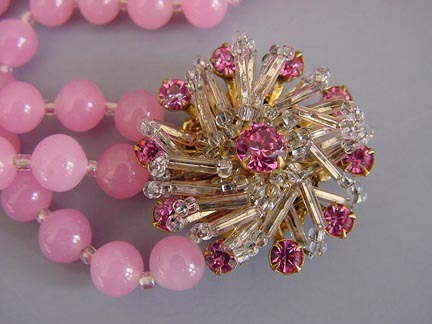 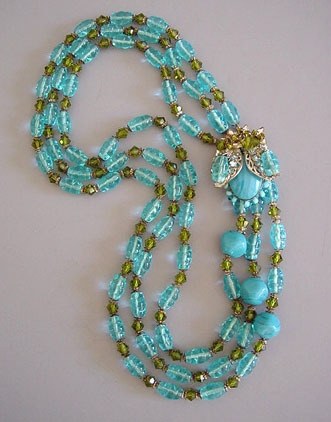 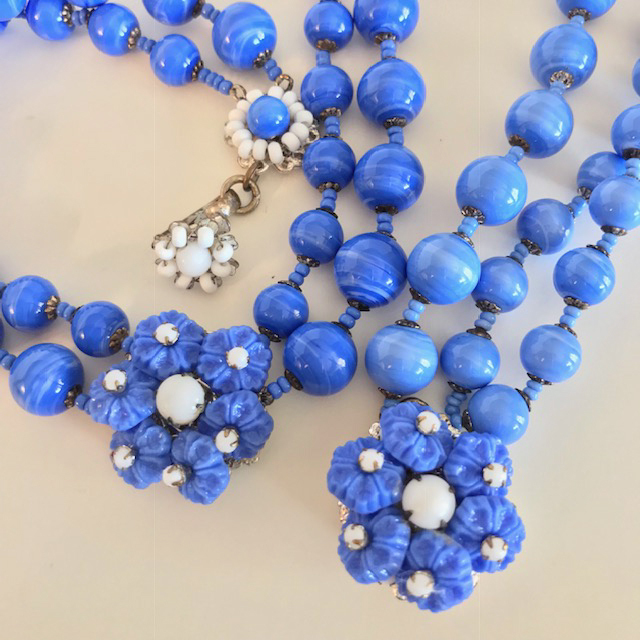 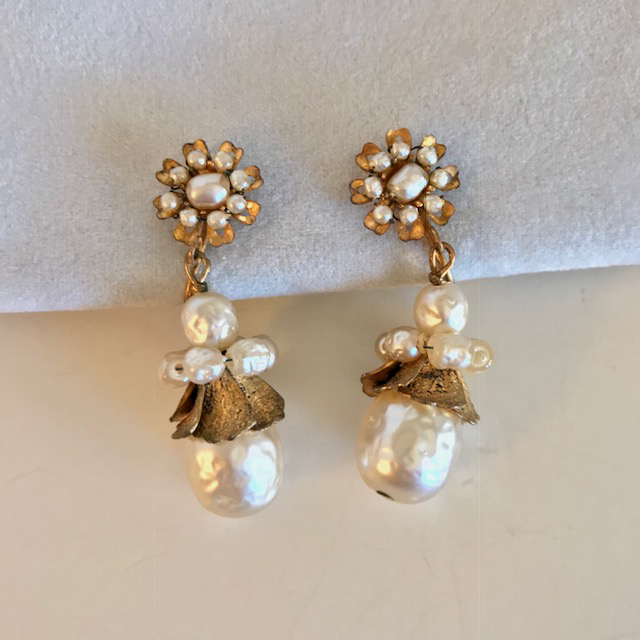 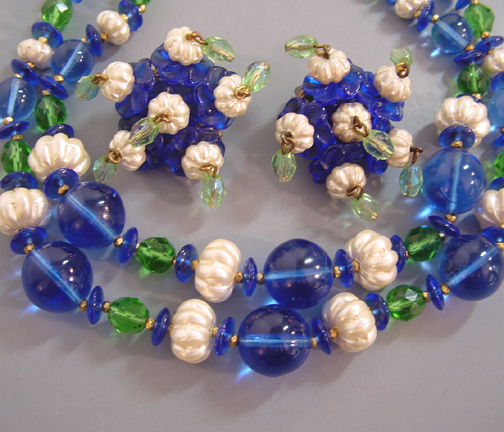 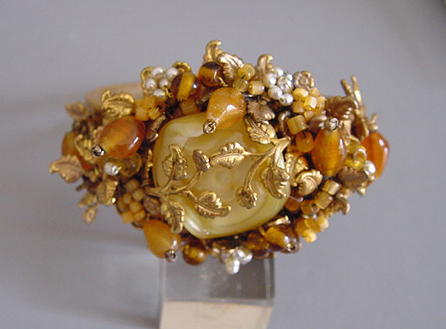 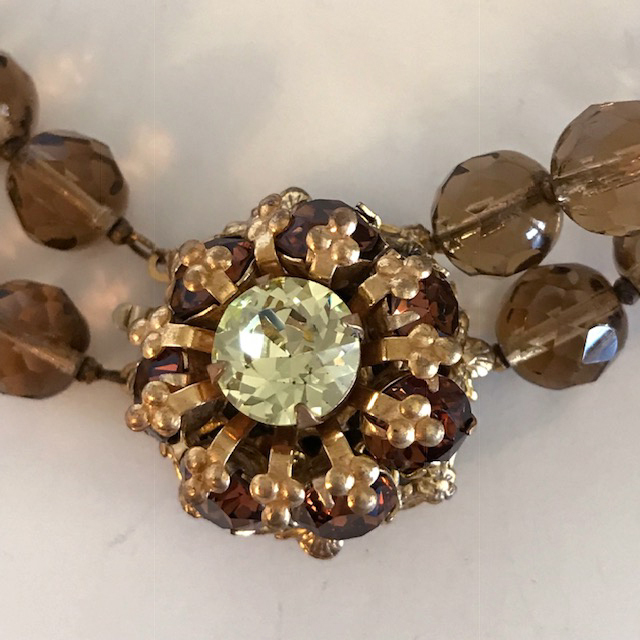 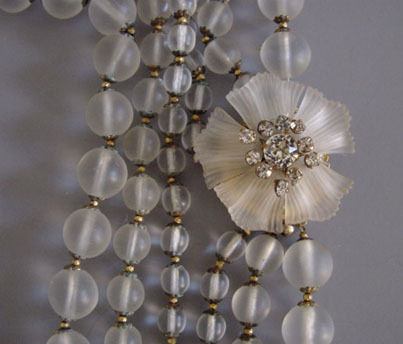 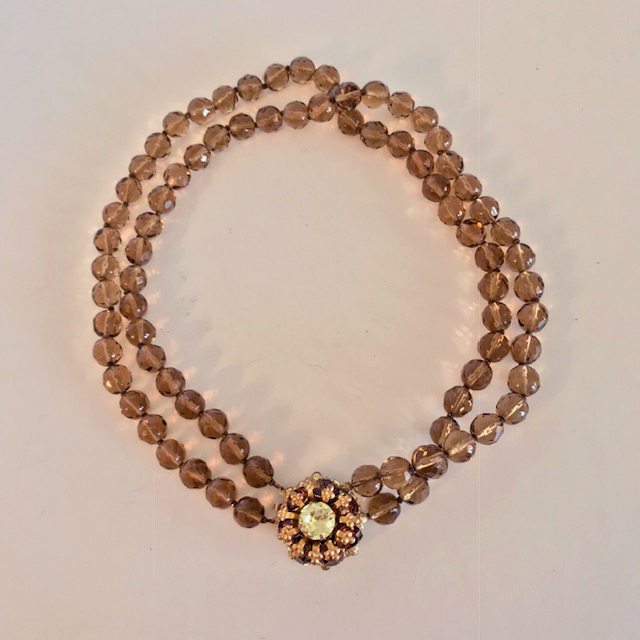 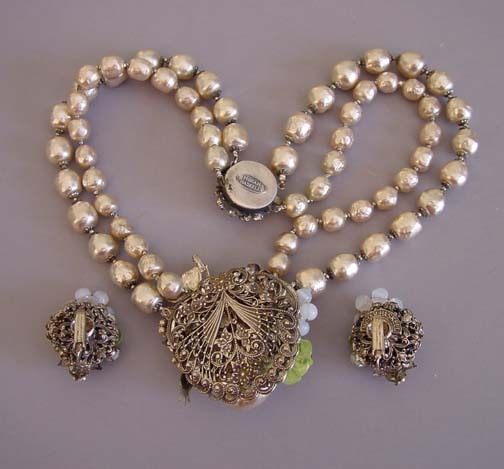 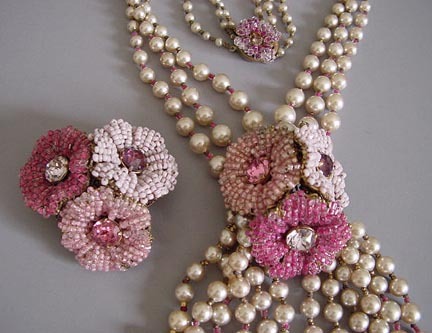 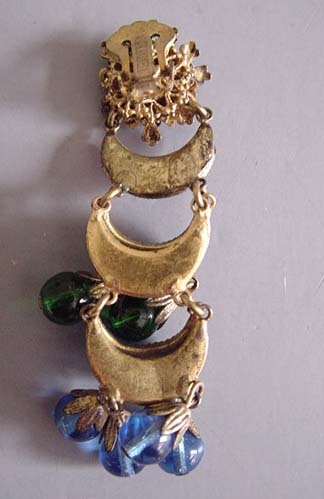 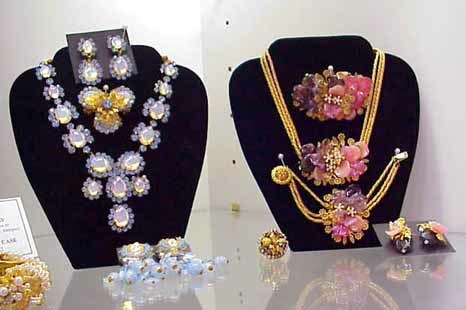 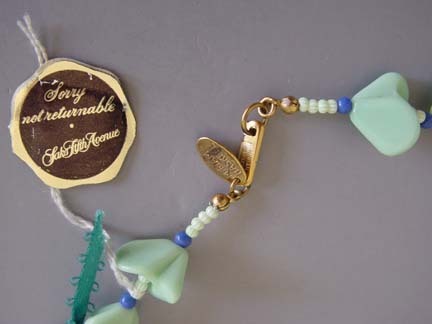 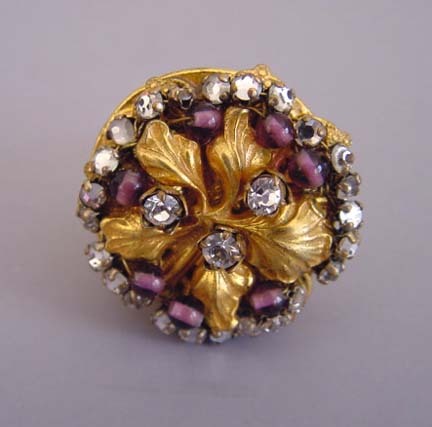 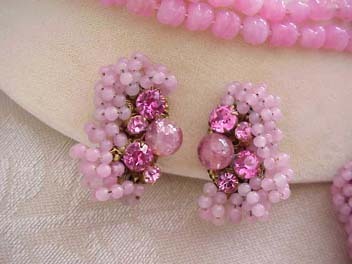 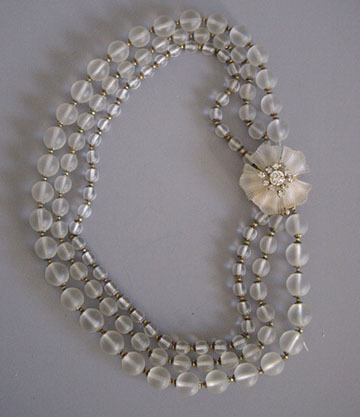 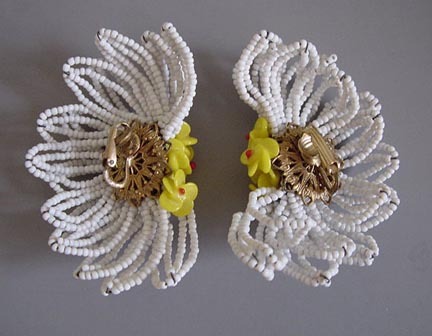 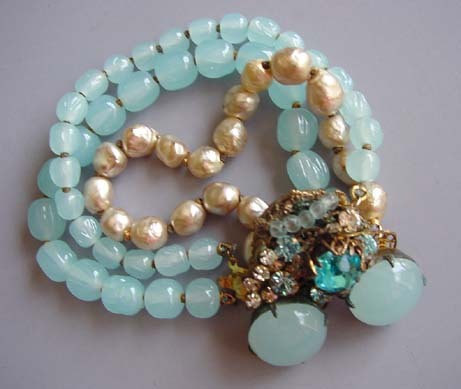 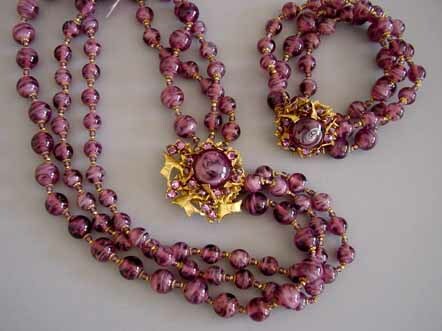 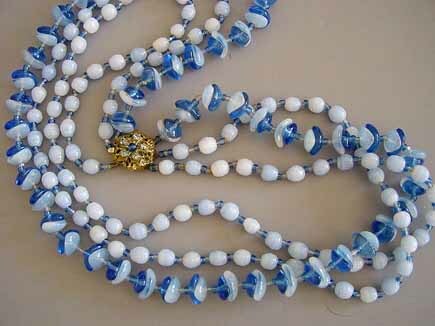 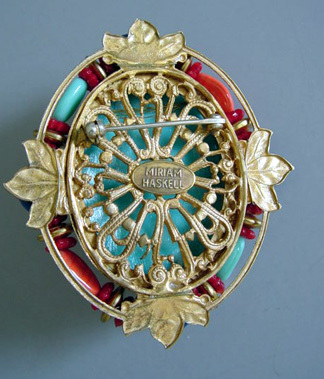 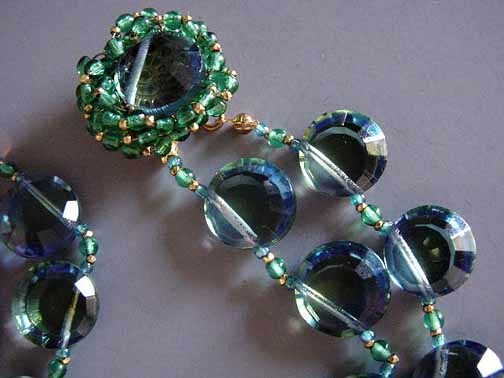 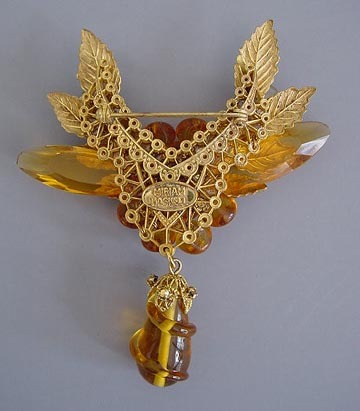 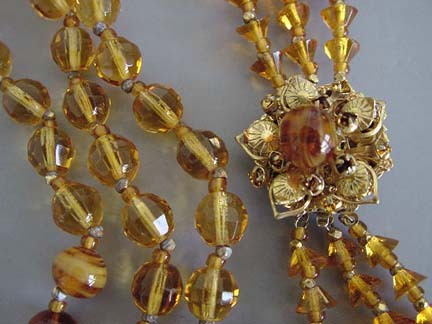 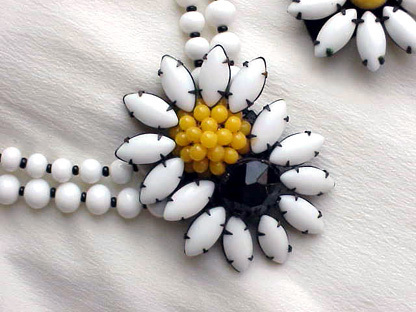 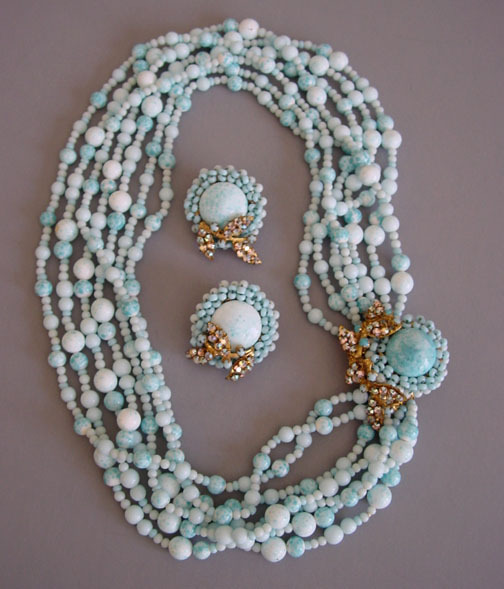 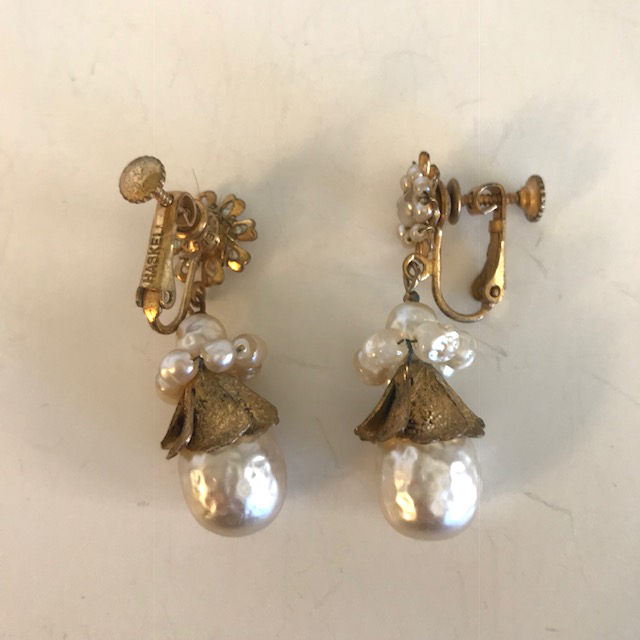 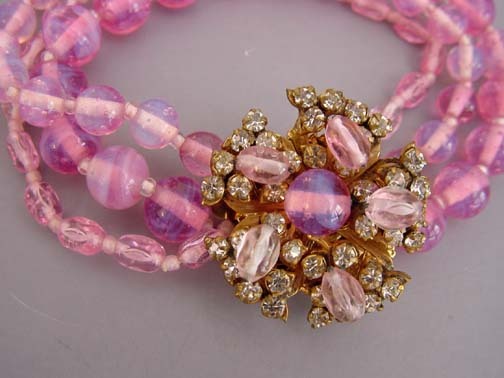 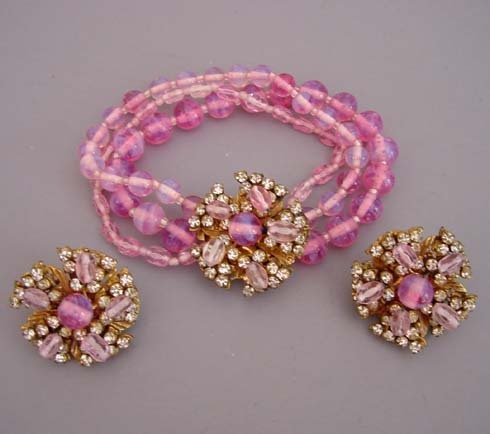 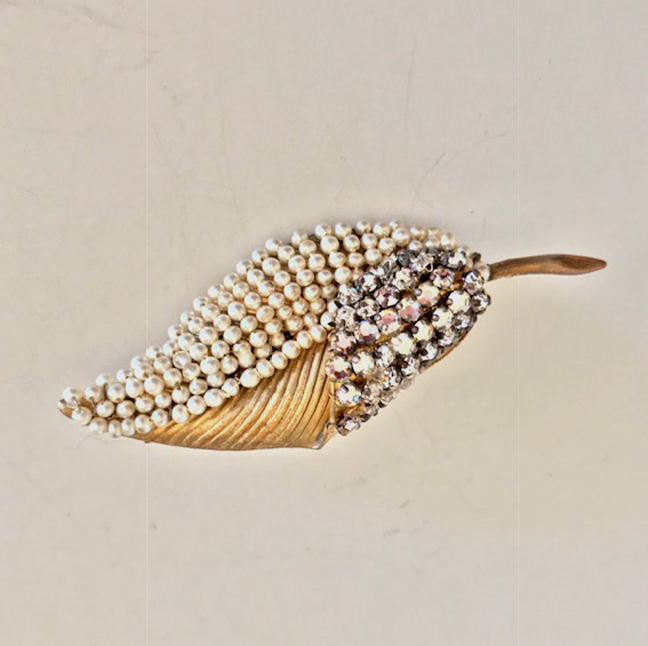 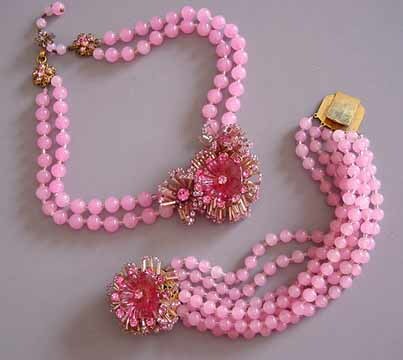 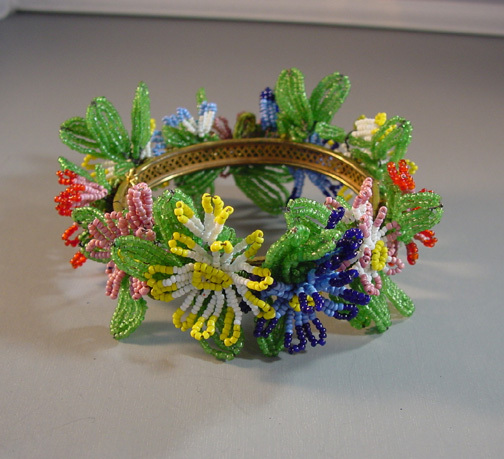 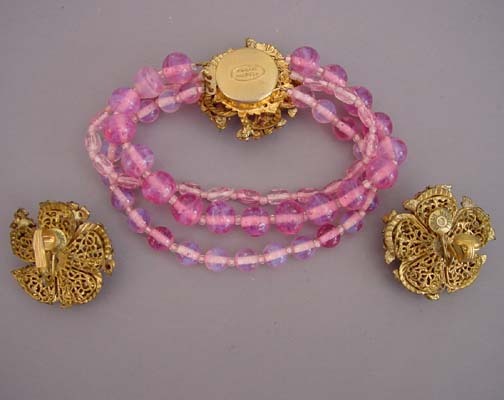 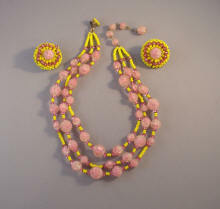 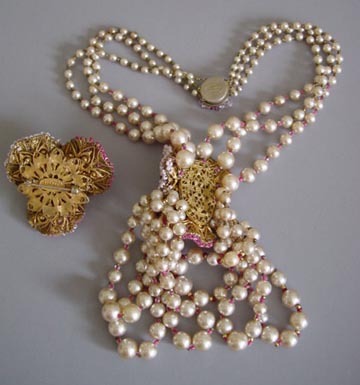 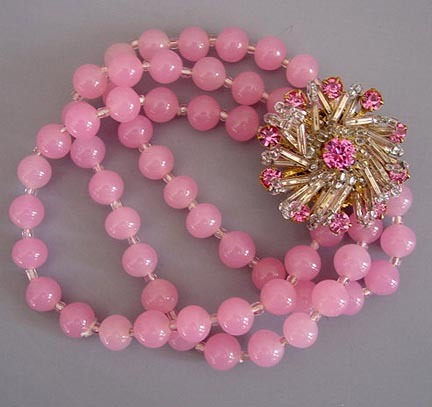 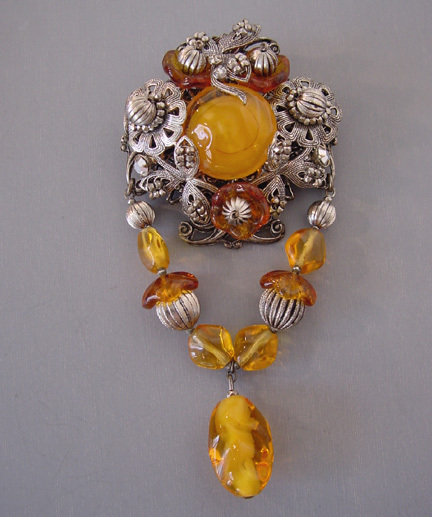 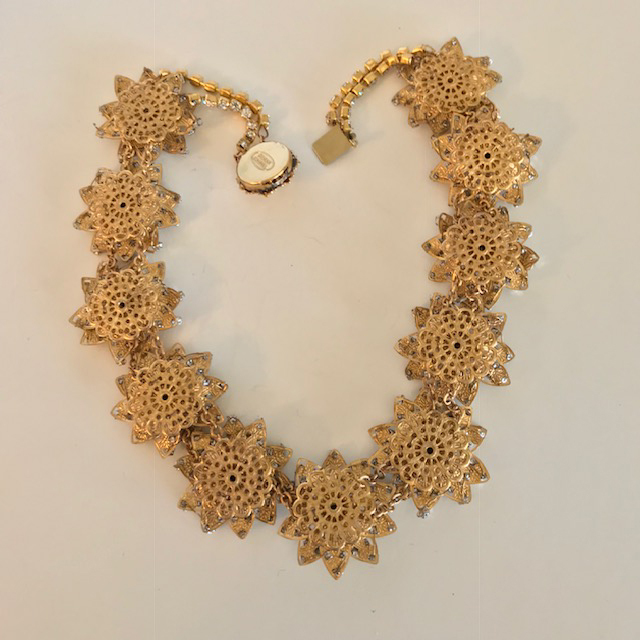 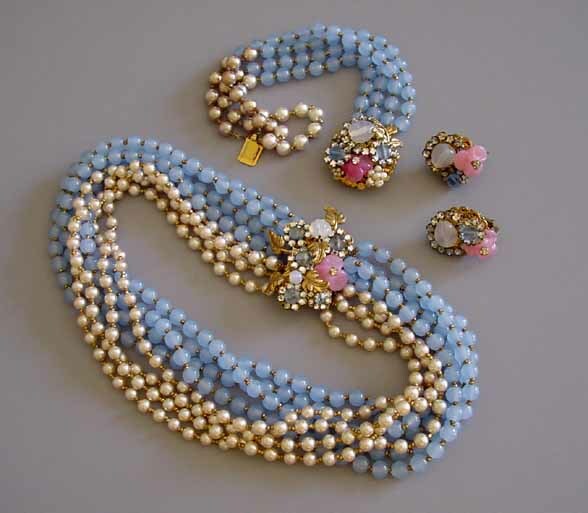 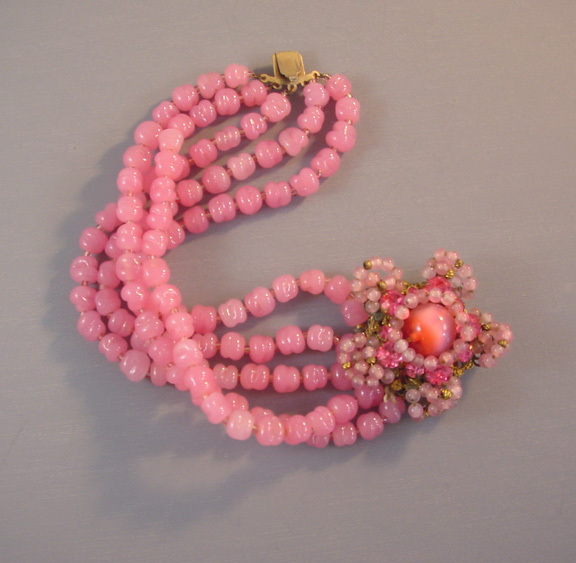 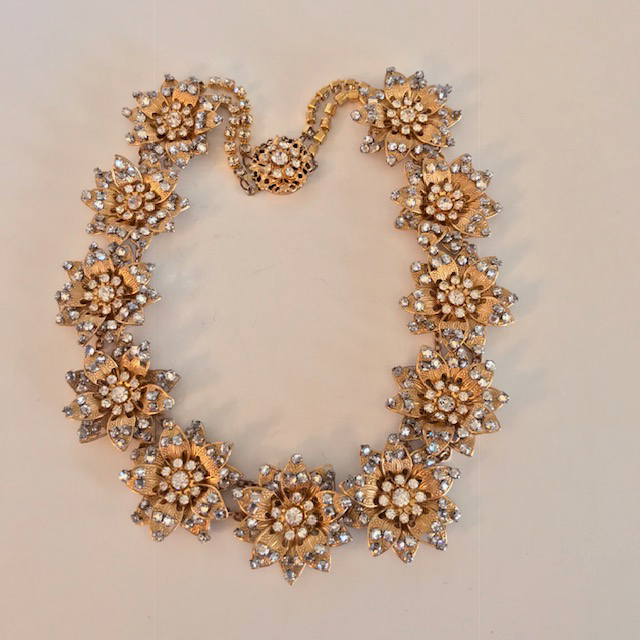 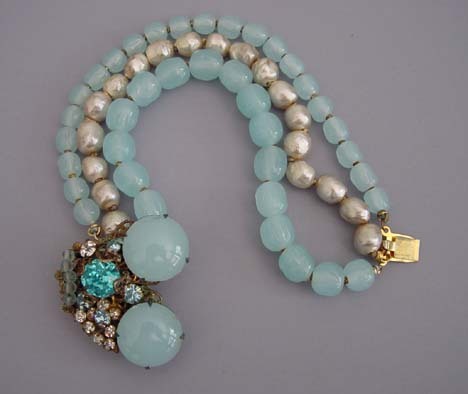 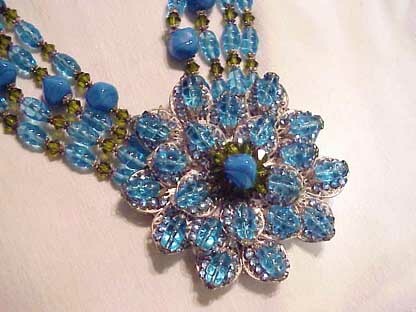 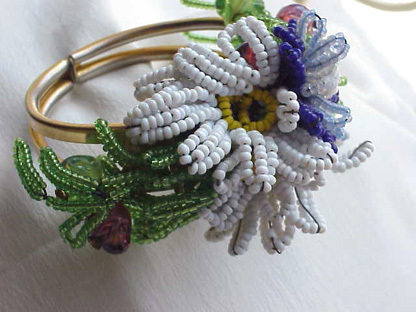 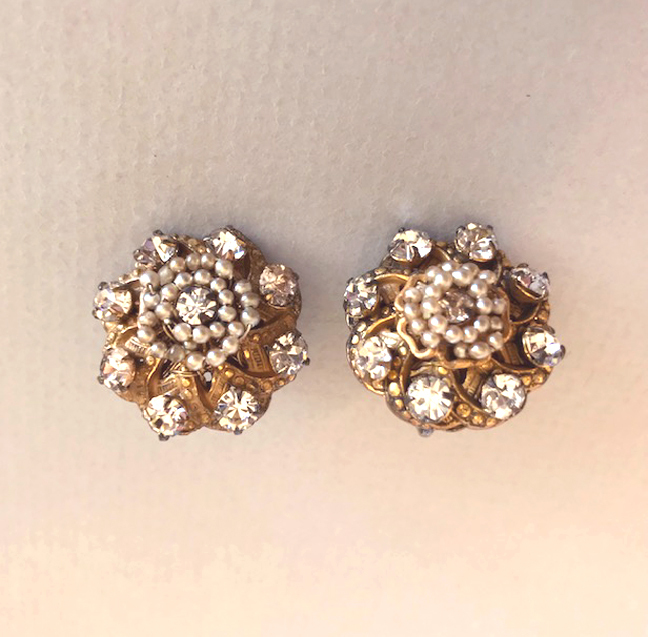 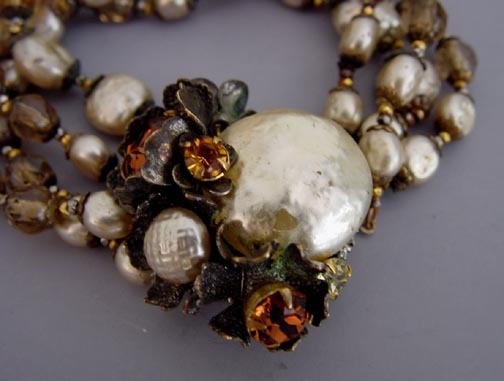 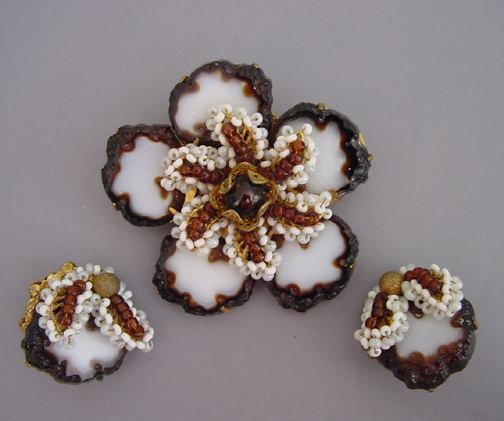 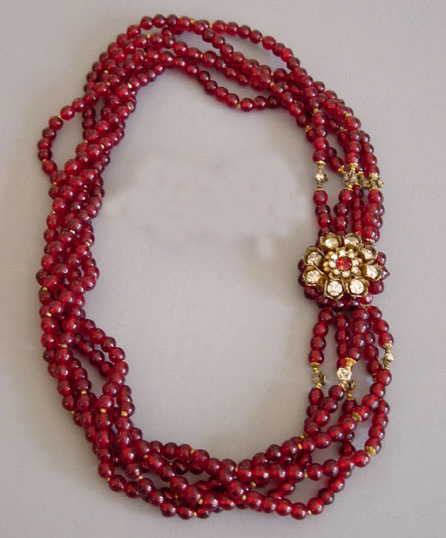 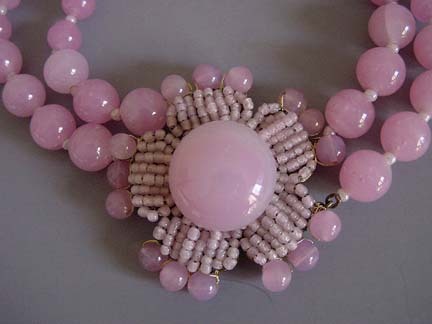 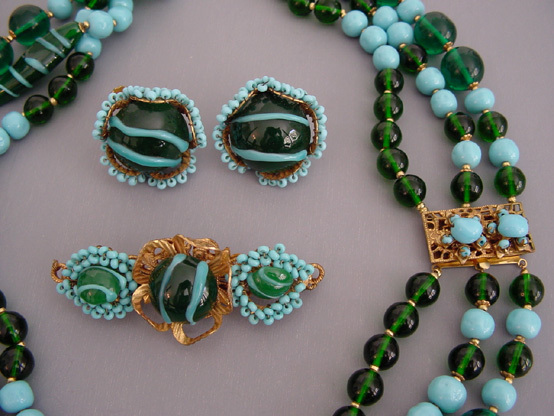 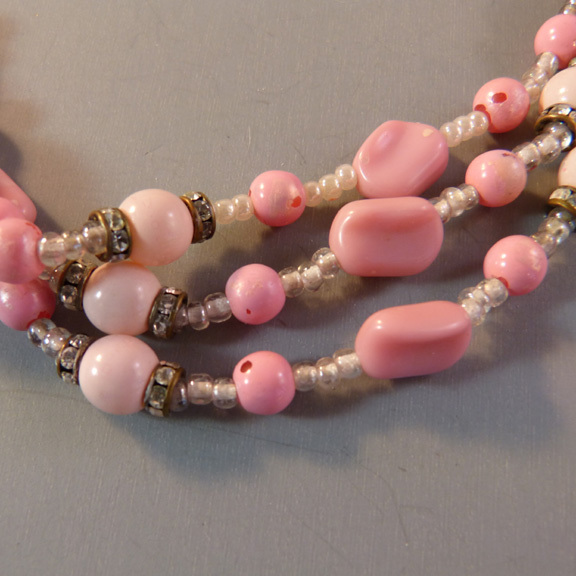 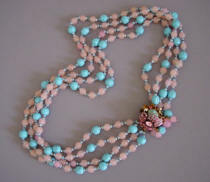 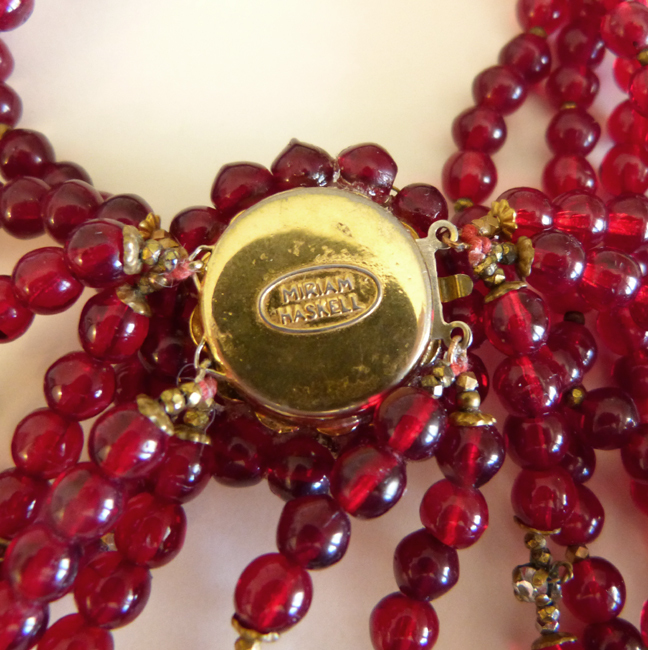 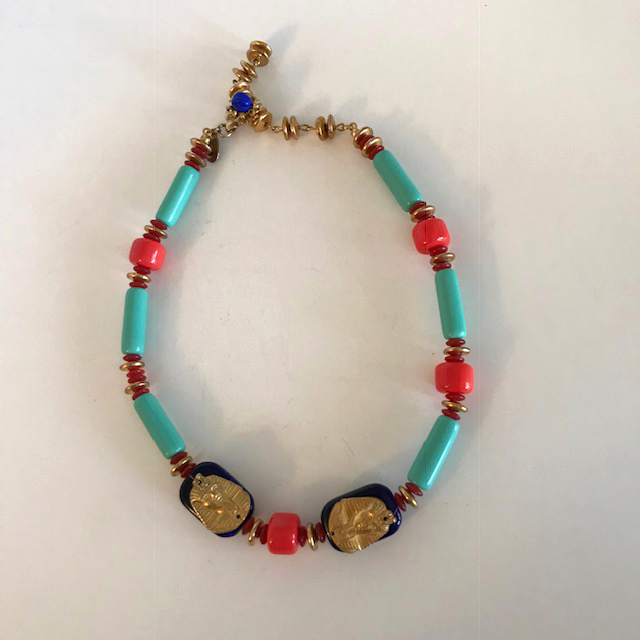 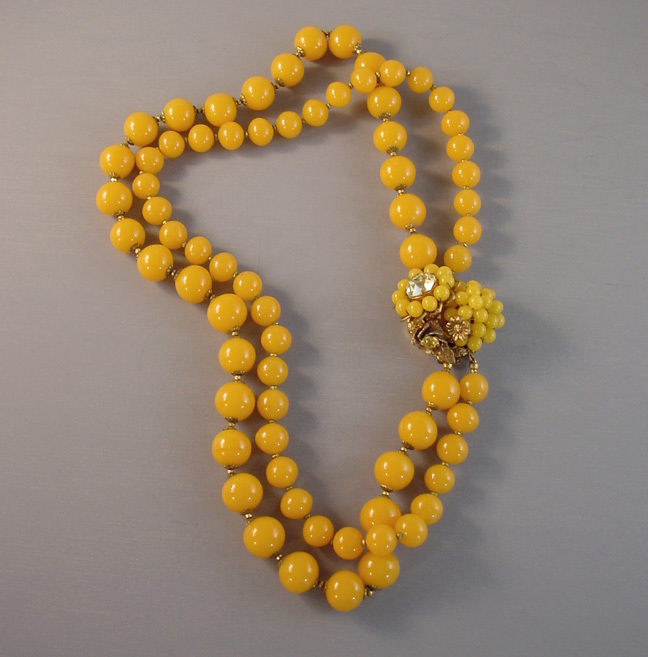 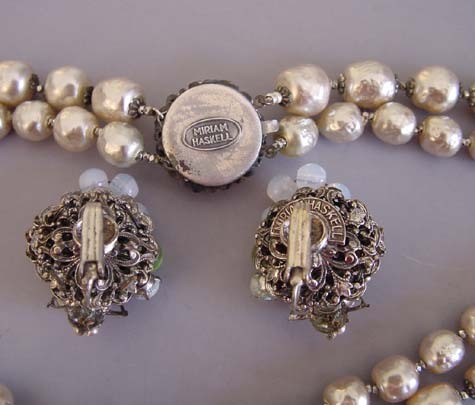 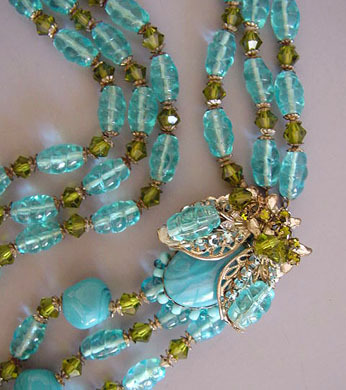 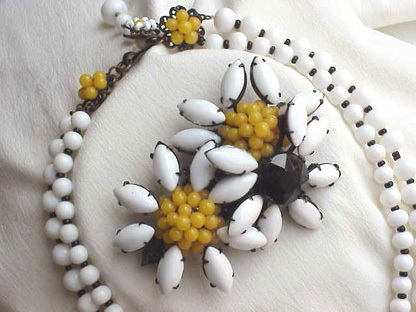 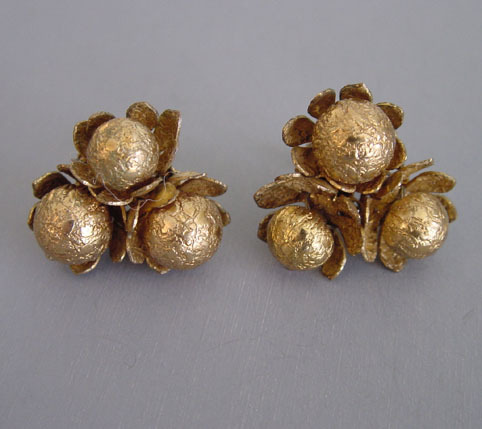 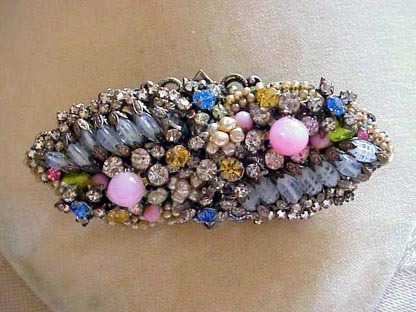 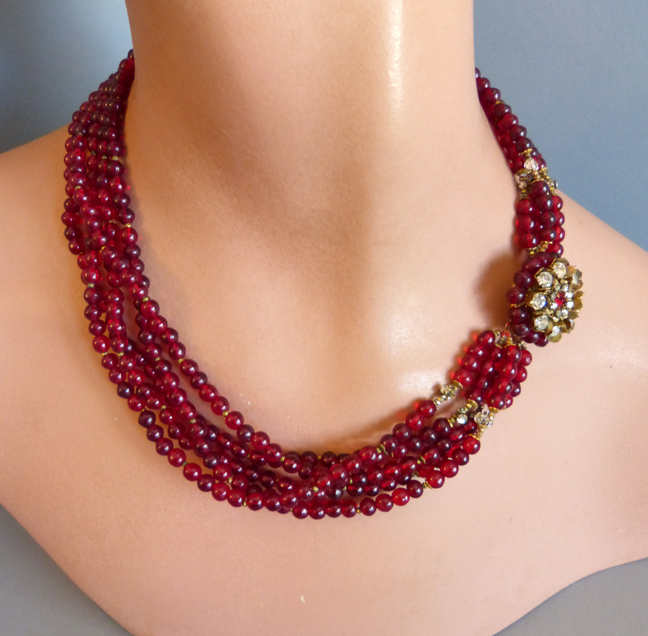 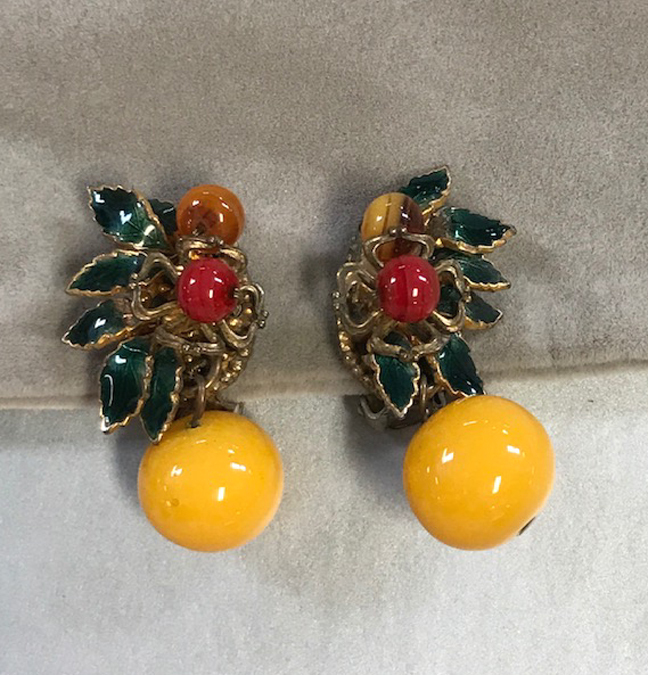 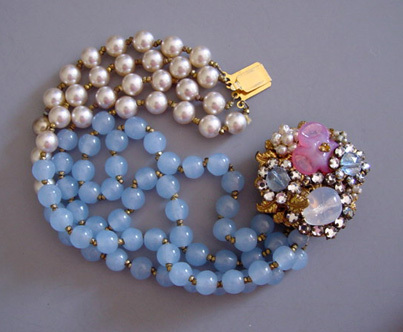 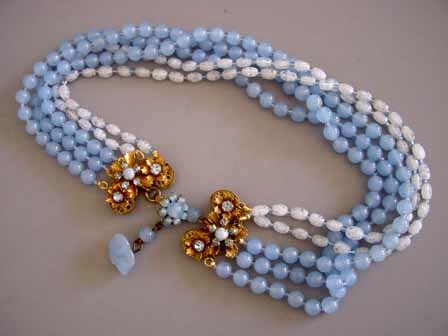 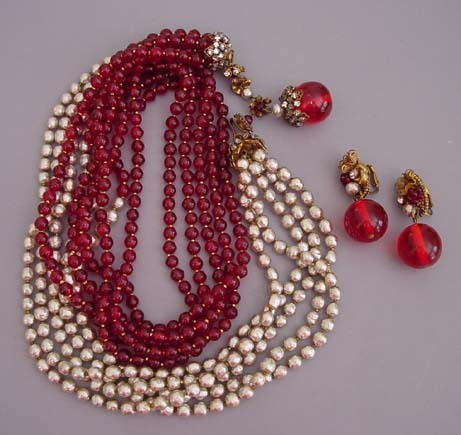 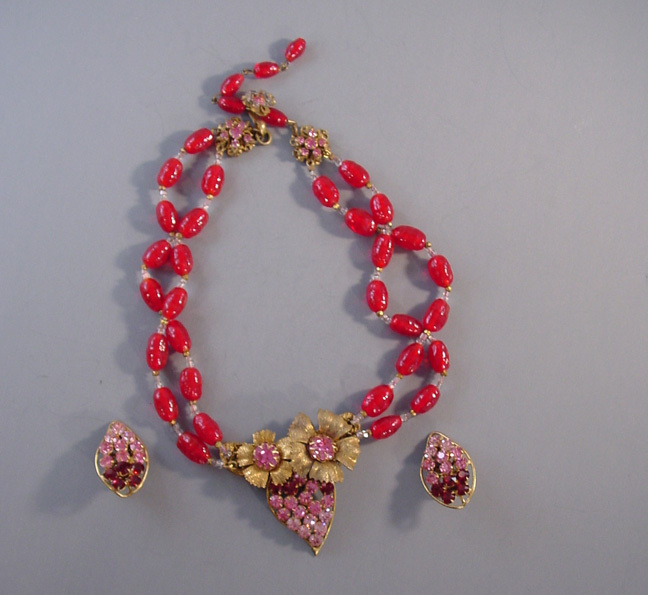 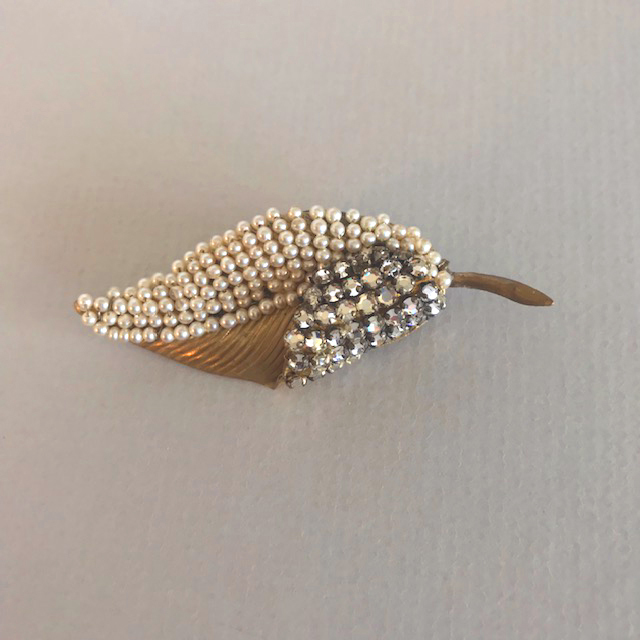 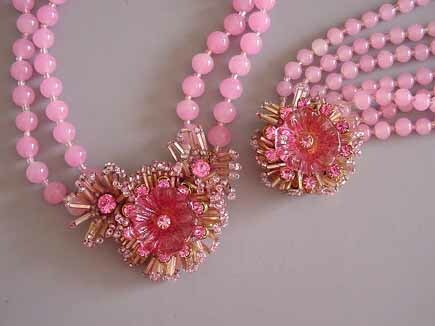 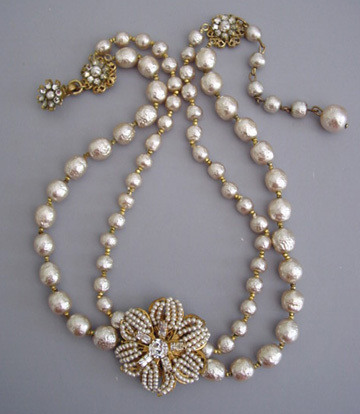 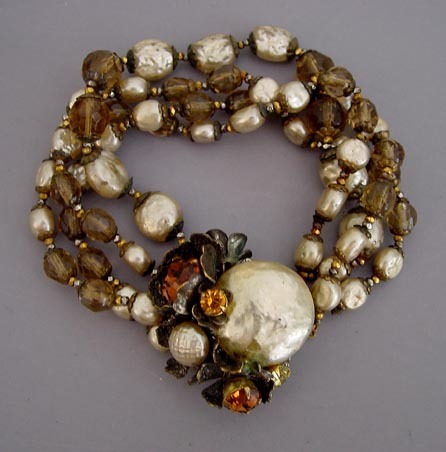 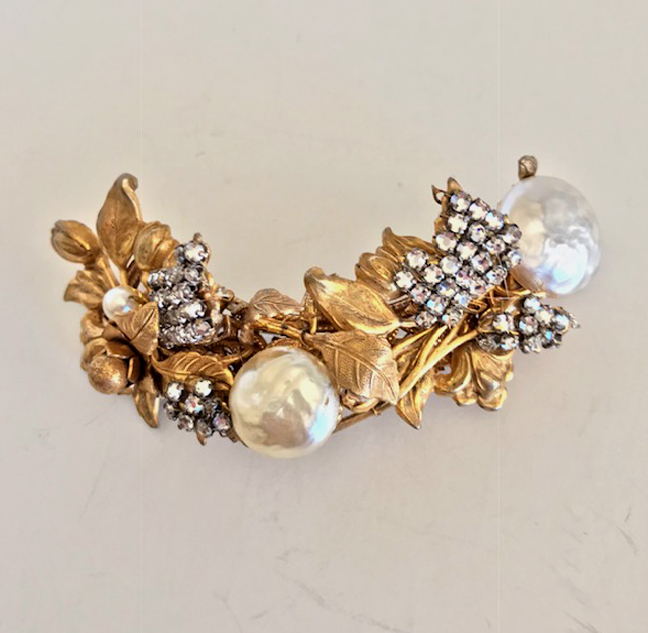 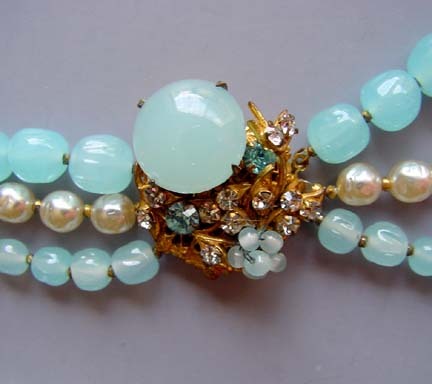 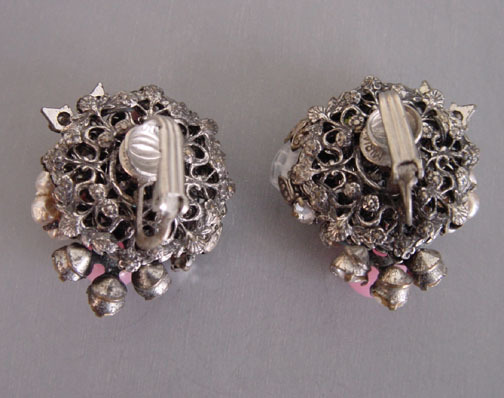 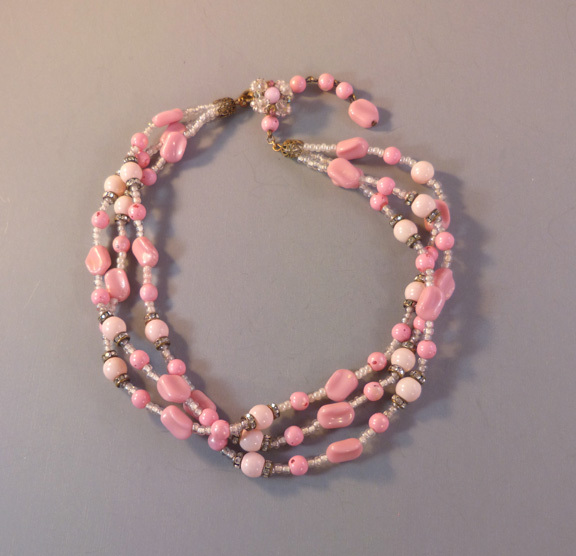 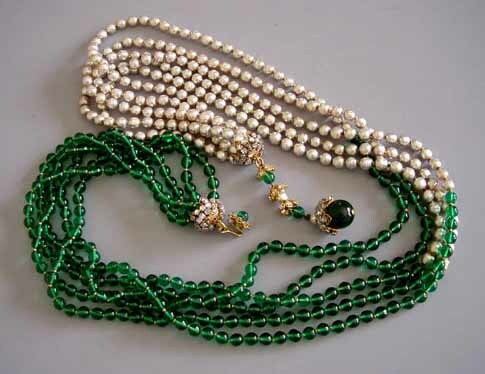 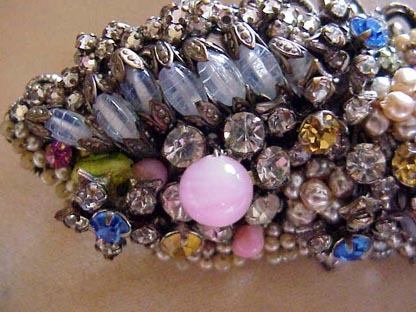 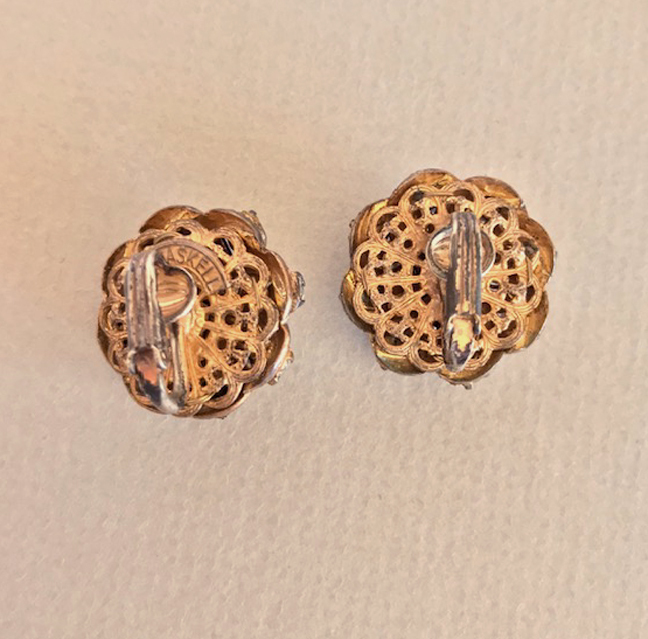 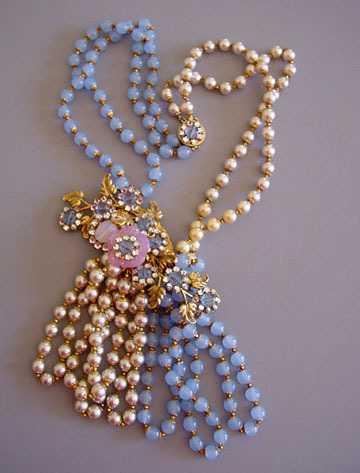 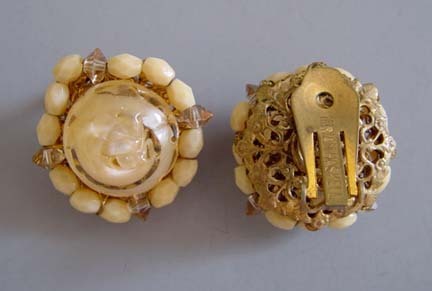 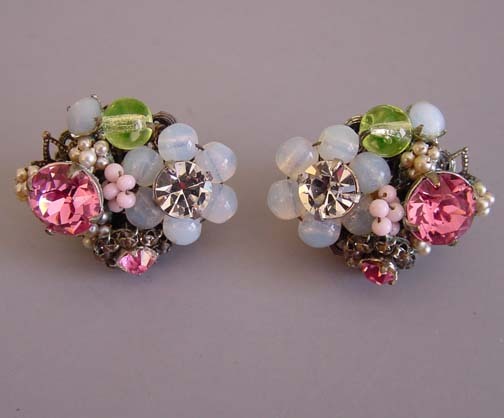 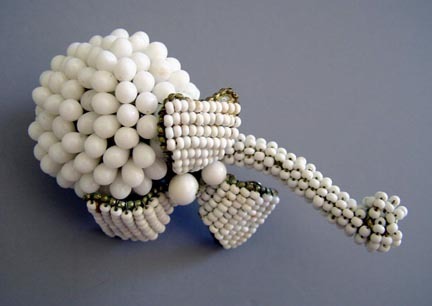 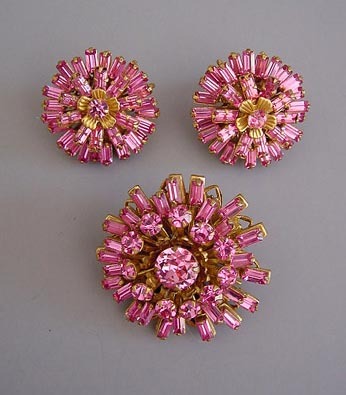 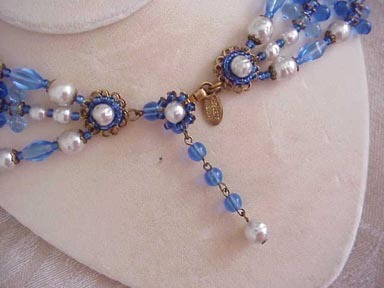 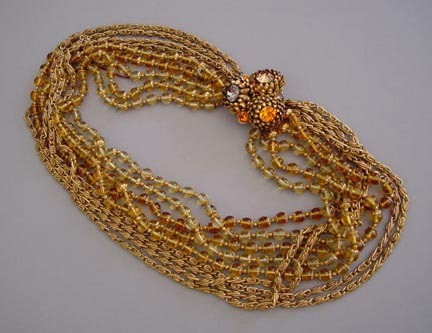 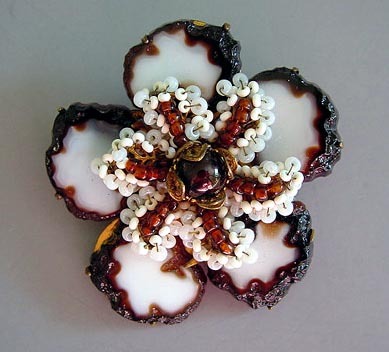 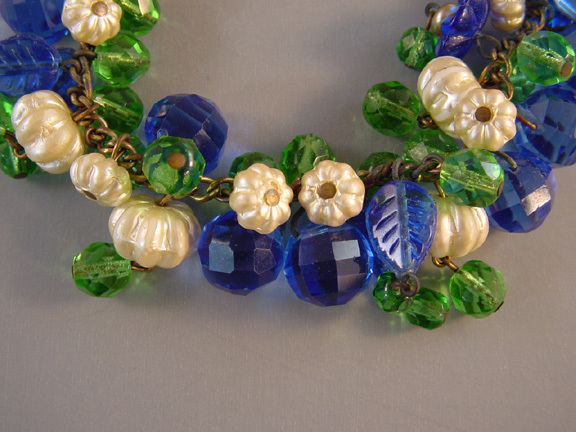 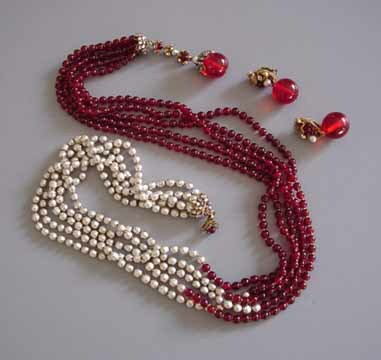 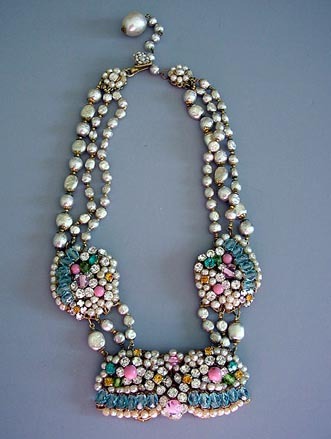 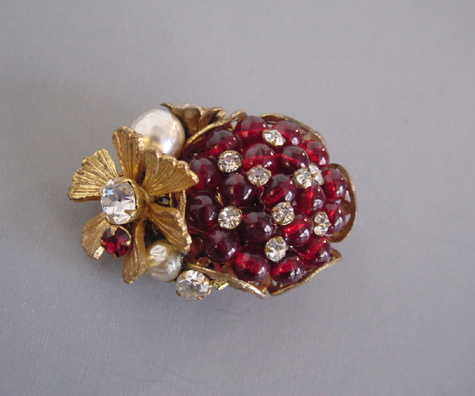 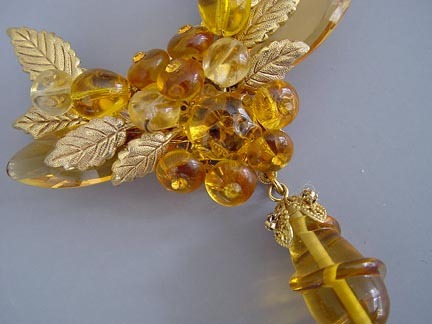 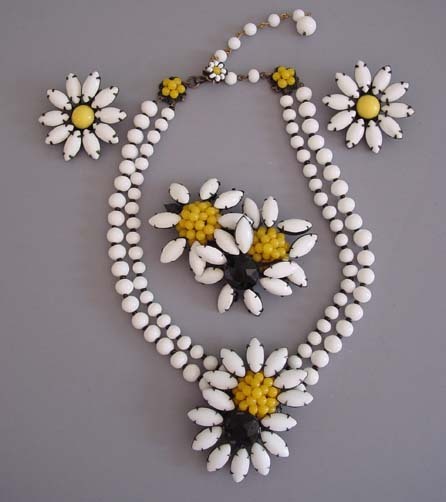 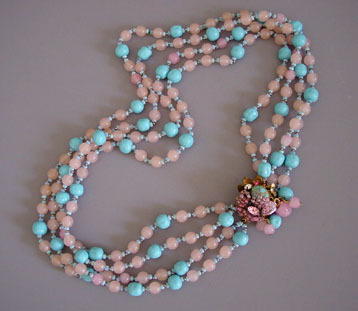 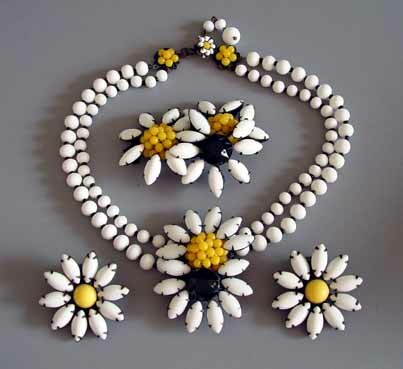 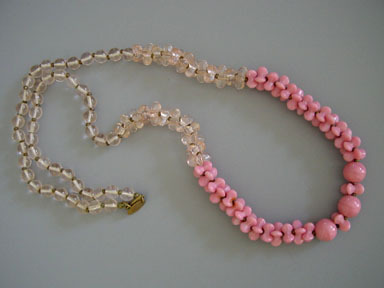 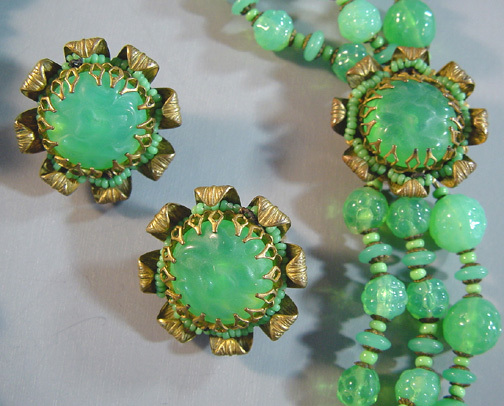 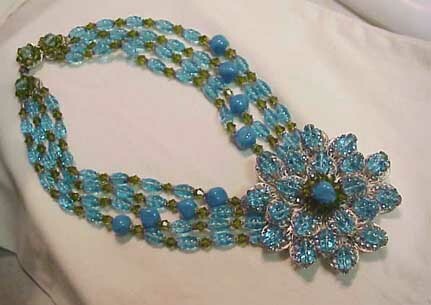 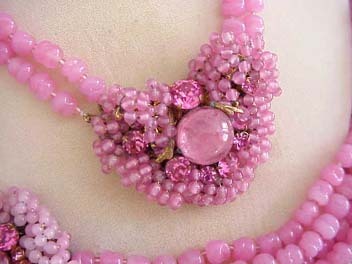 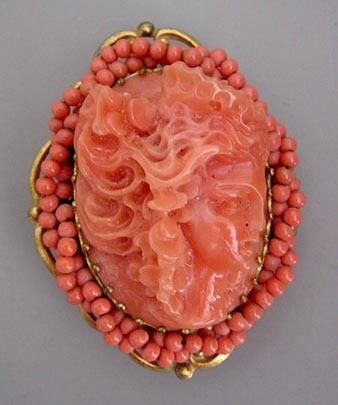 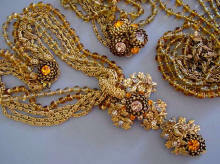 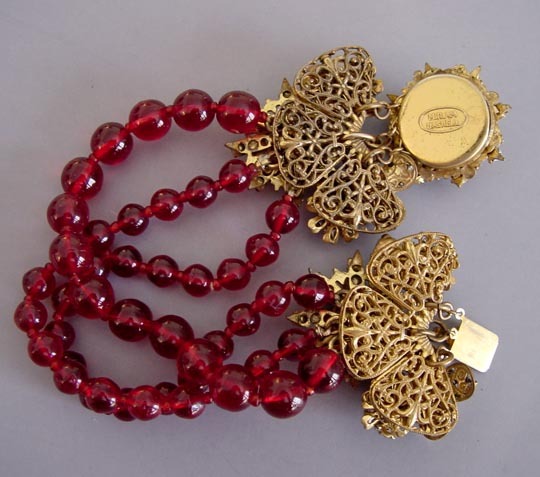 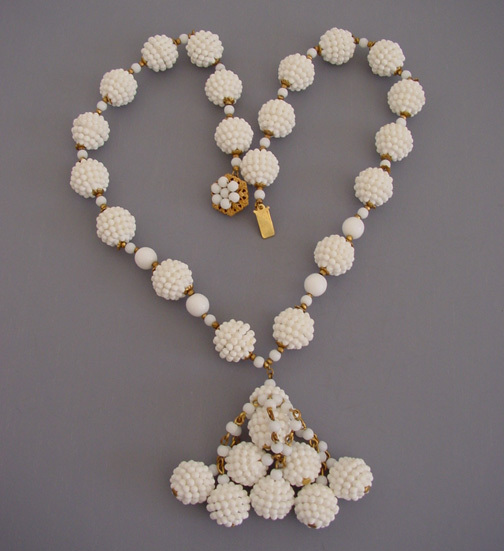 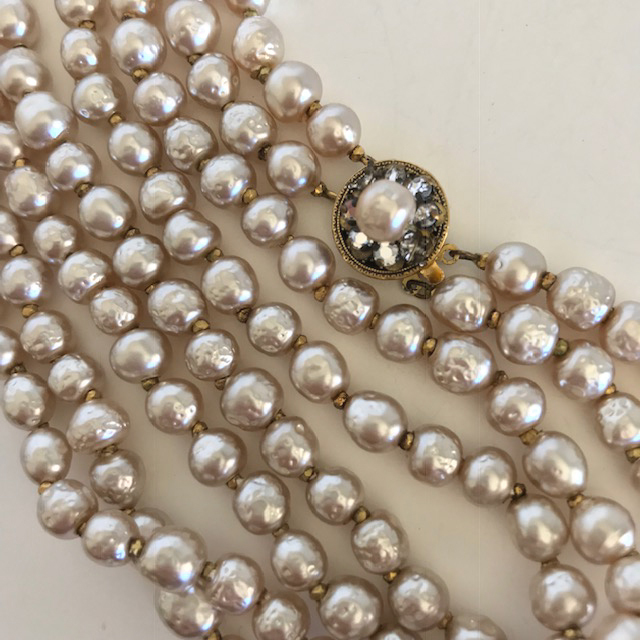 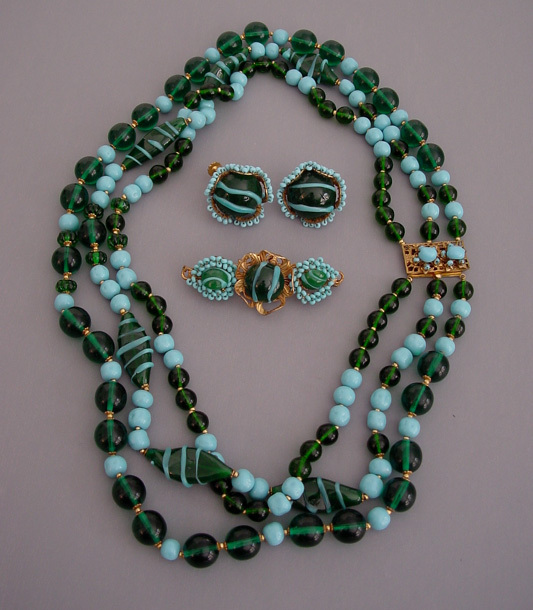 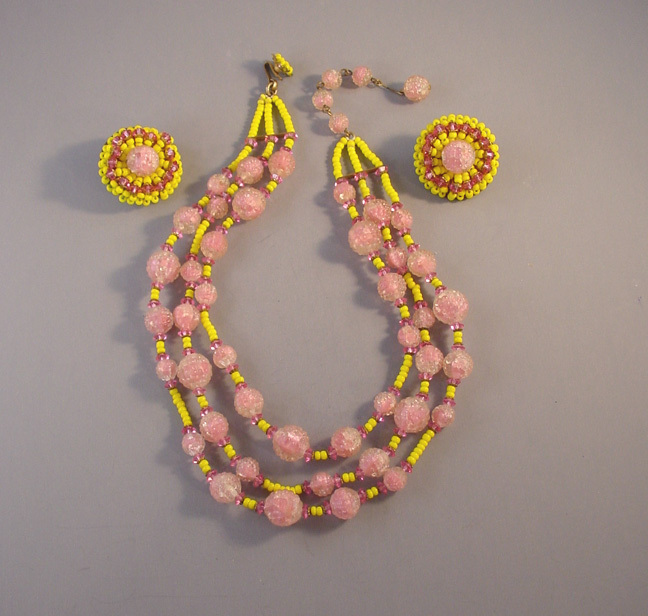 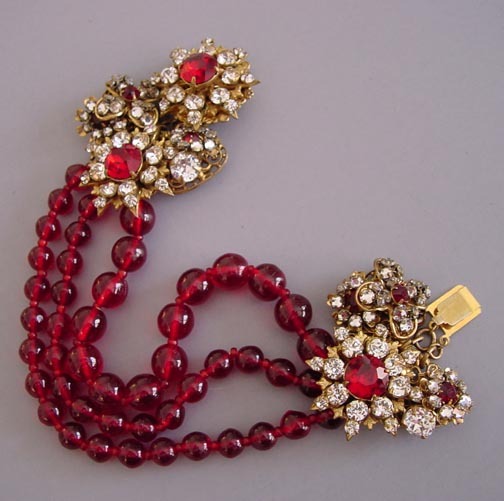 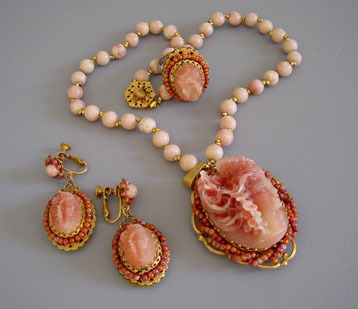 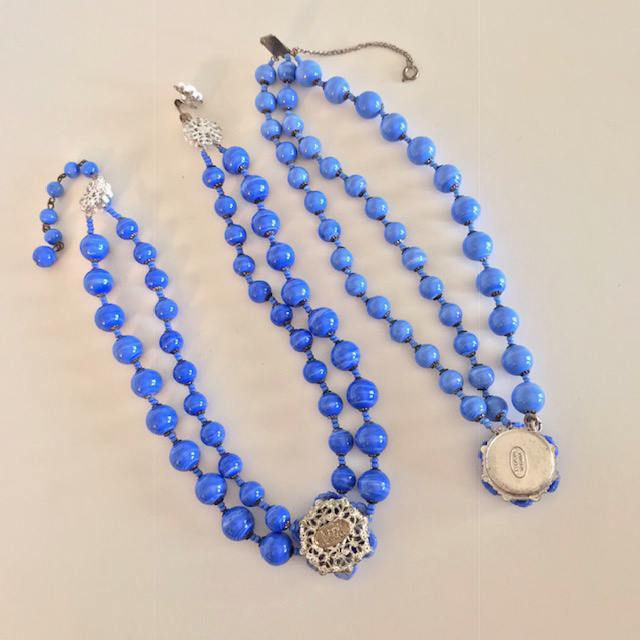 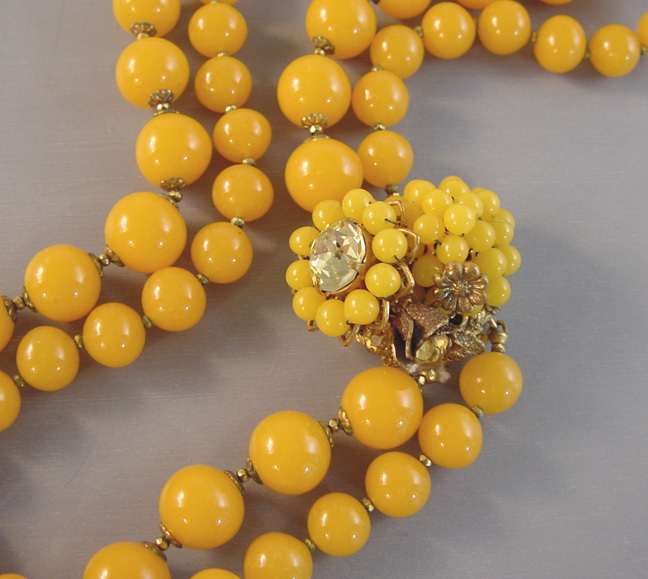 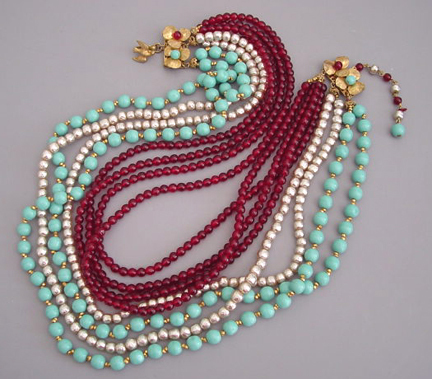 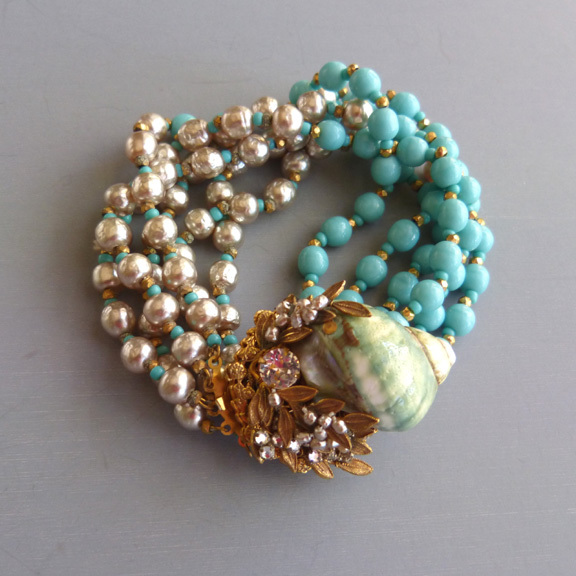 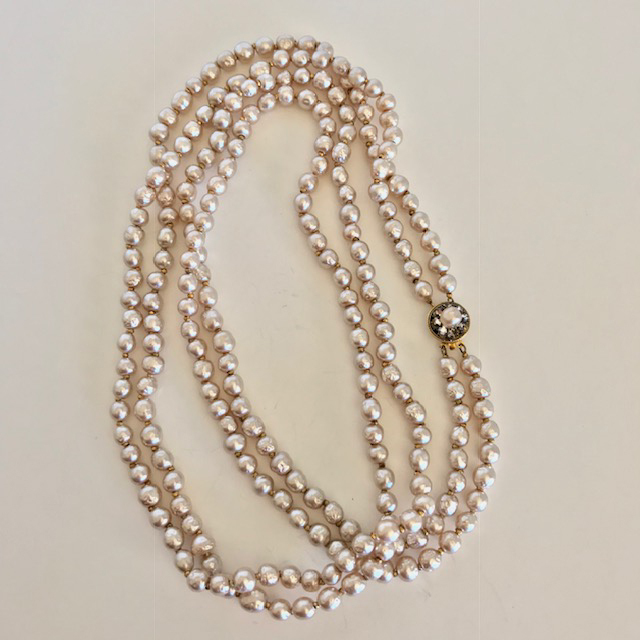 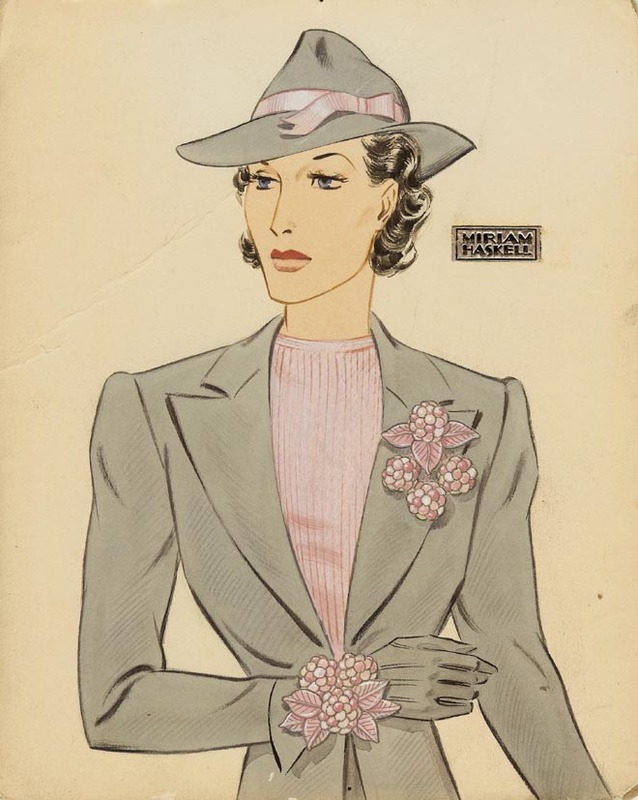 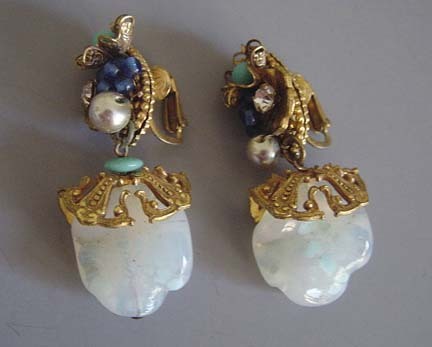 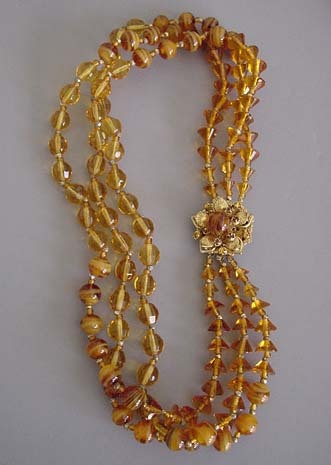 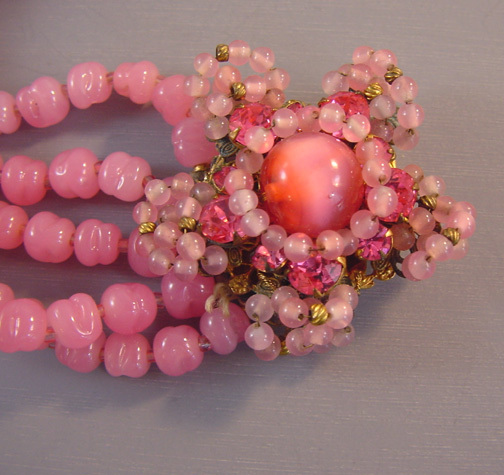 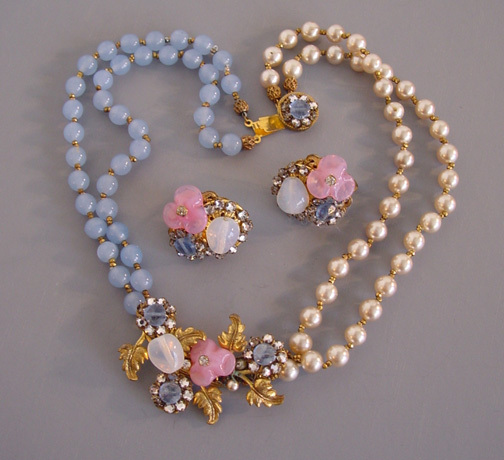 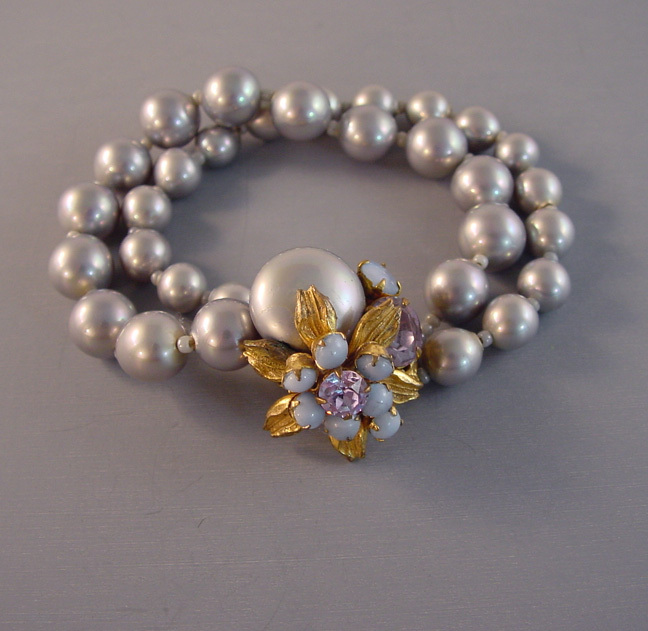 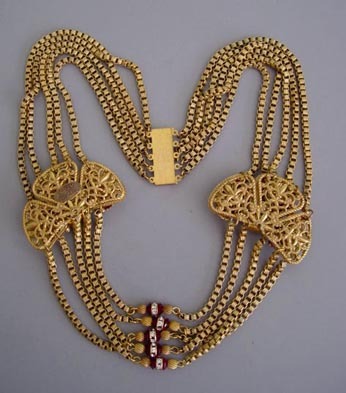 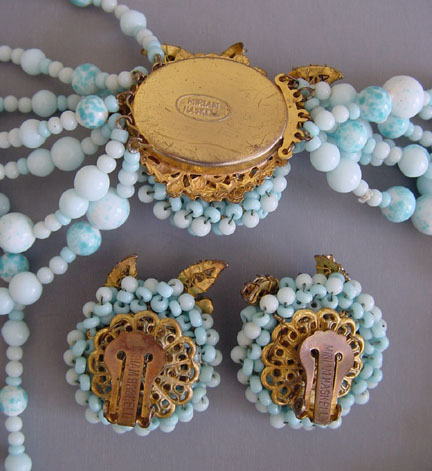 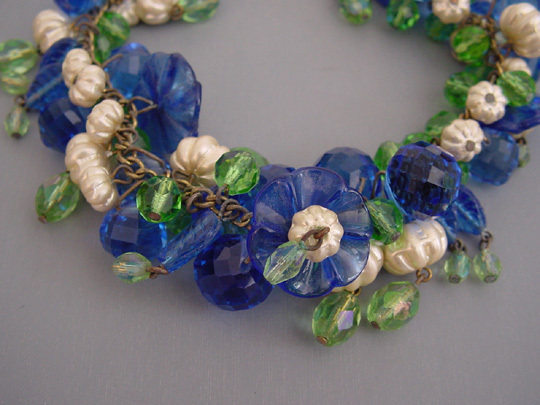 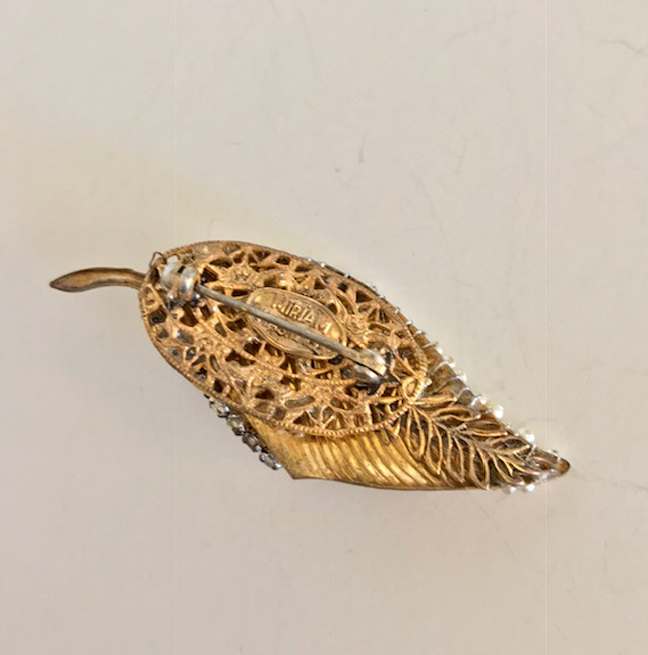 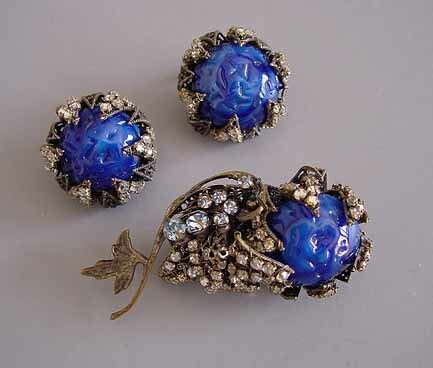 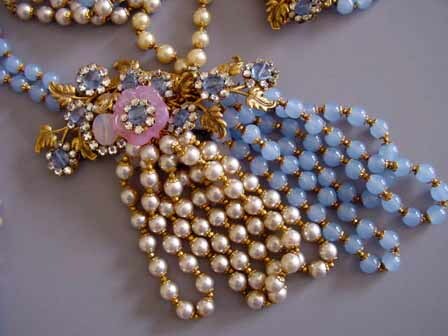 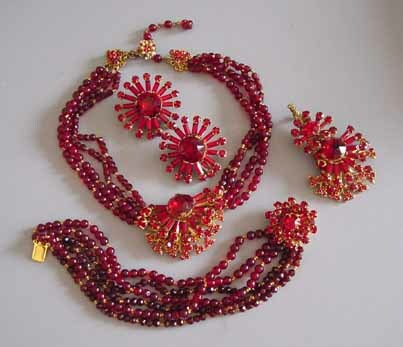 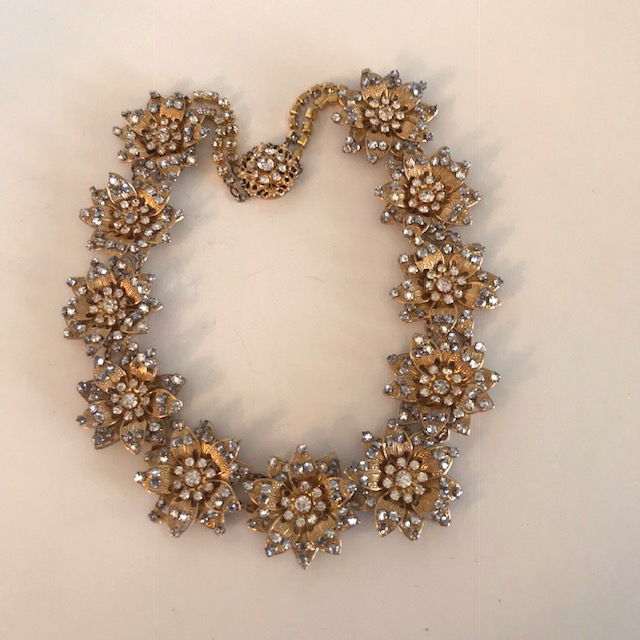 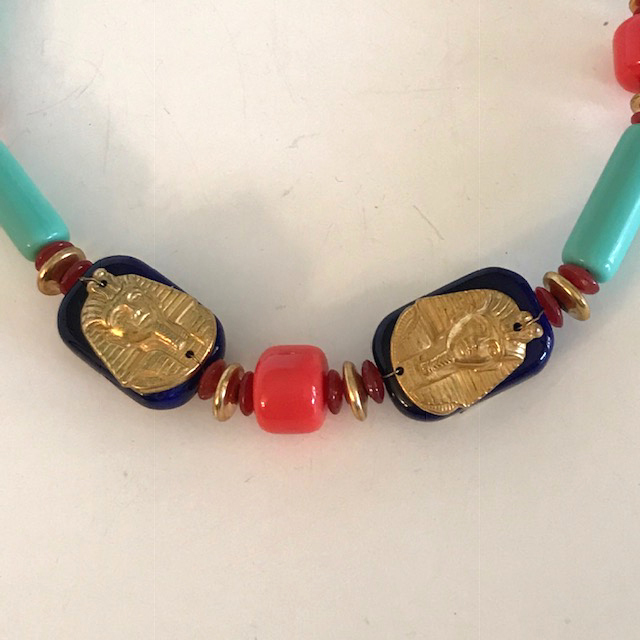 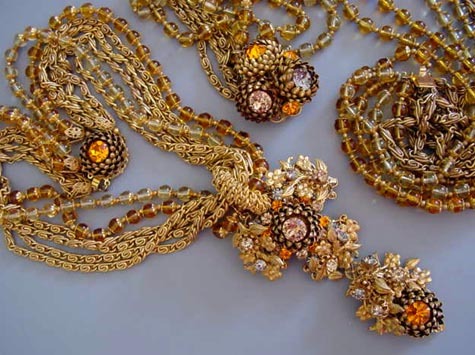 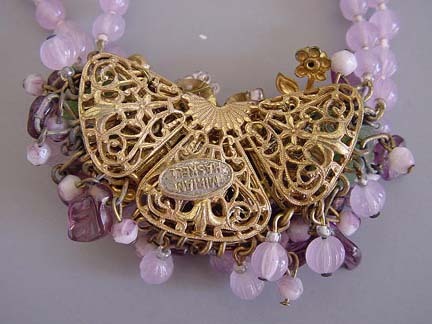 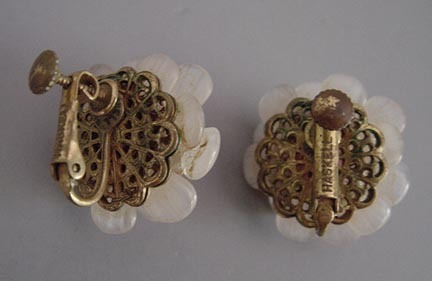 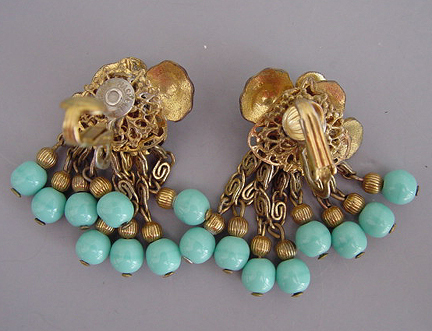 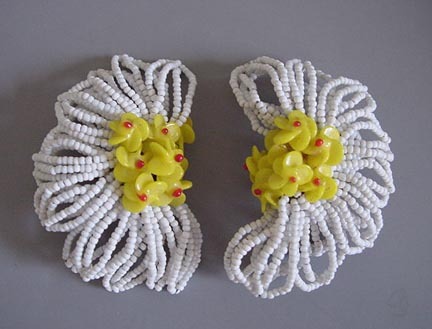 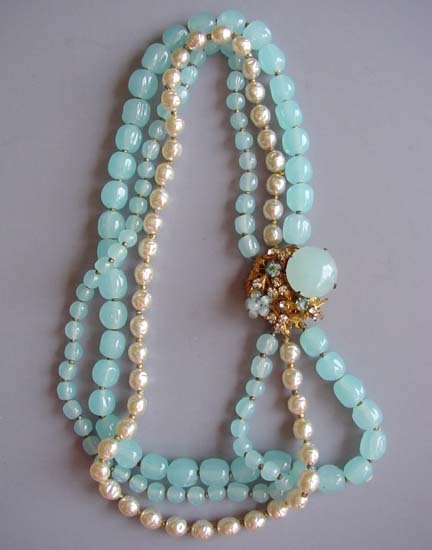 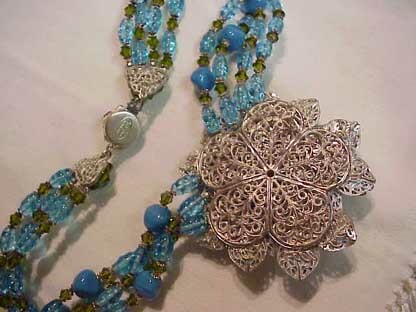 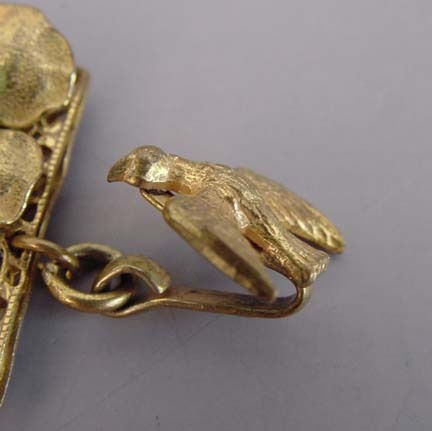 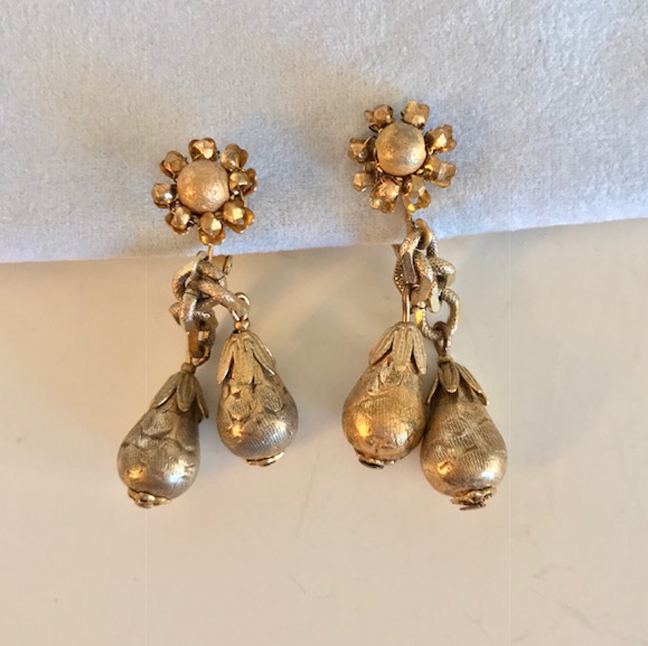 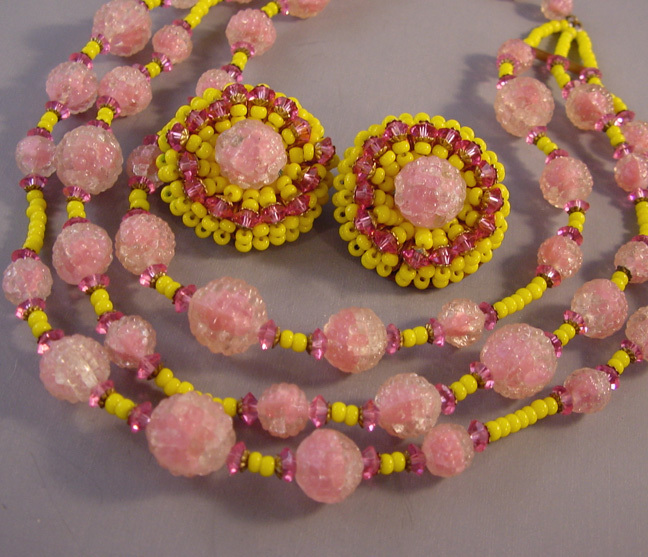 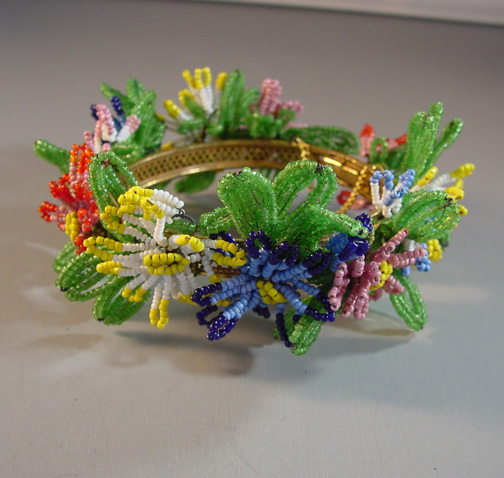 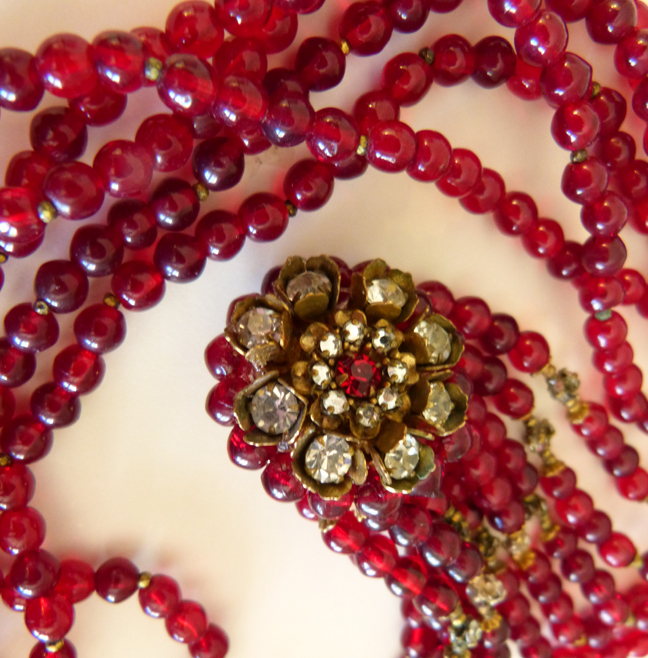 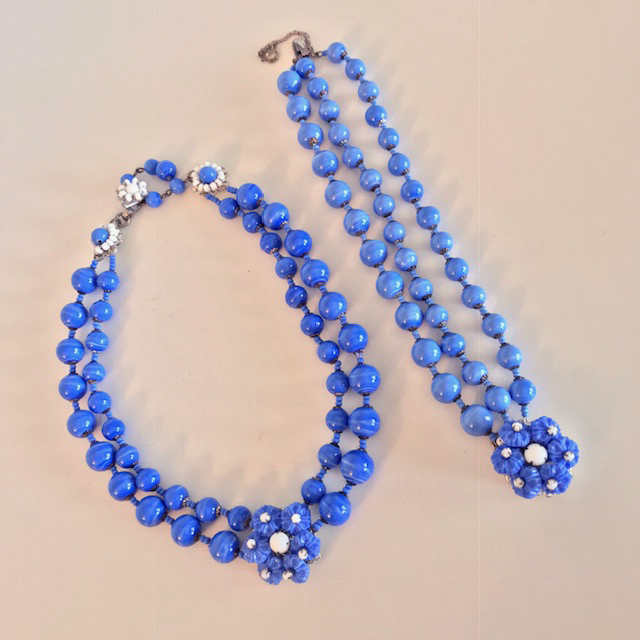 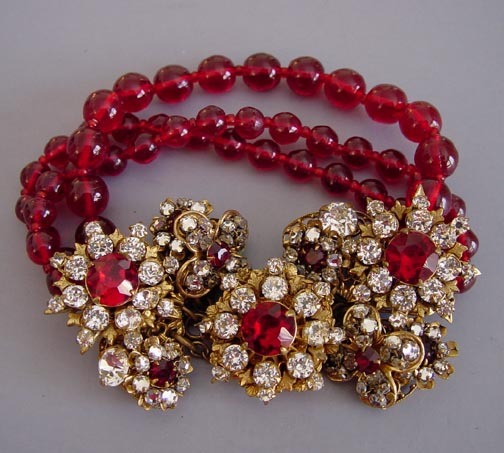 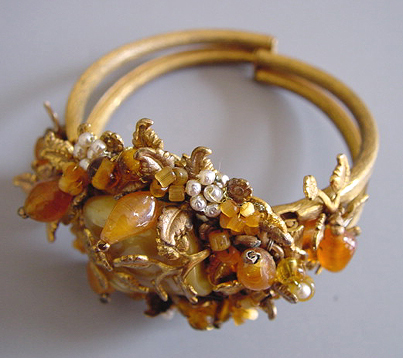 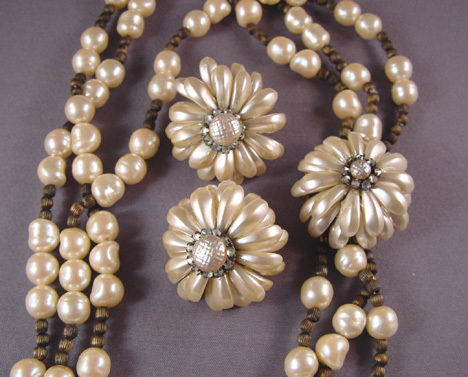 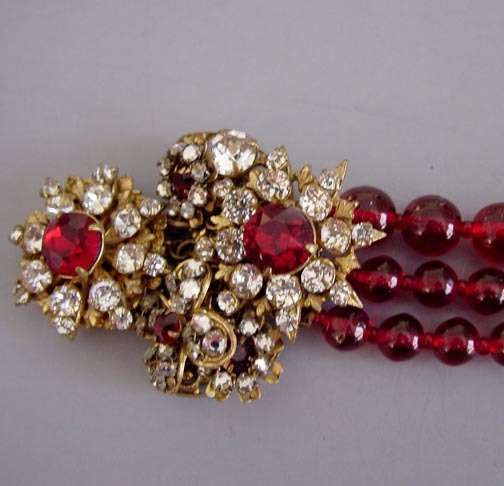 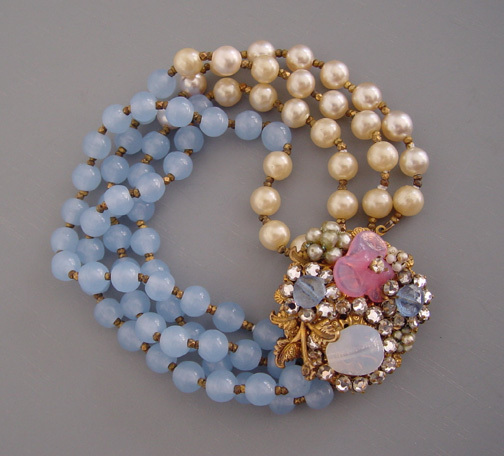 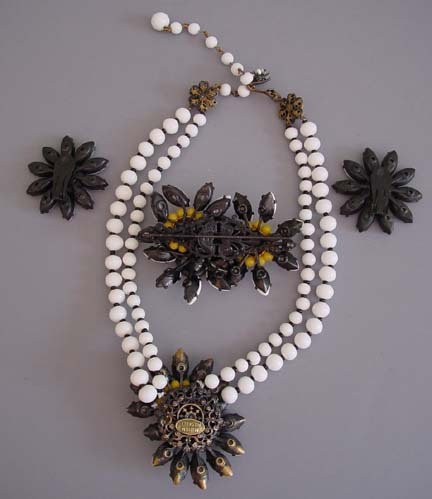 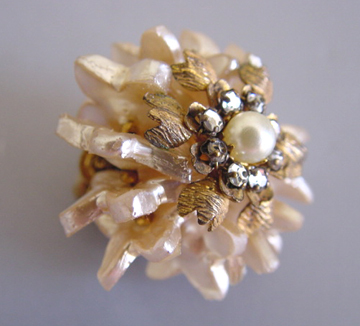 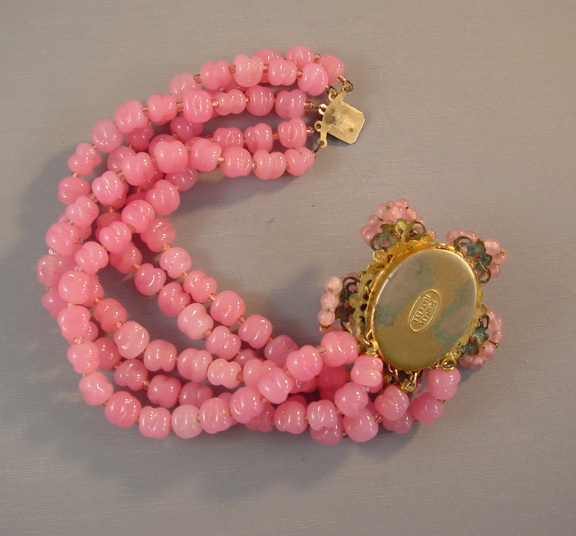 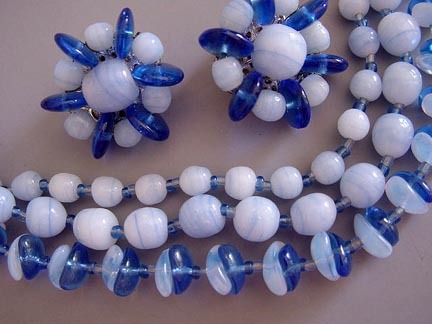 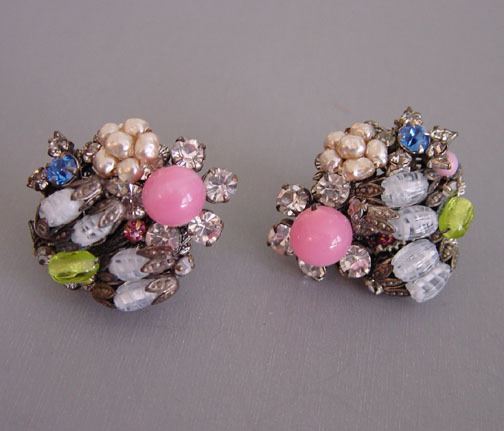 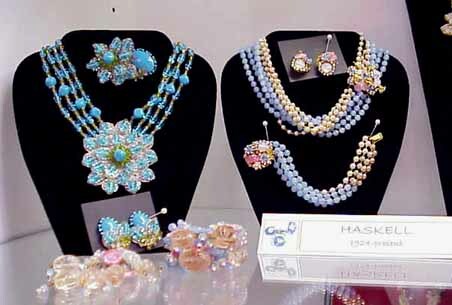 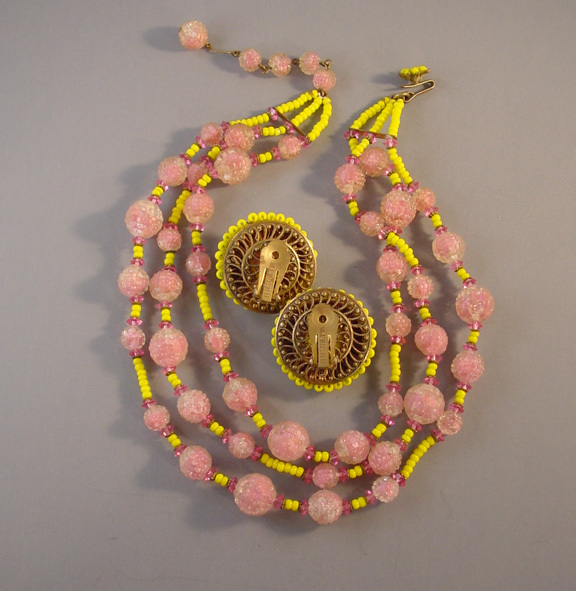 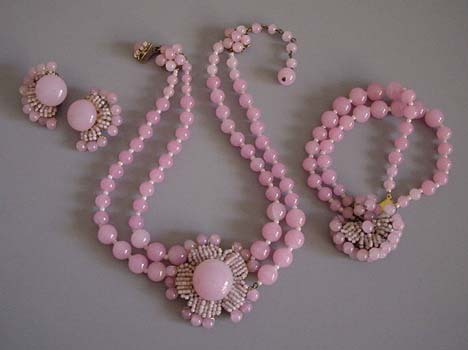 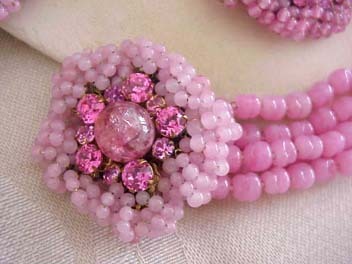 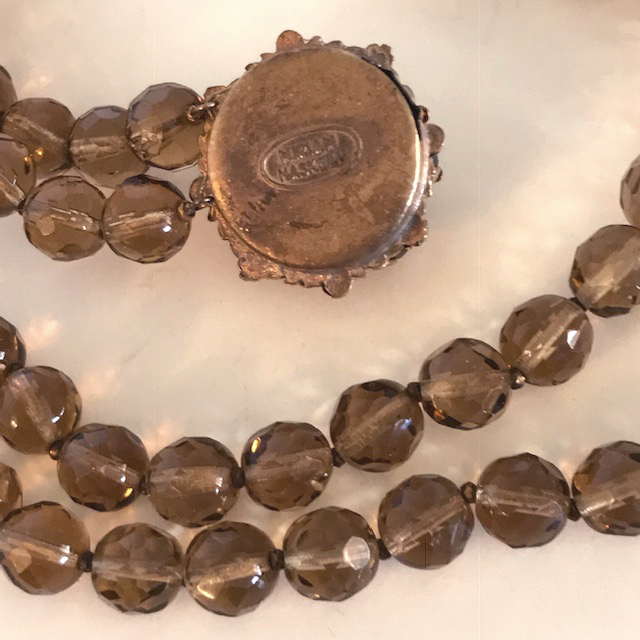 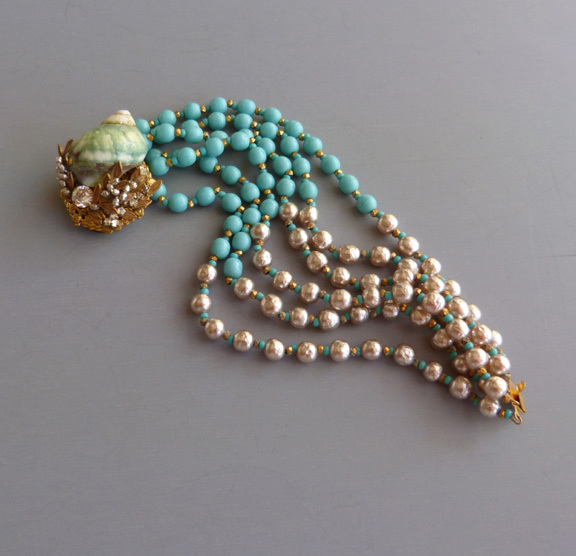 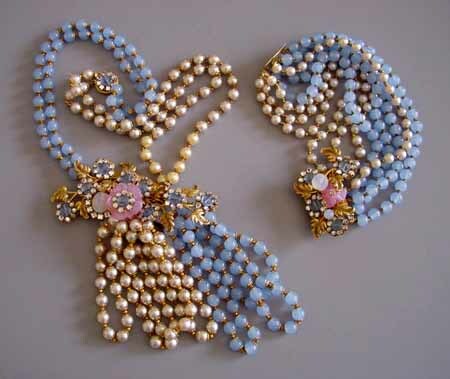 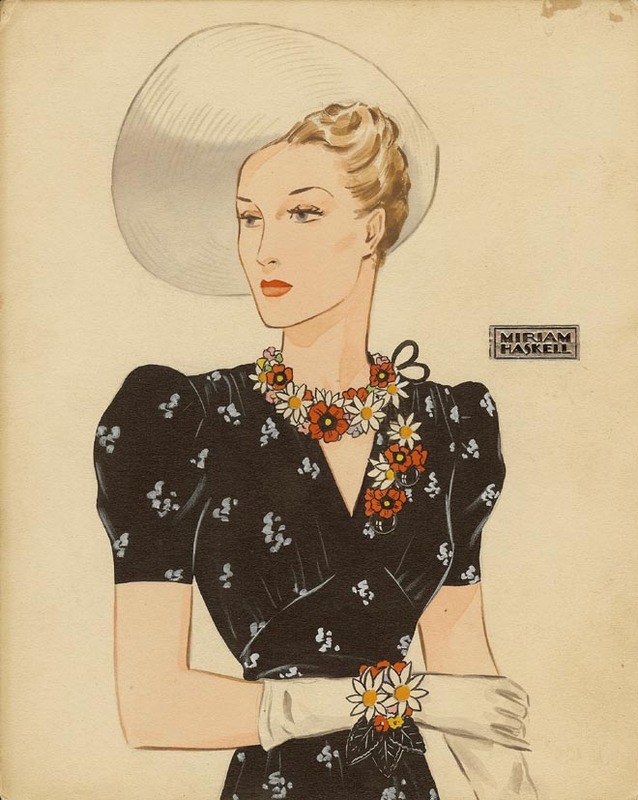 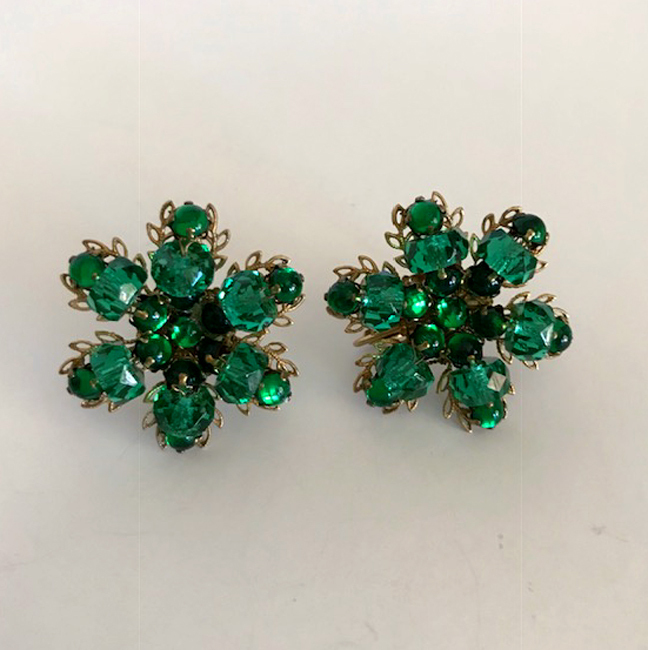 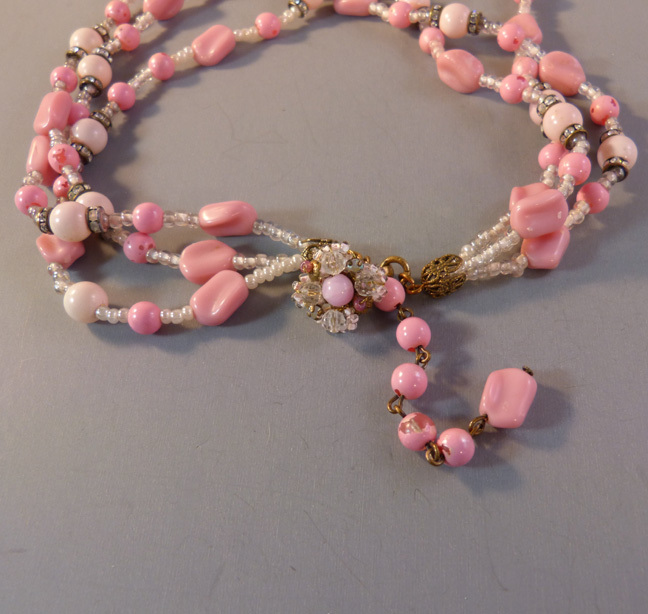 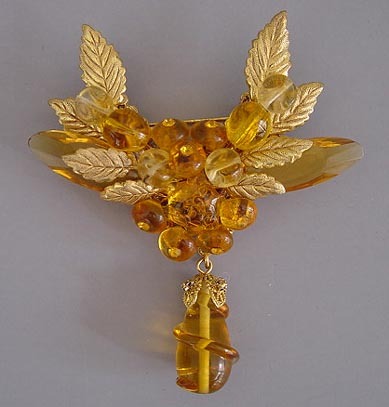 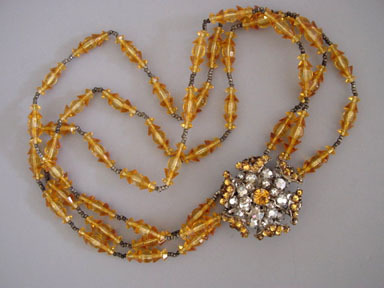 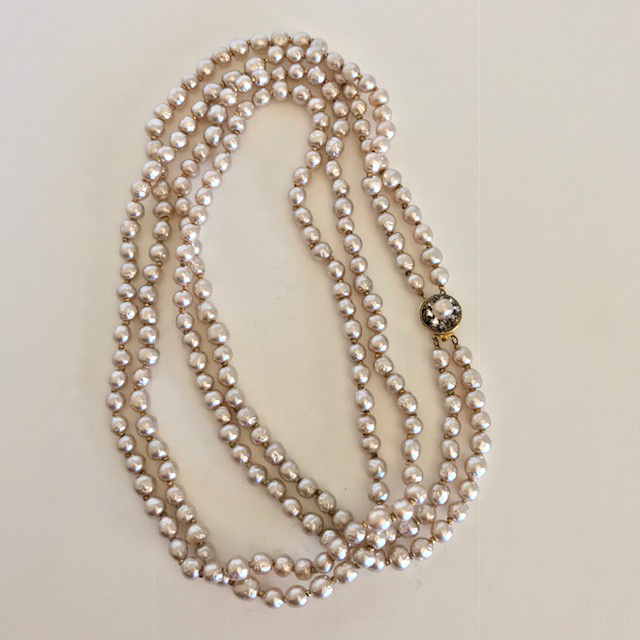 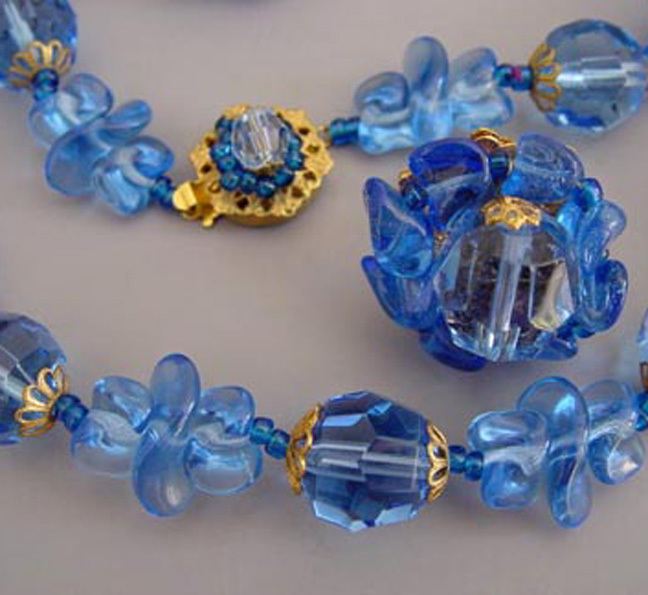 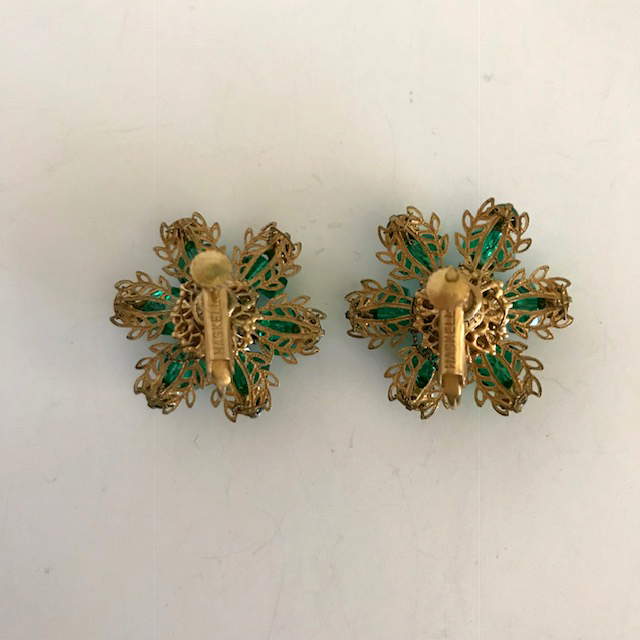 Especially collectible are her pieces using tiny intricate motifs in seed pearls and glass beads along with rose montee She began making jewelry in 1926, and it is said that she did not sign her jewelry until about 1947. 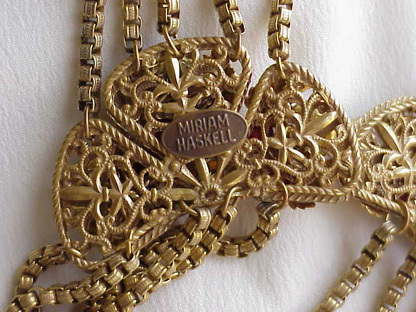 The list of wonderful designers who worked for her includes among others Frank Hess, Bob Clark and Larry Vrba. 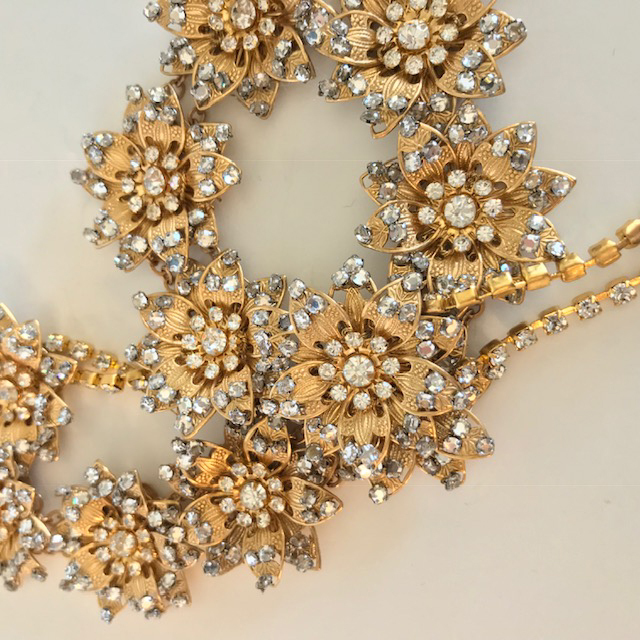 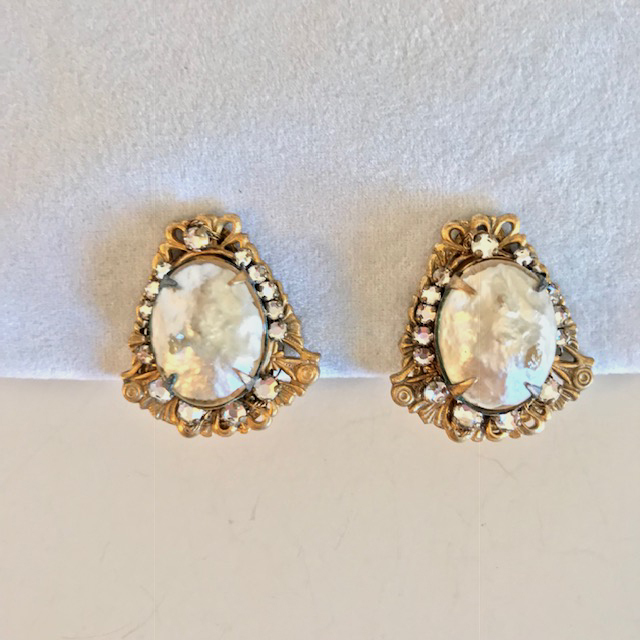 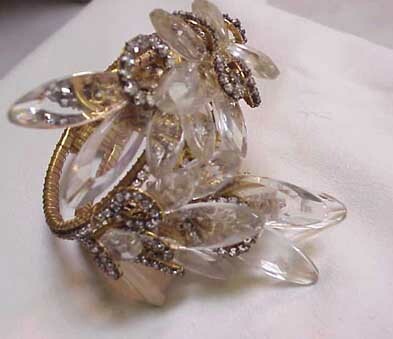 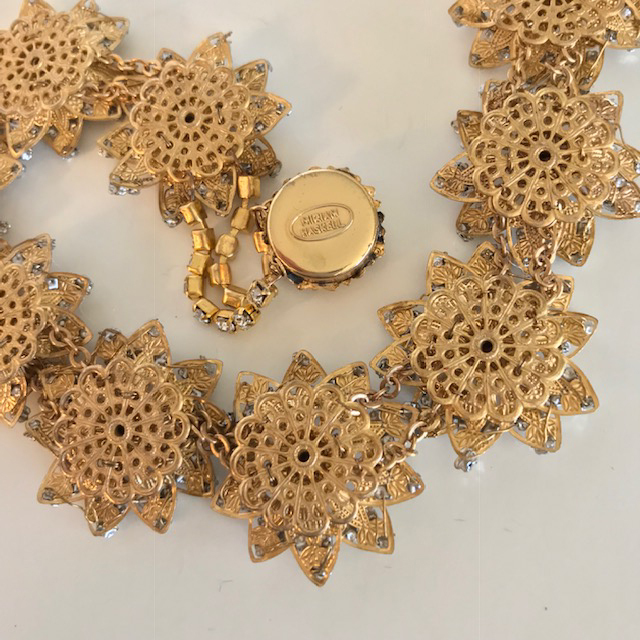 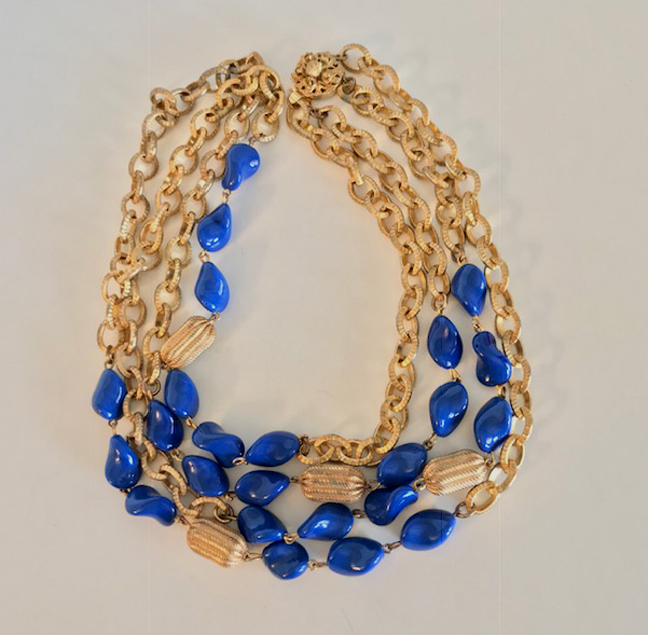 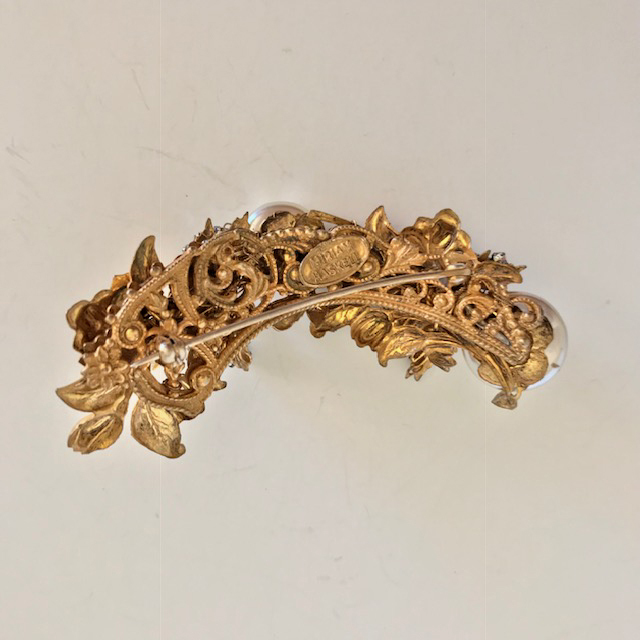 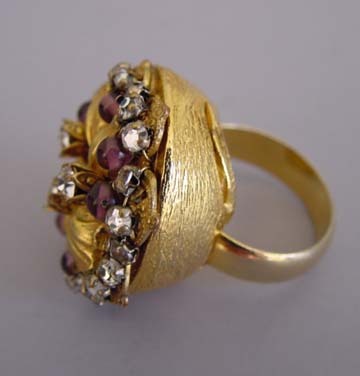 Although she passed away over twenty years ago, the company is producing jewelry today with a different owner, but in totally different styles. 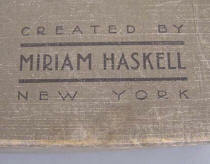 and in our article about Early Unsigned Haskell (click here). 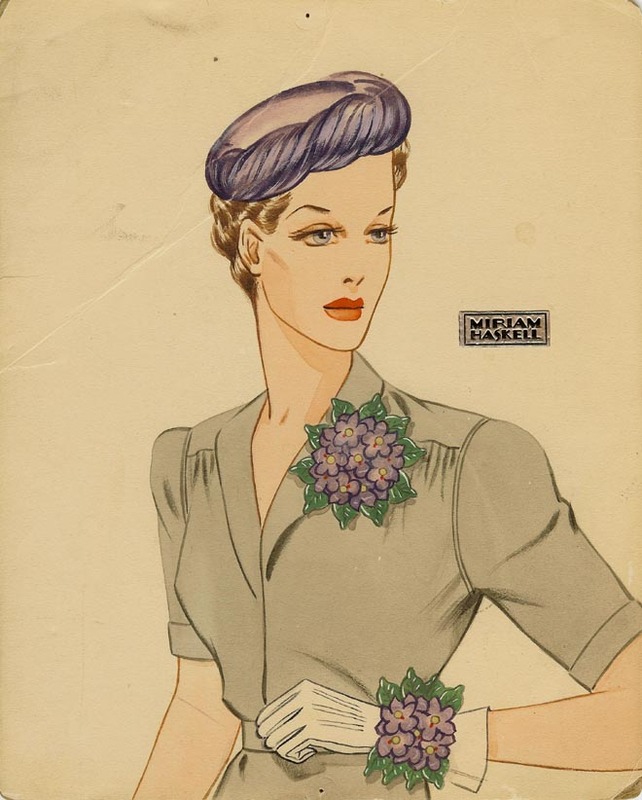 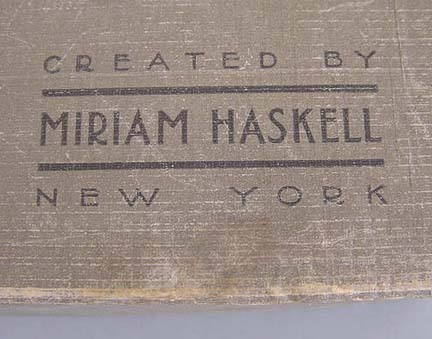 HASKELL 1930-40's advertisements by artist Larry Austin. 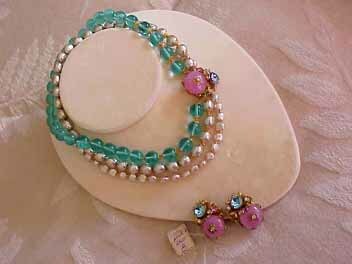 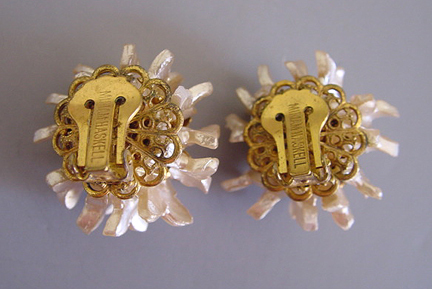 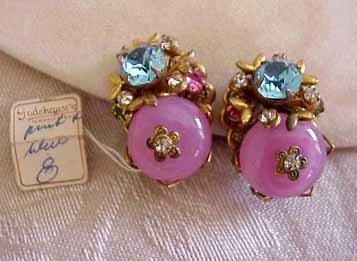 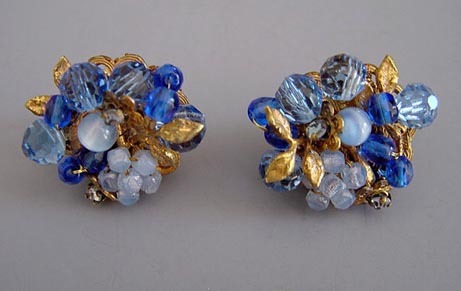 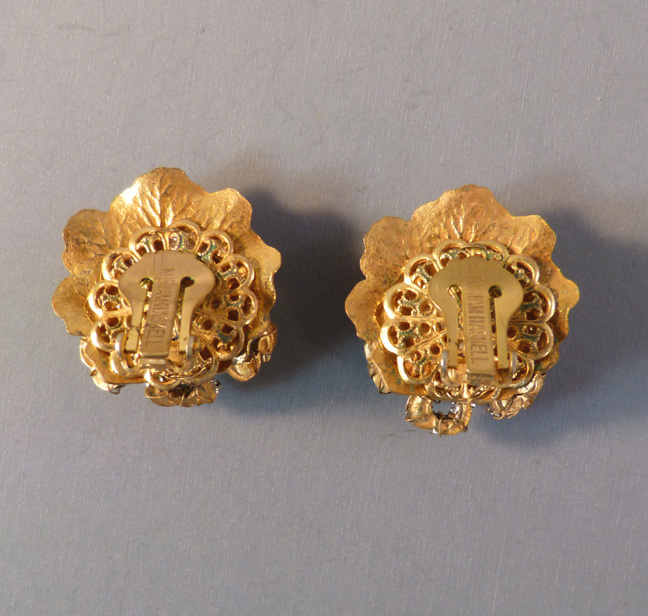 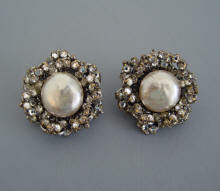 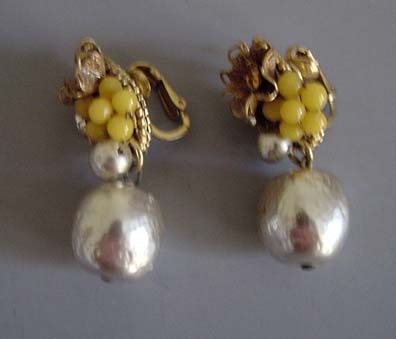 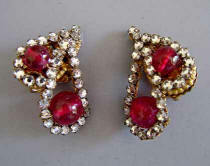 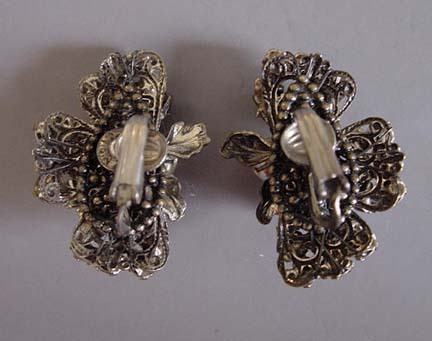 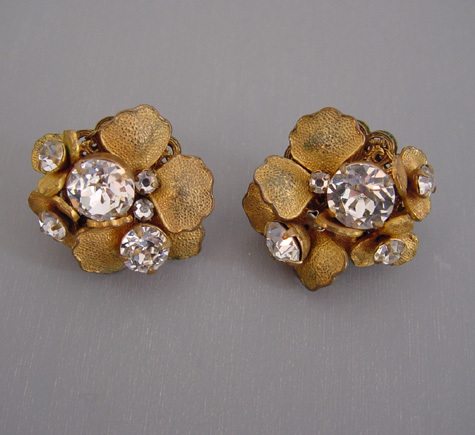 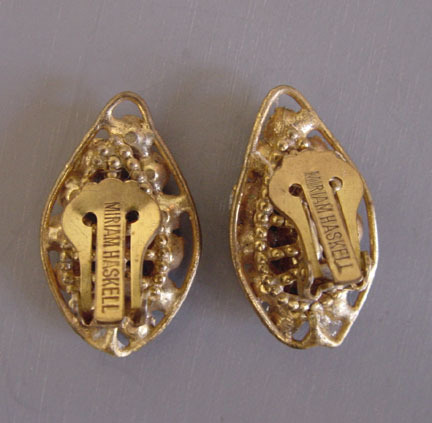 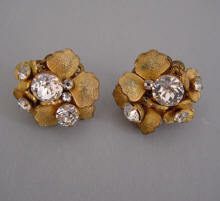 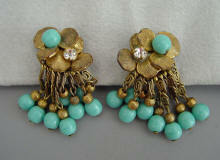 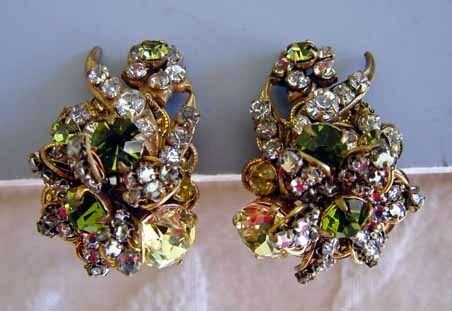 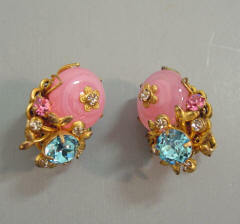 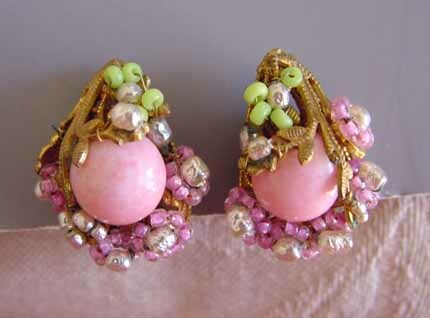 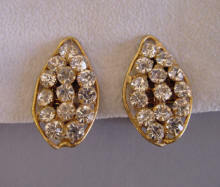 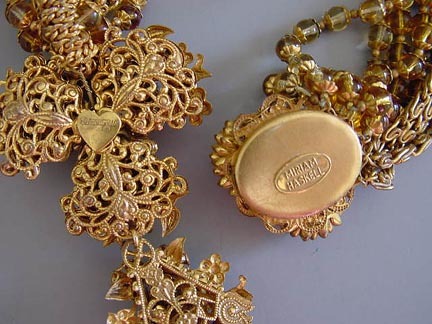 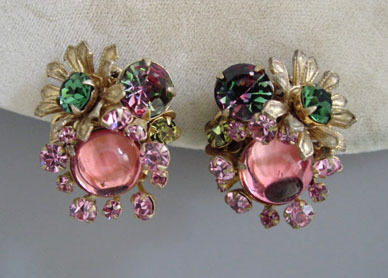 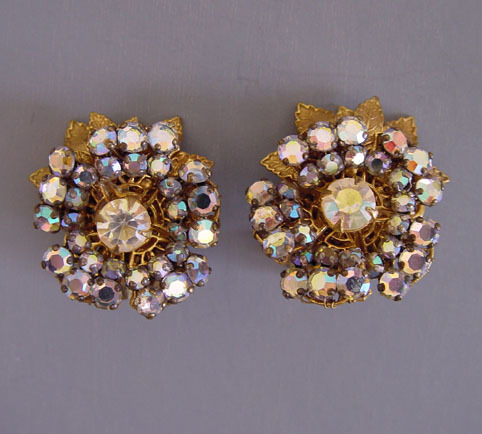 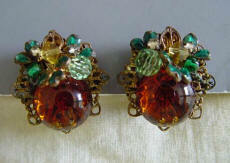 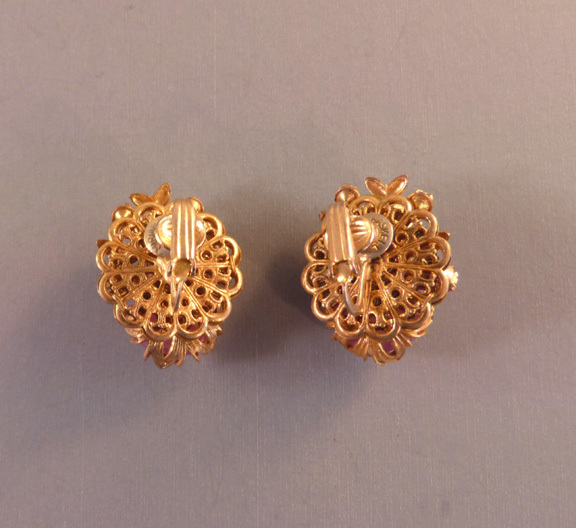 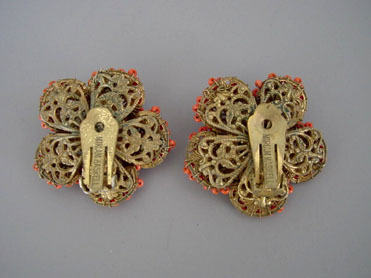 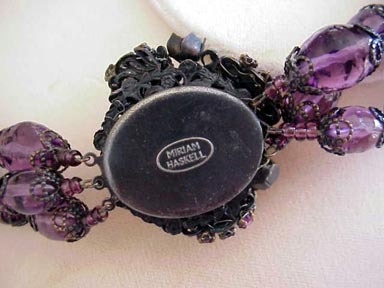 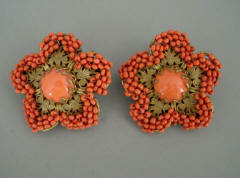 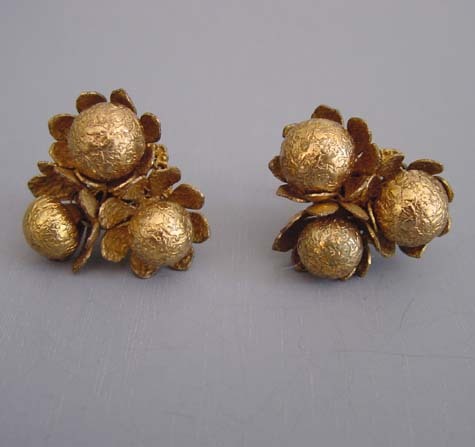 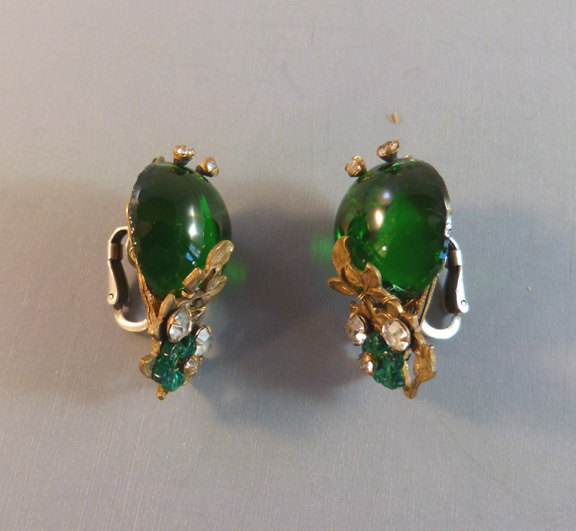 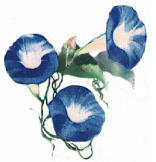 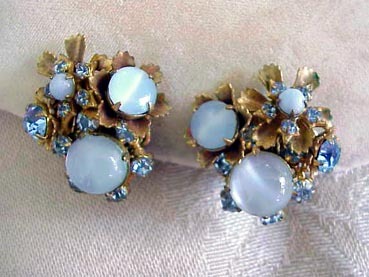 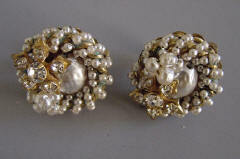 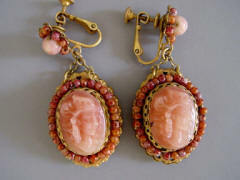 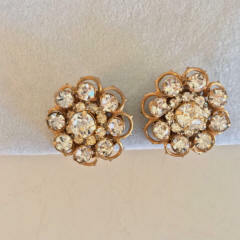 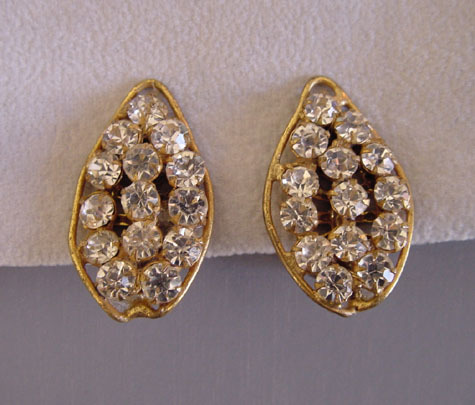 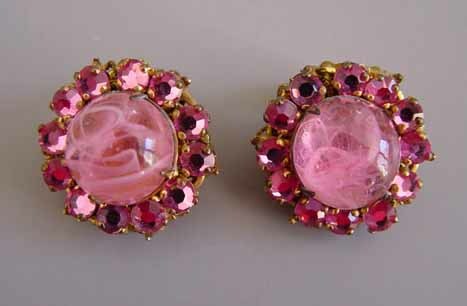 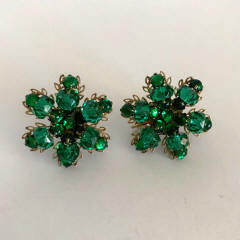 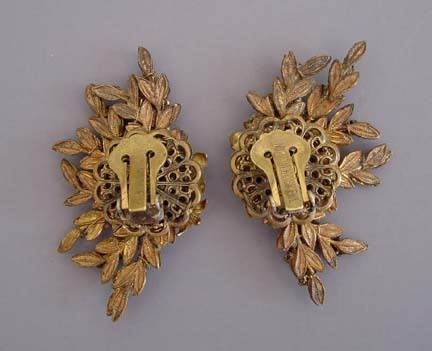 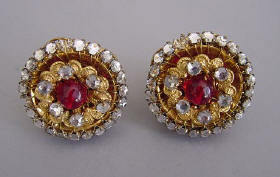 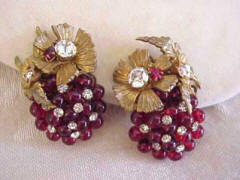 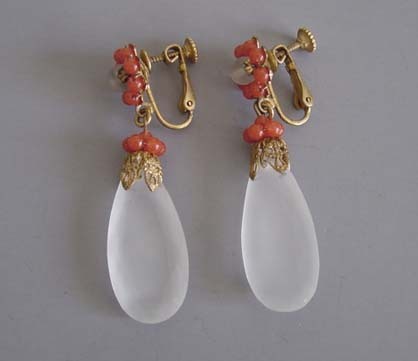 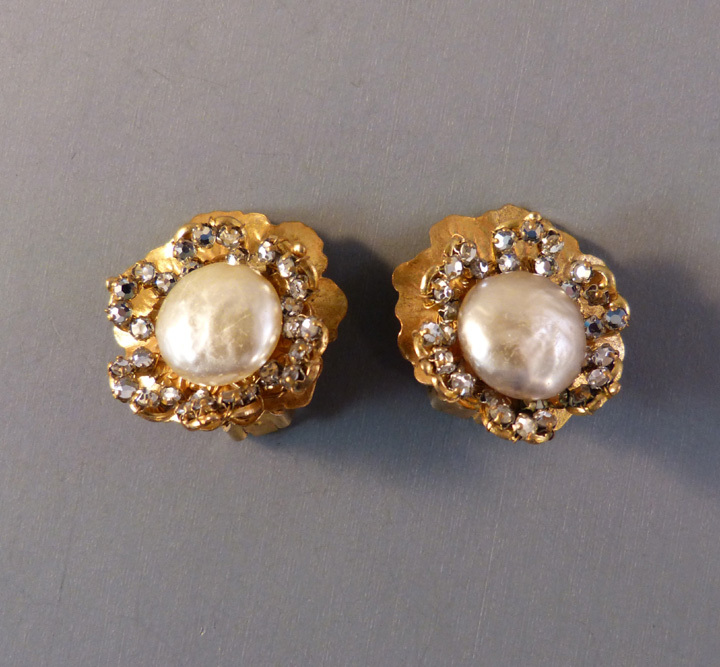 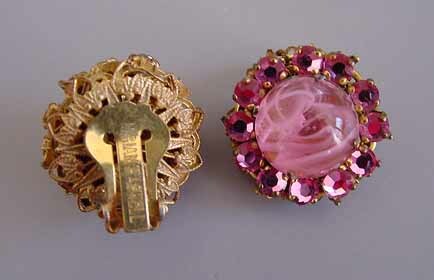 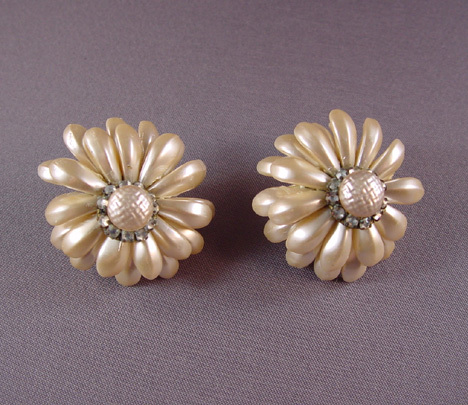 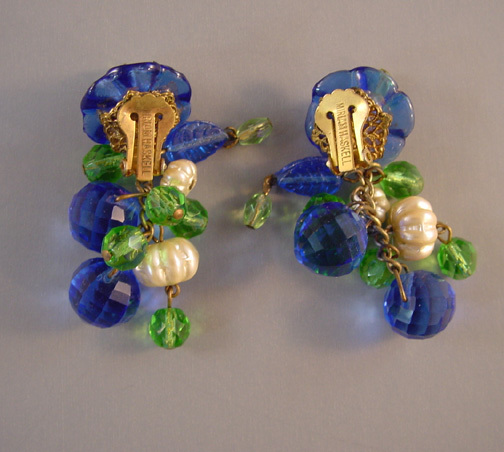 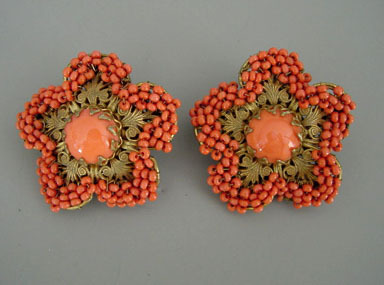 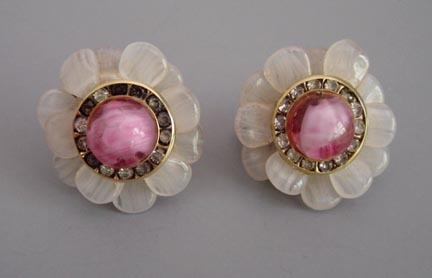 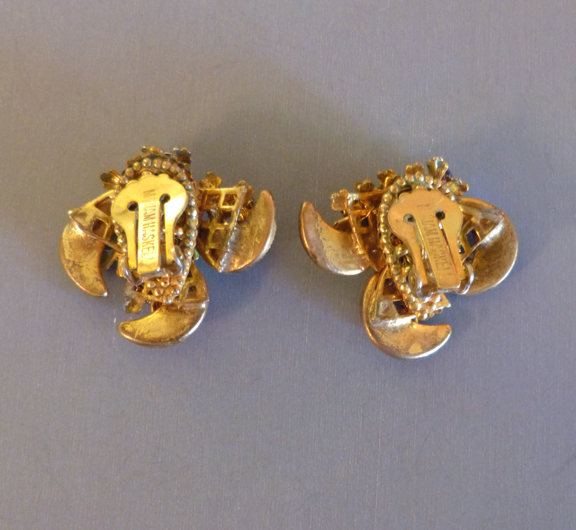 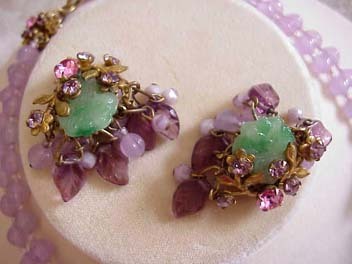 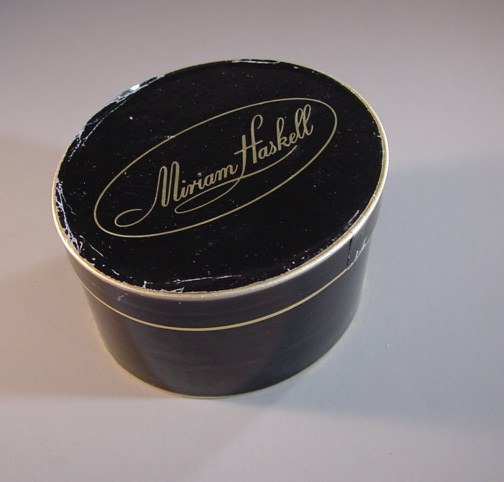 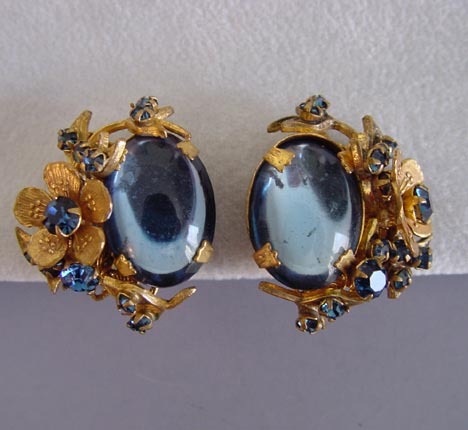 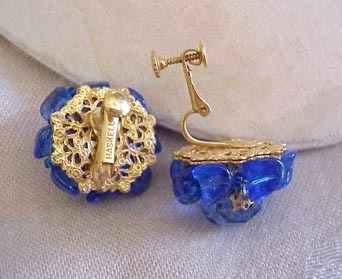 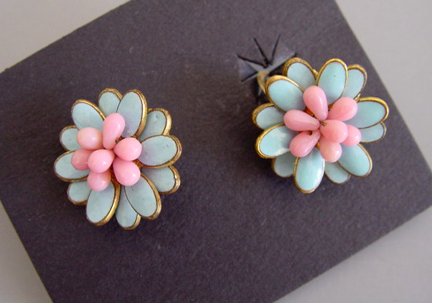 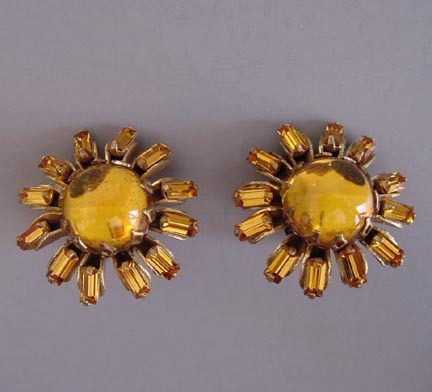 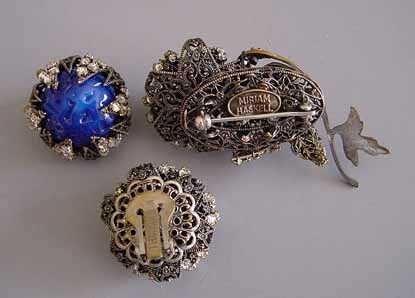 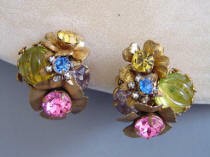 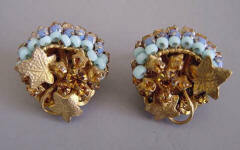 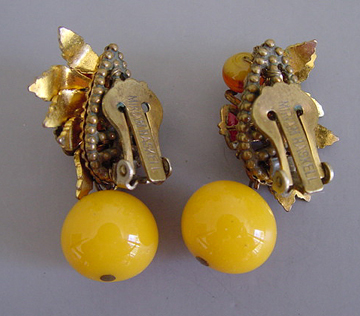 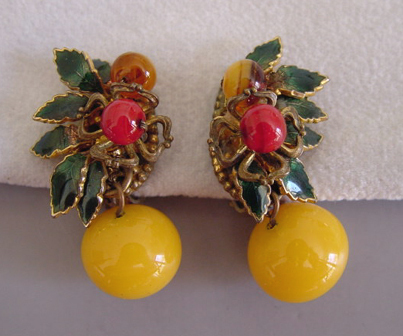 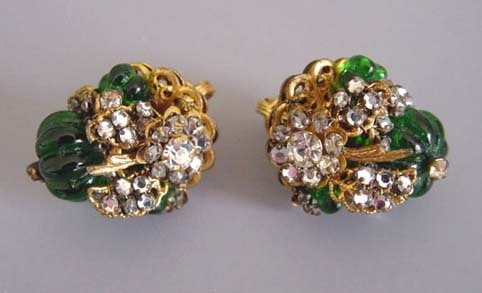 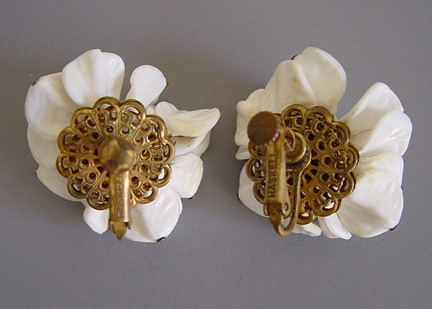 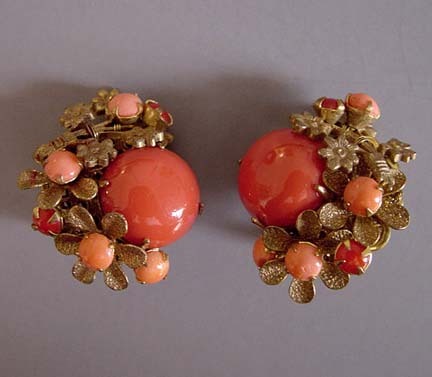 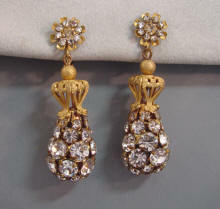 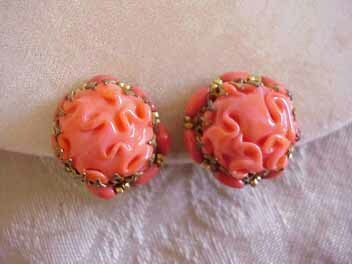 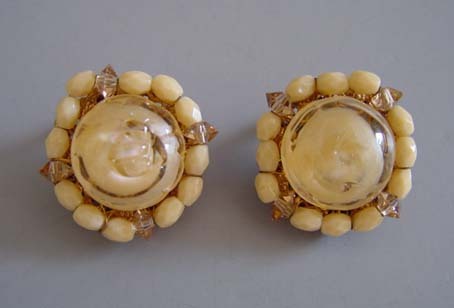 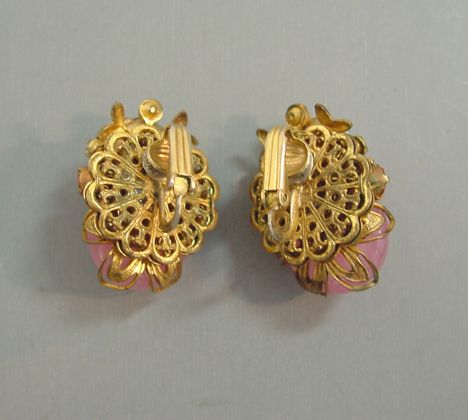 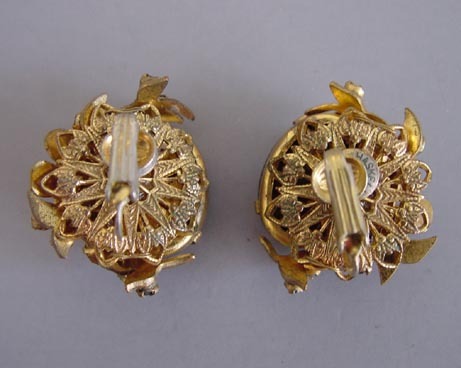 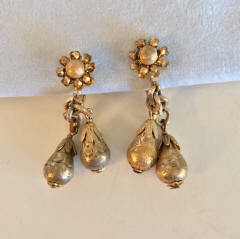 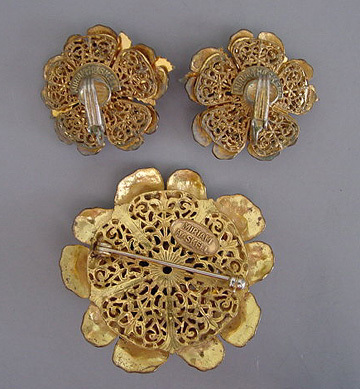 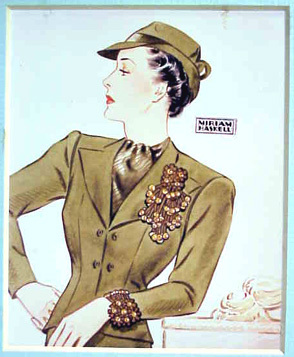 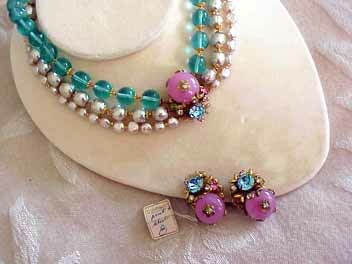 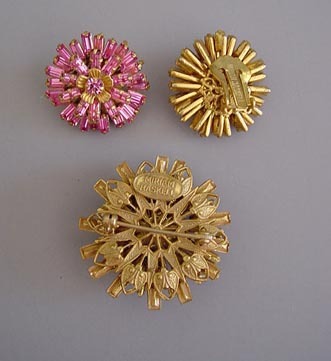 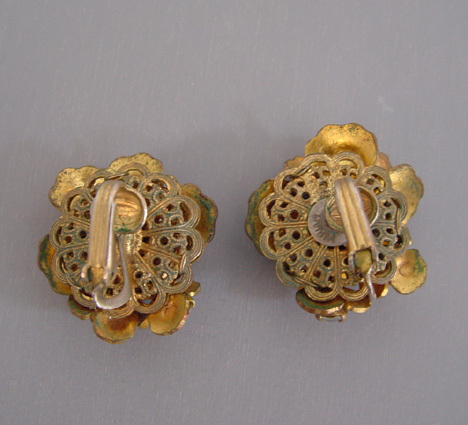 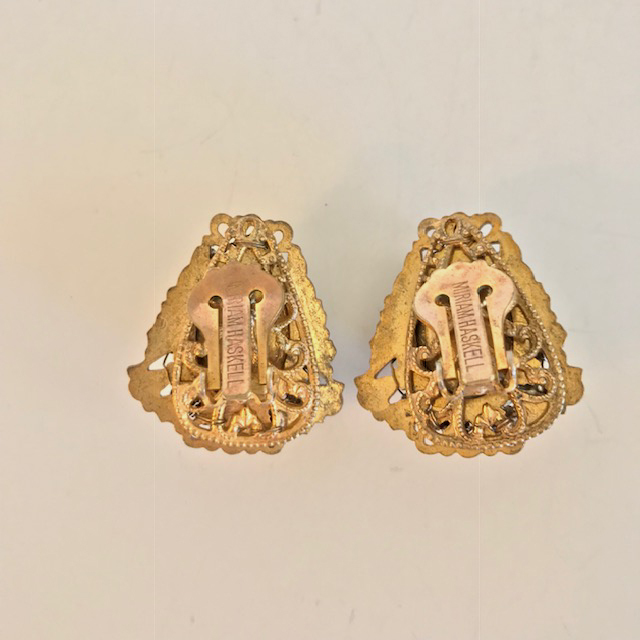 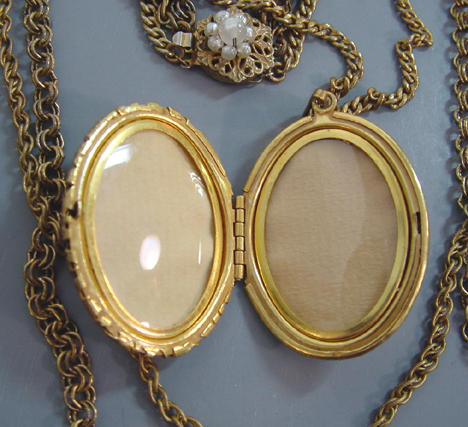 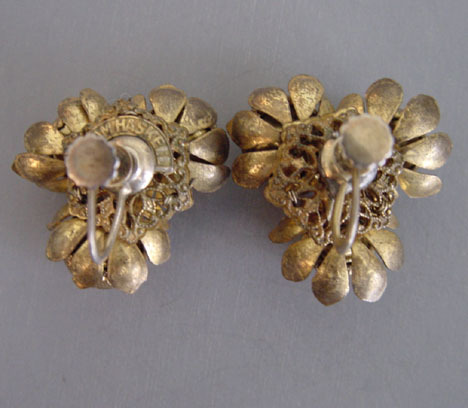 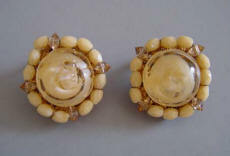 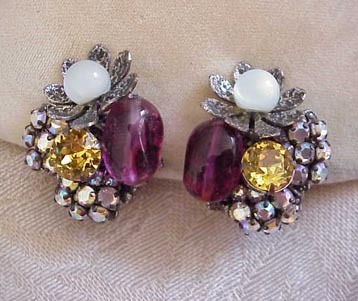 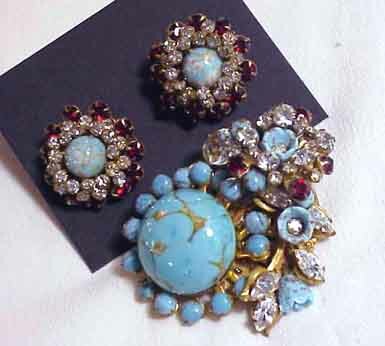 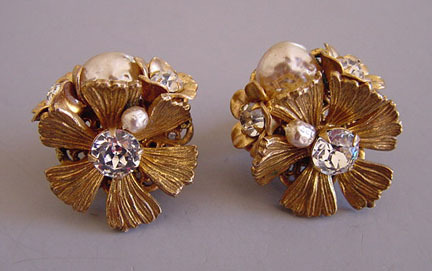 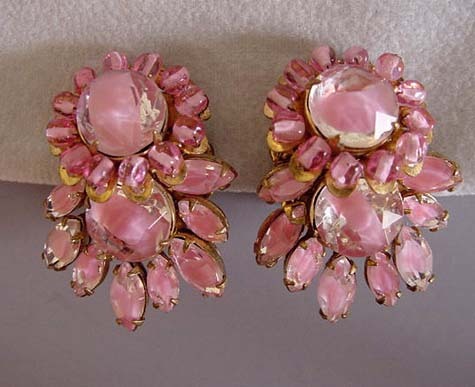 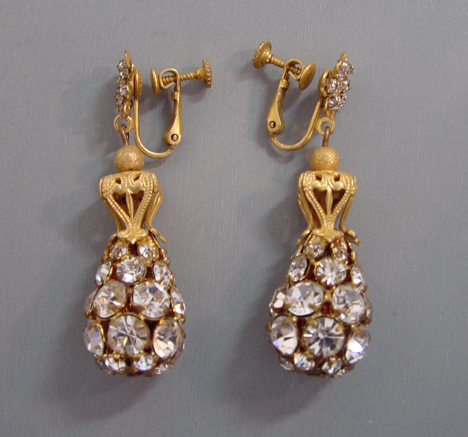 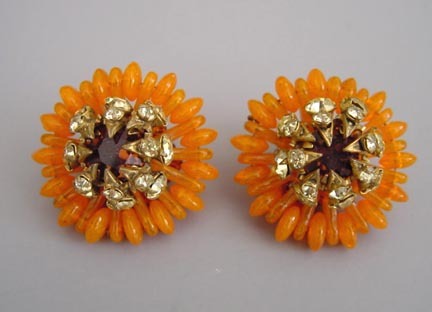 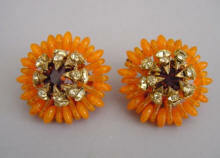 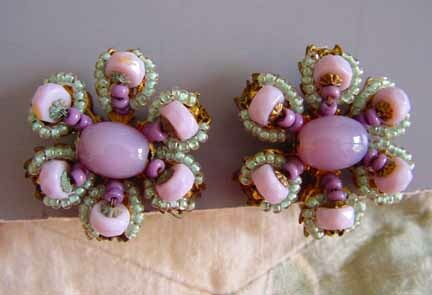 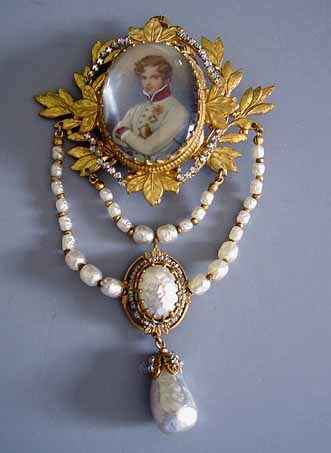 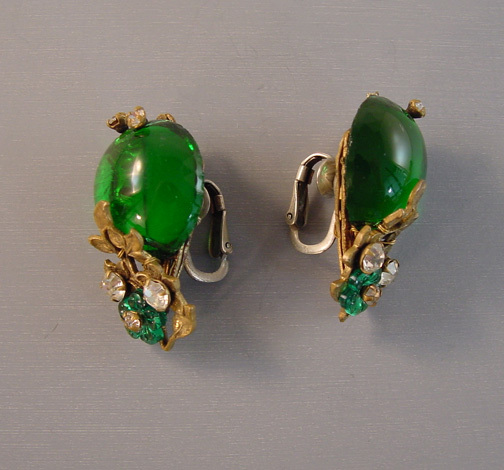 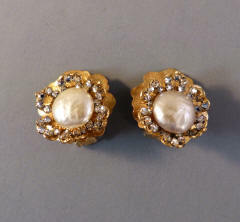 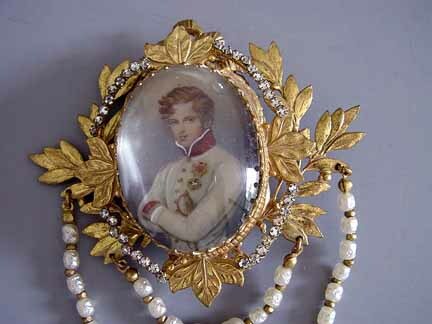 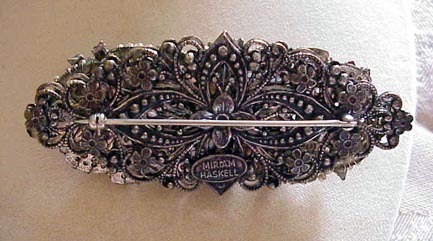 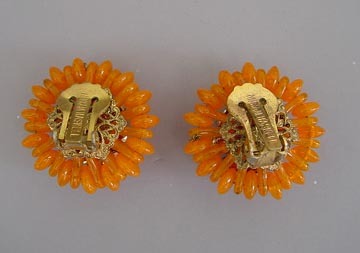 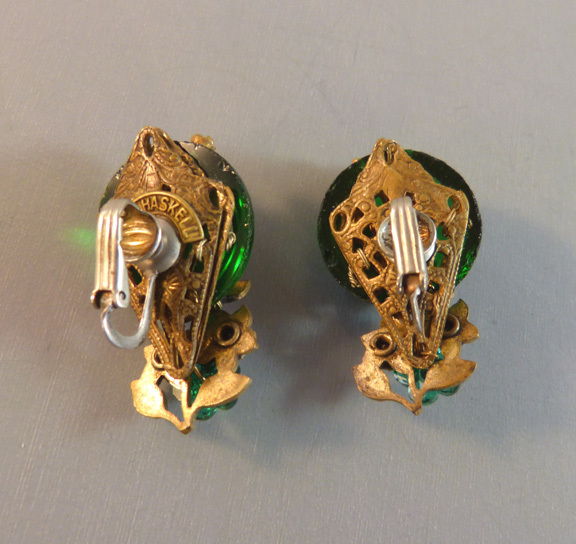 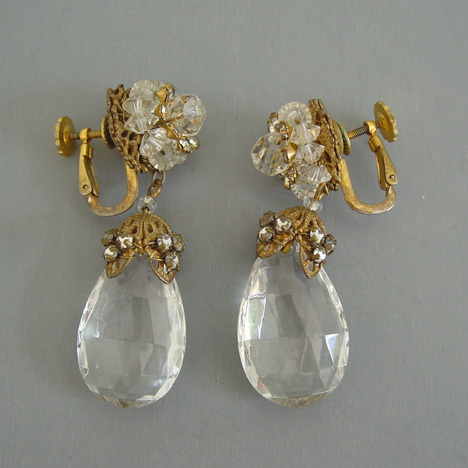 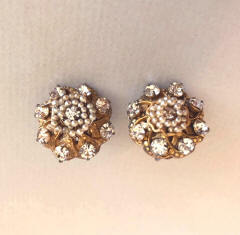 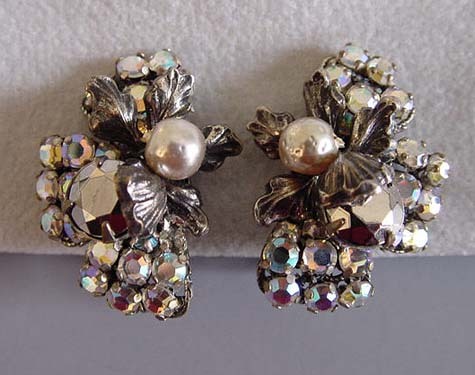 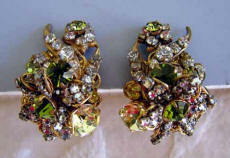 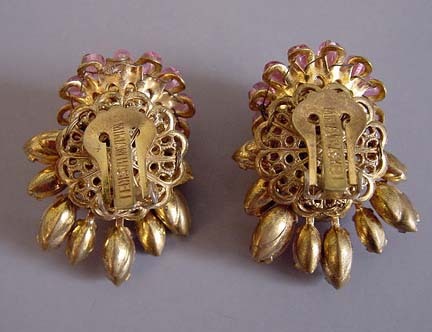 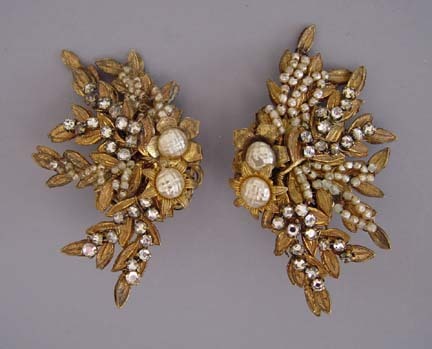 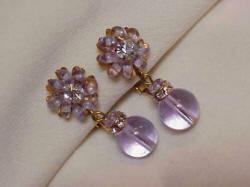 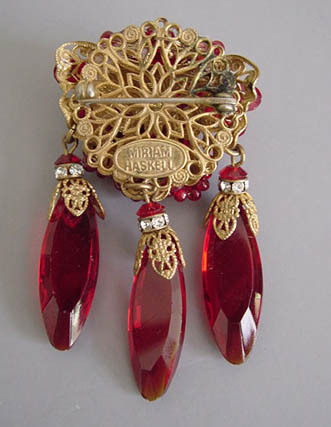 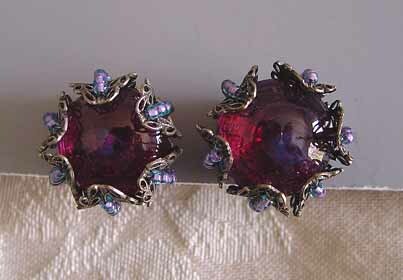 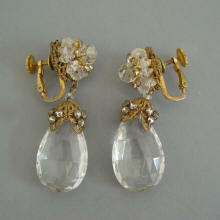 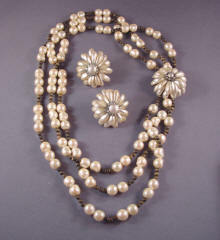 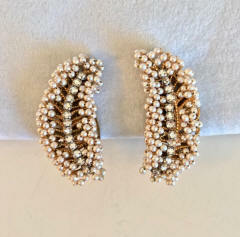 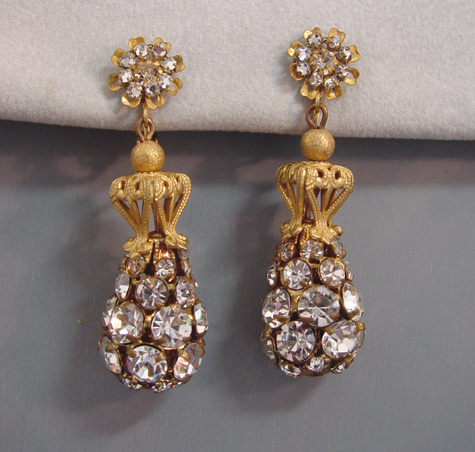 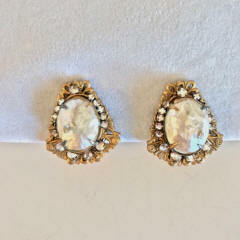 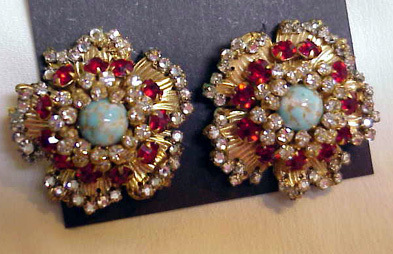 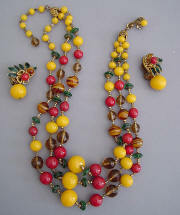 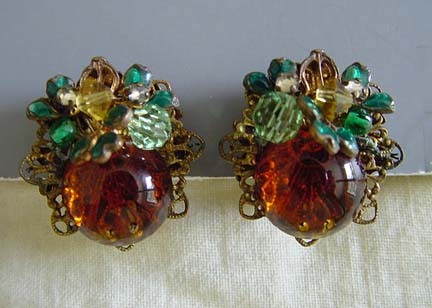 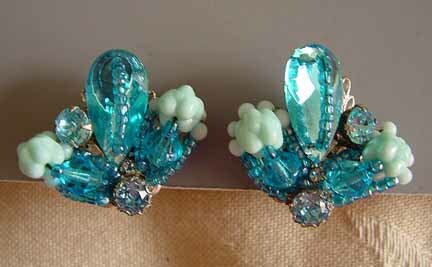 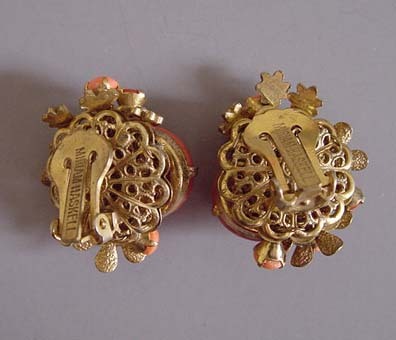 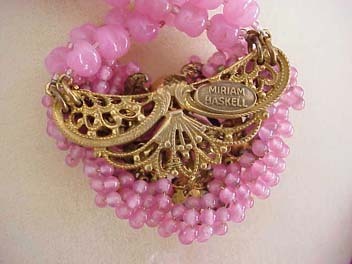 These would also have been used in the boutiques that carried Haskell jewelry. 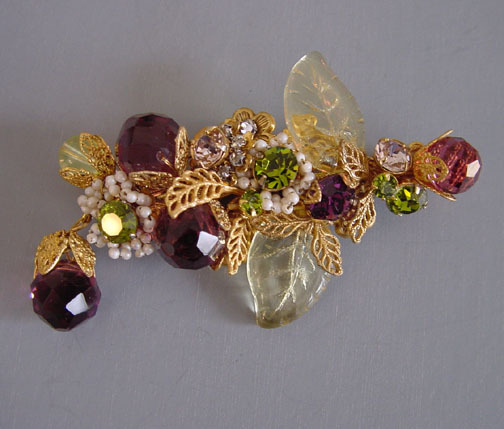 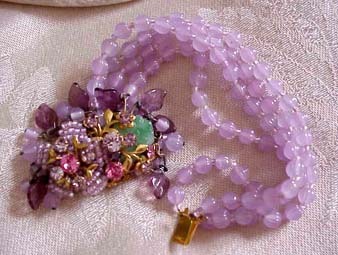 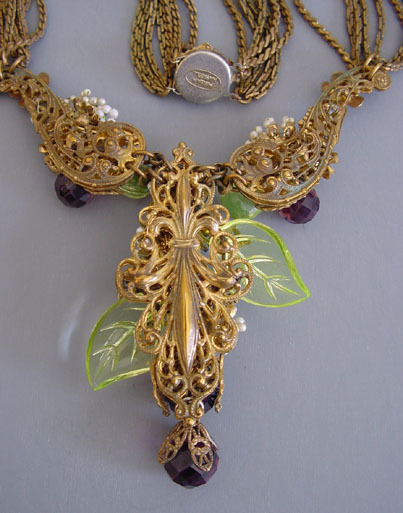 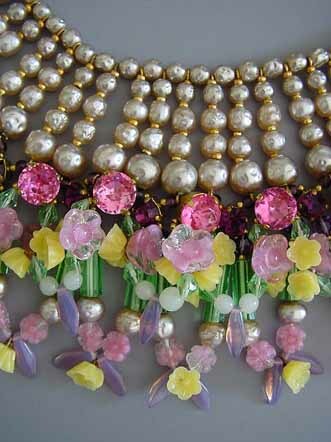 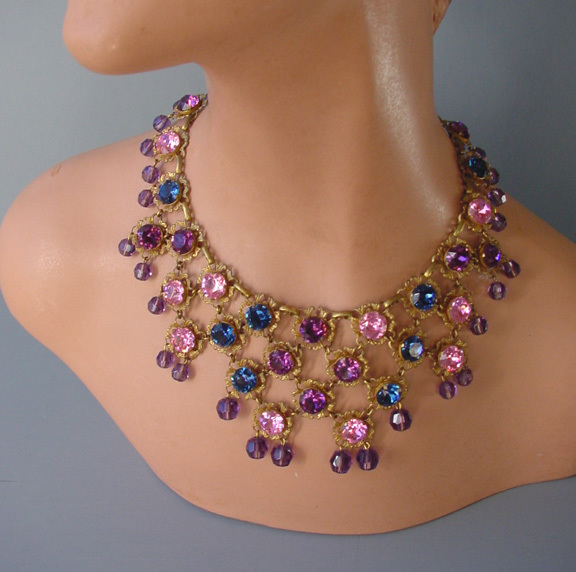 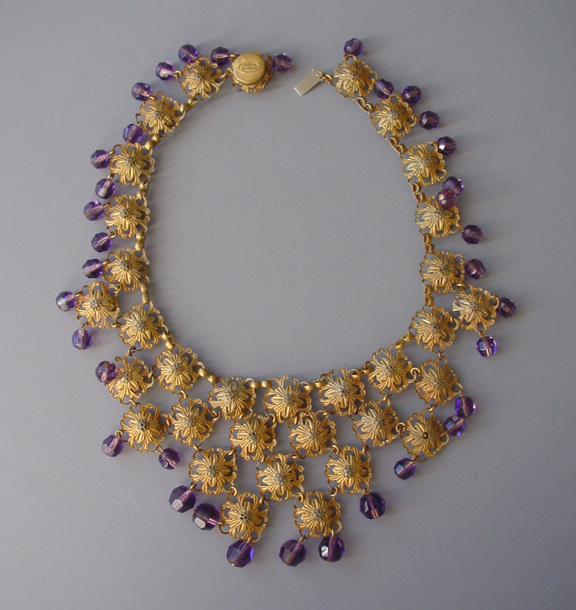 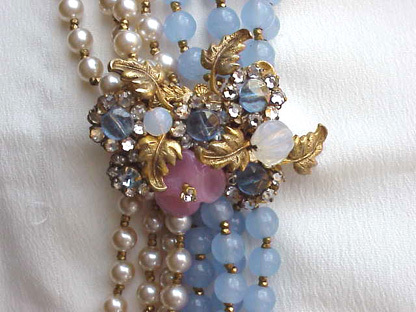 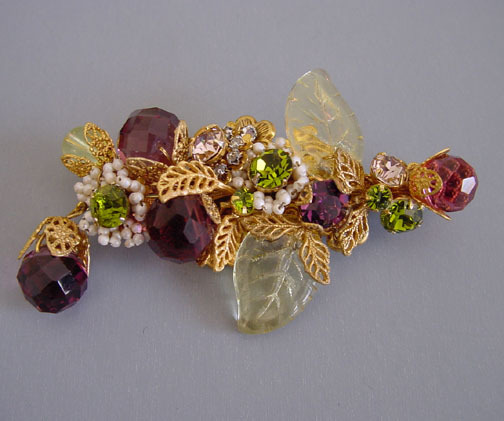 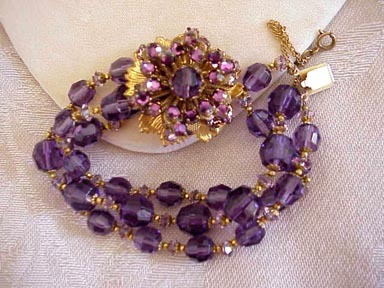 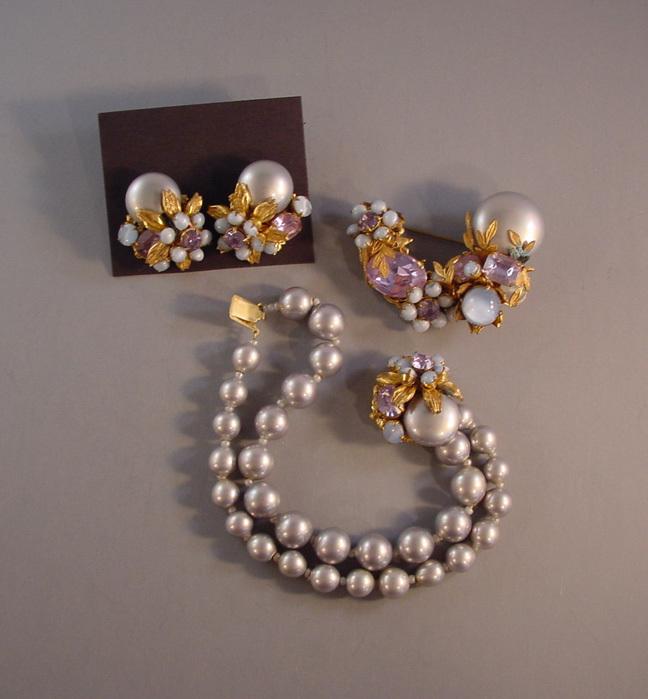 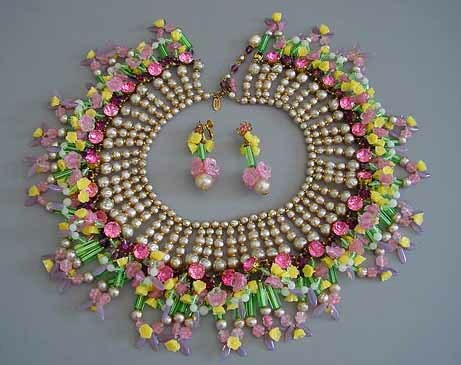 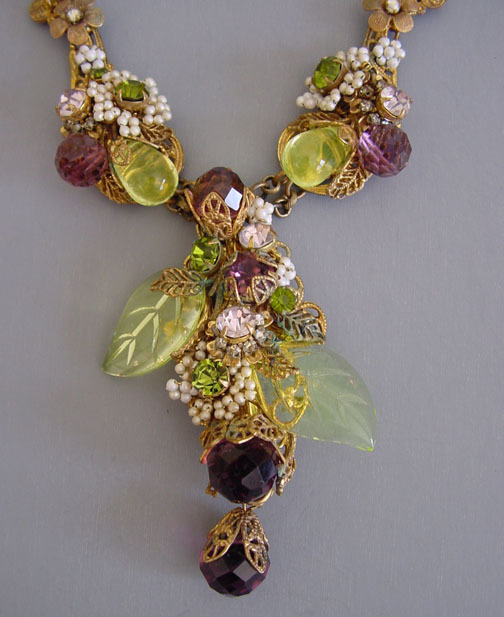 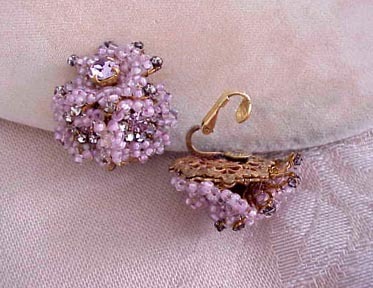 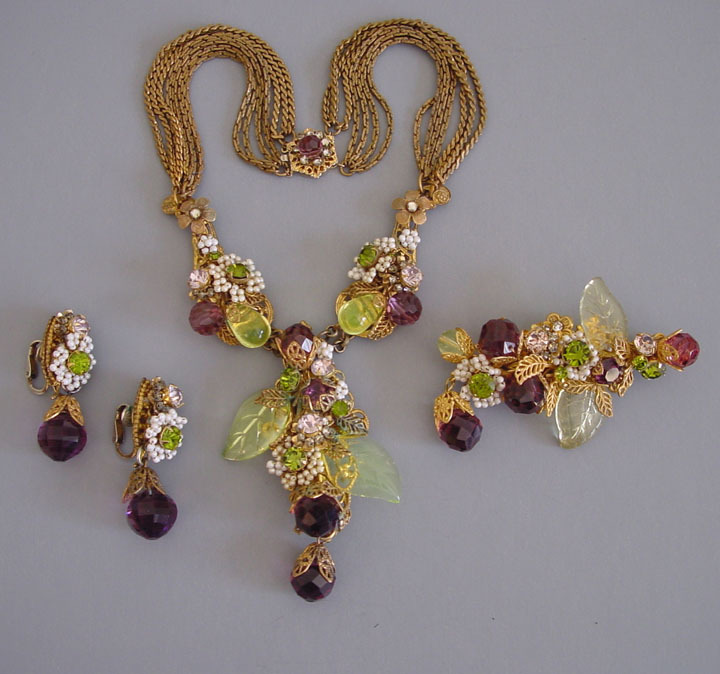 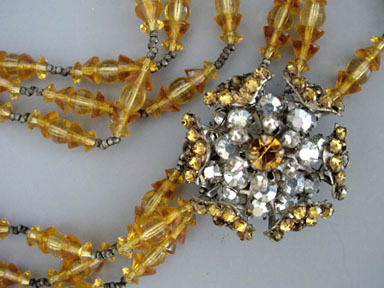 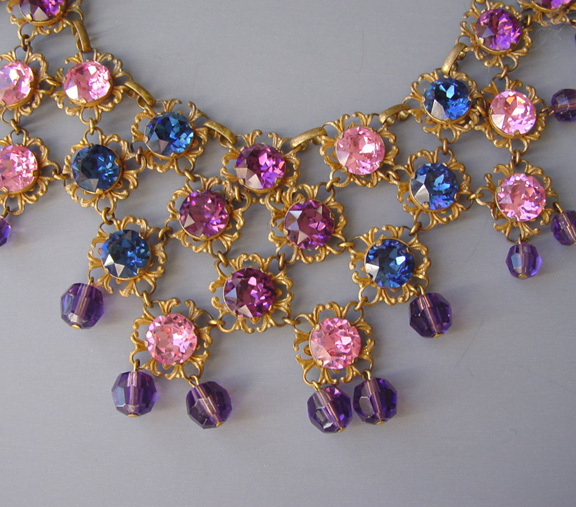 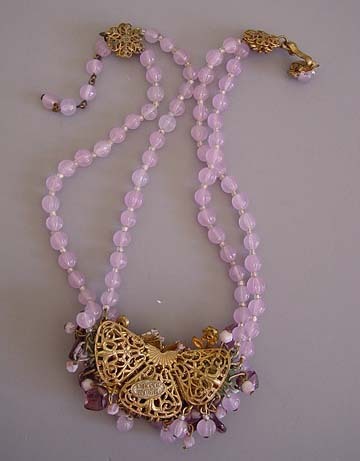 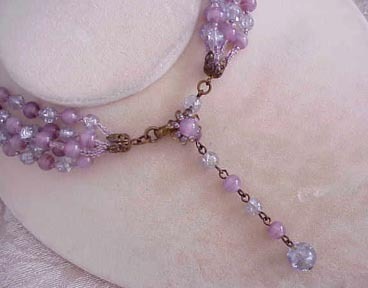 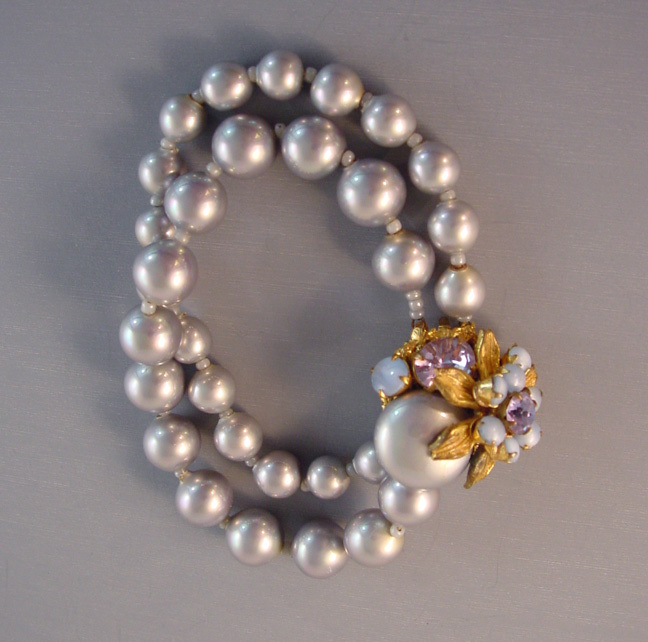 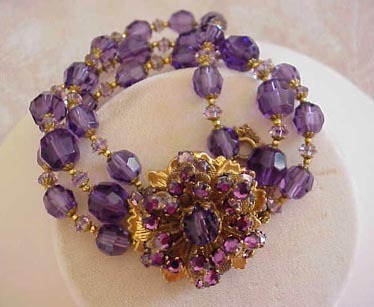 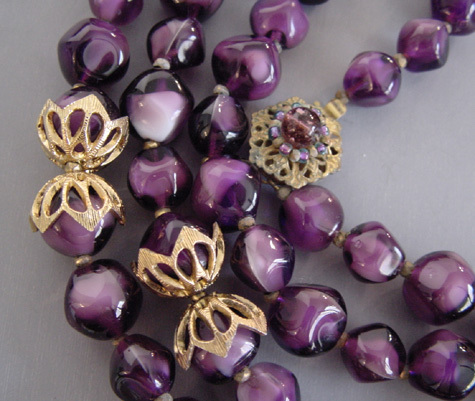 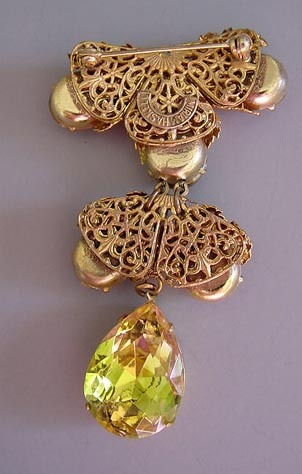 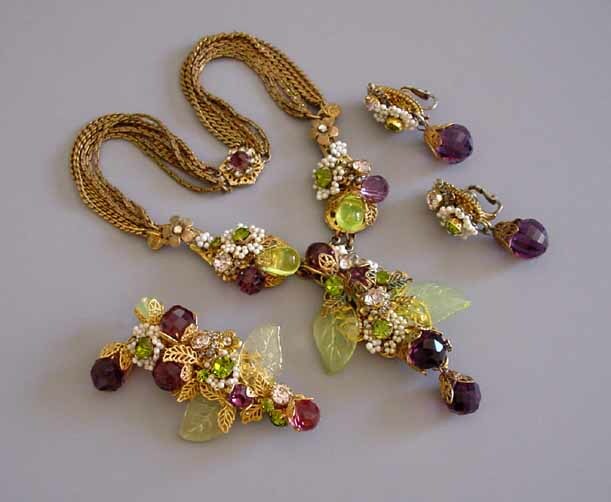 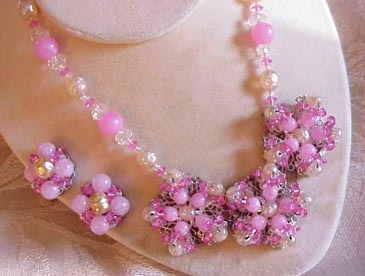 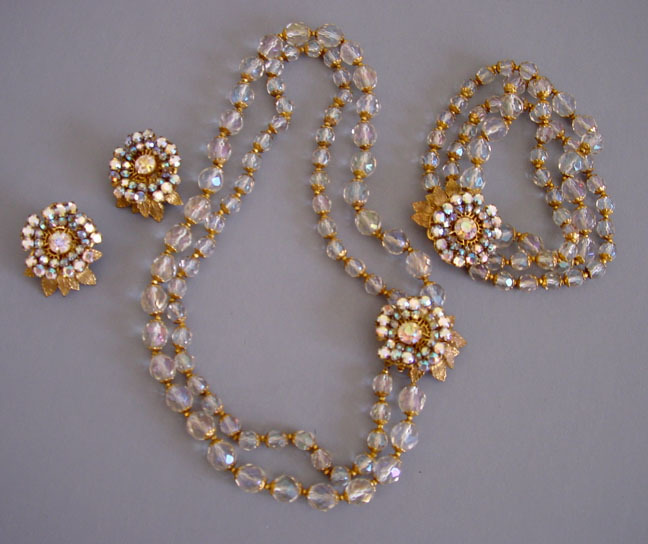 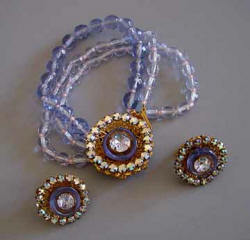 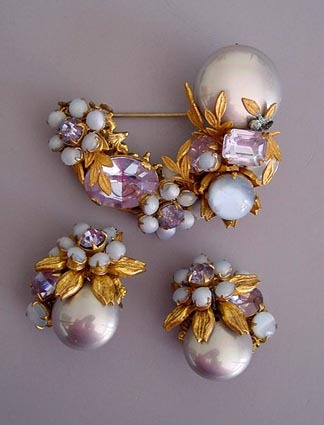 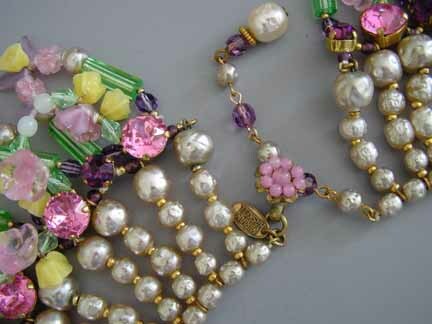 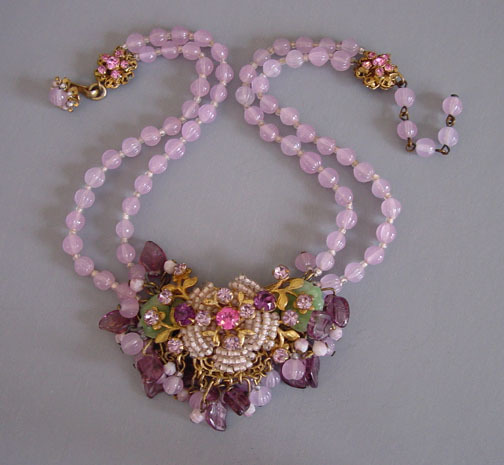 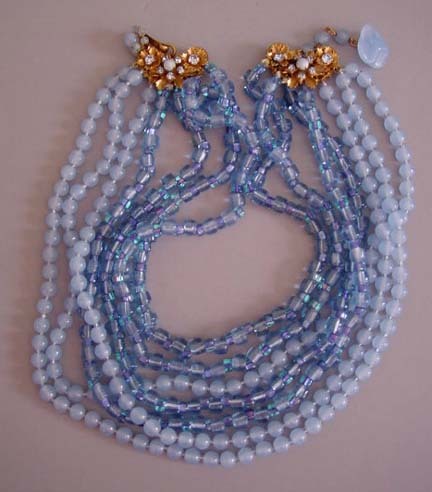 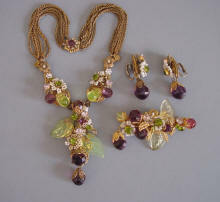 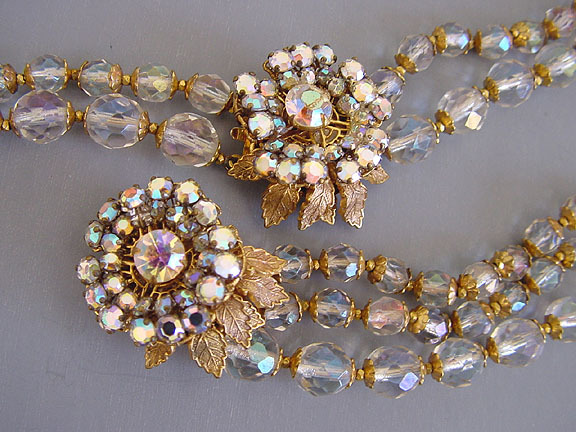 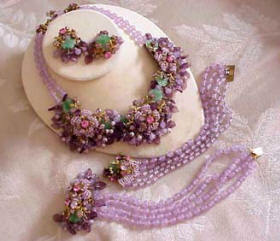 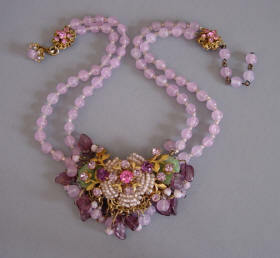 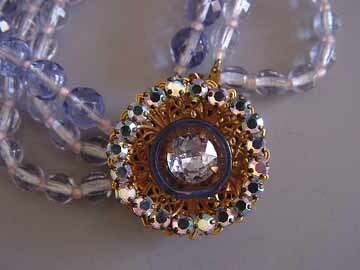 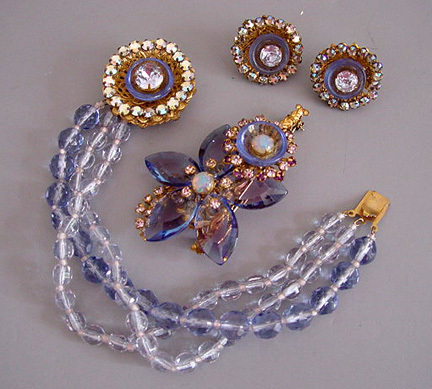 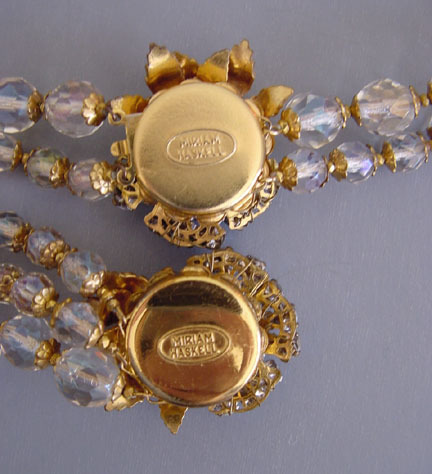 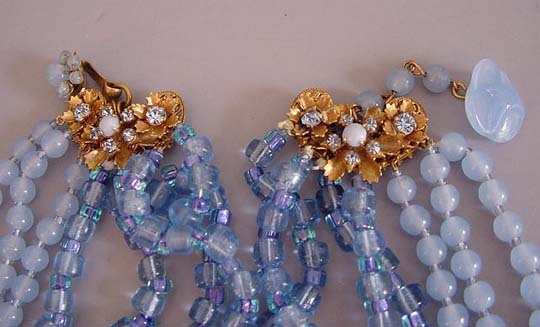 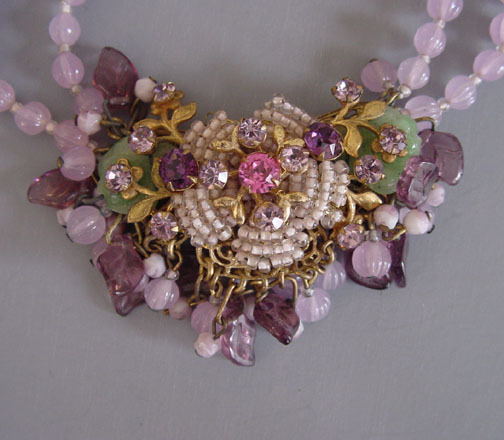 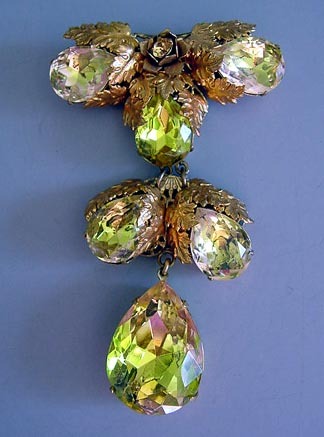 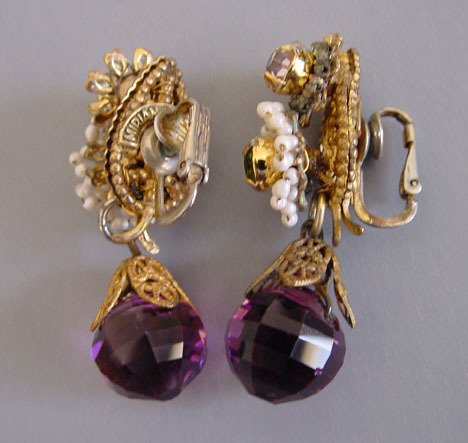 MIRIAM HASKELL parure composed of purple faceted crystal beads, yellow glass teardrops, artificial seed pearls and glass leaves, it is enhanced by rhinestones, artificial pearls and filigree work. 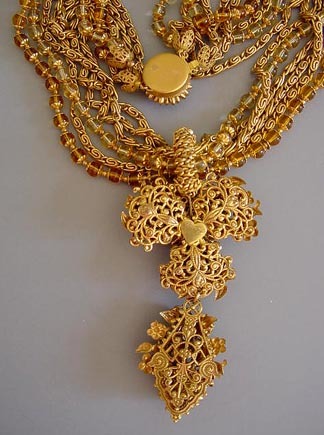 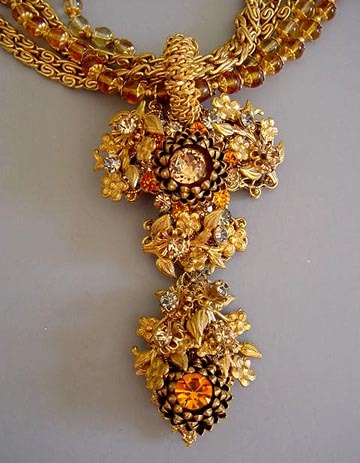 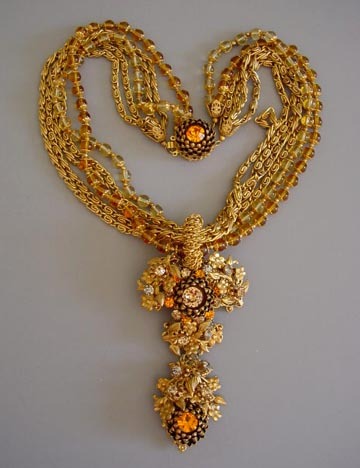 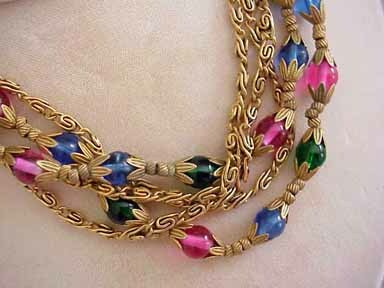 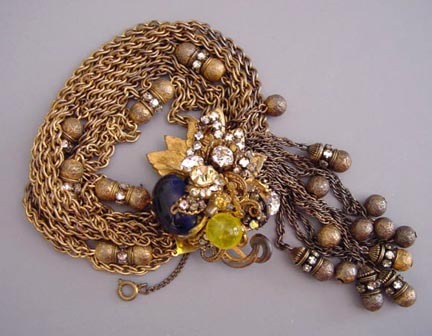 The necklace is 14 inches long with a 3 inch pendant, and the chains are darkened a bit with age but still lovely, circa 1950. 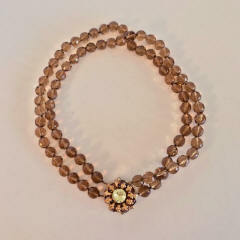 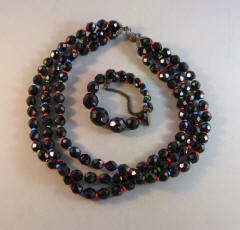 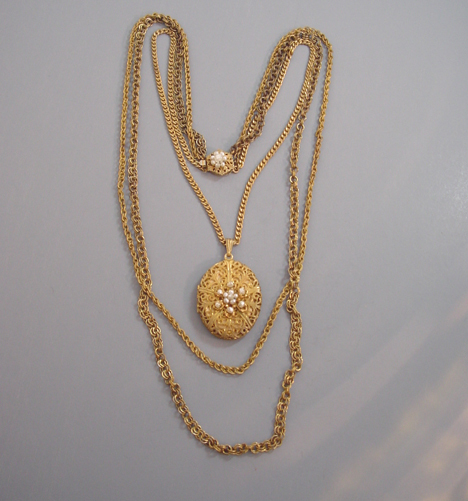 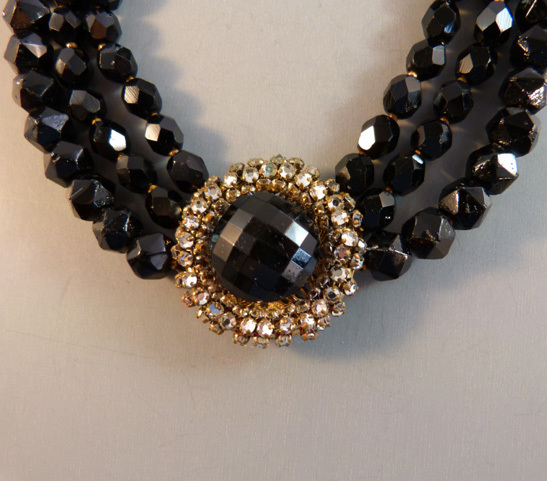 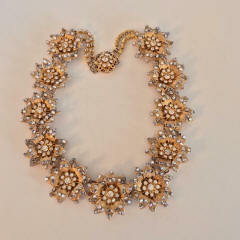 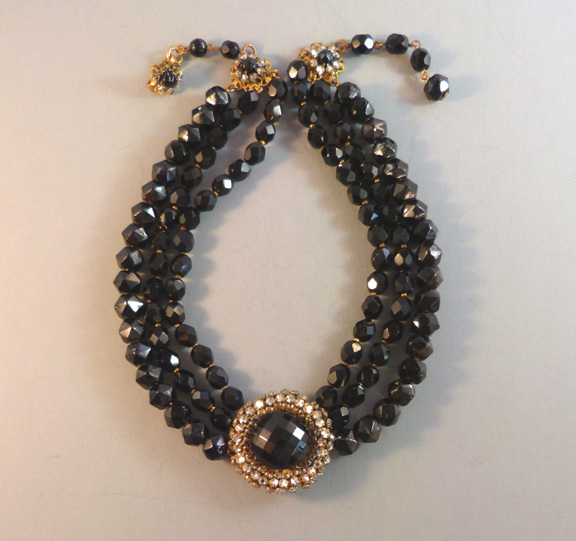 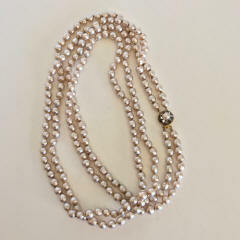 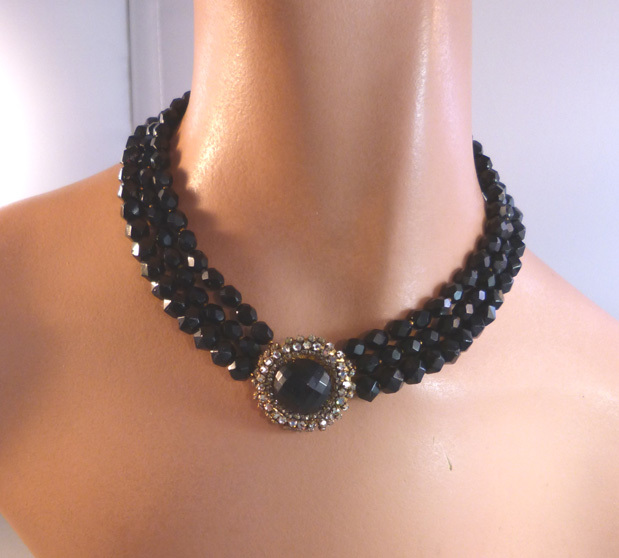 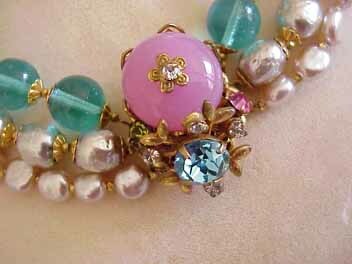 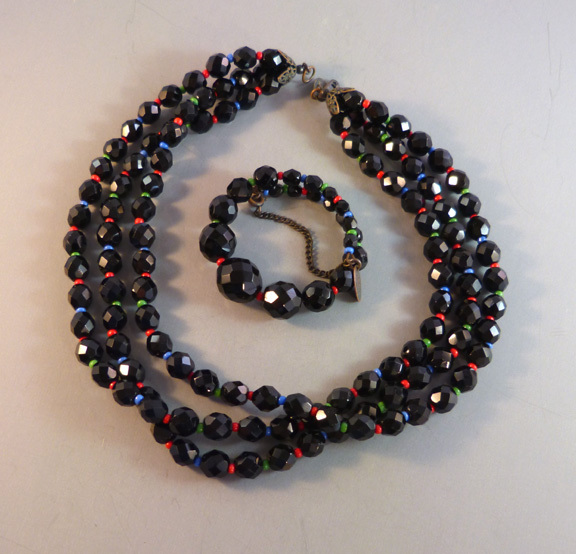 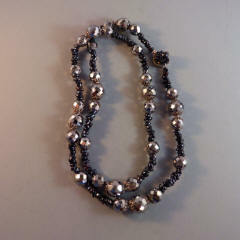 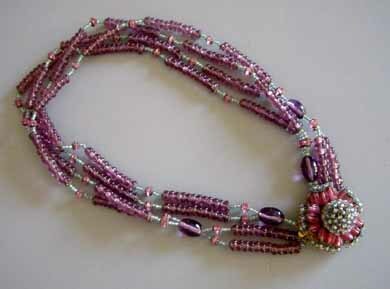 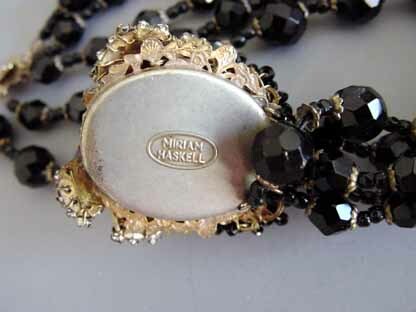 Millie Petronzio, current head designer at Haskell Jewelry, tightened and reworked pats of this necklace for me. 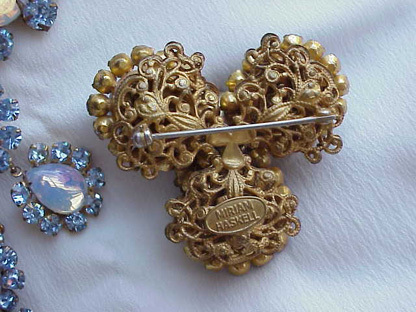 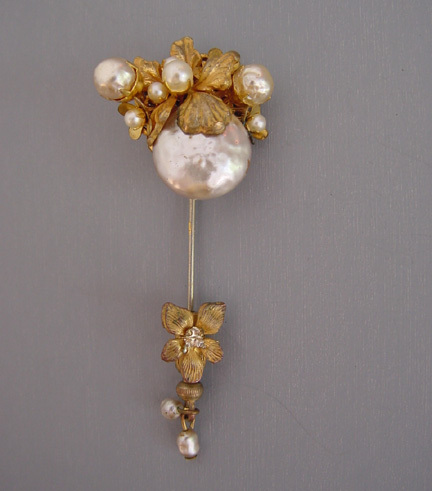 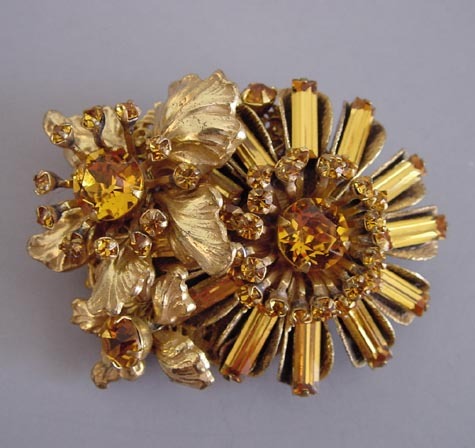 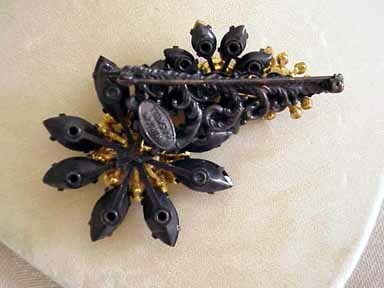 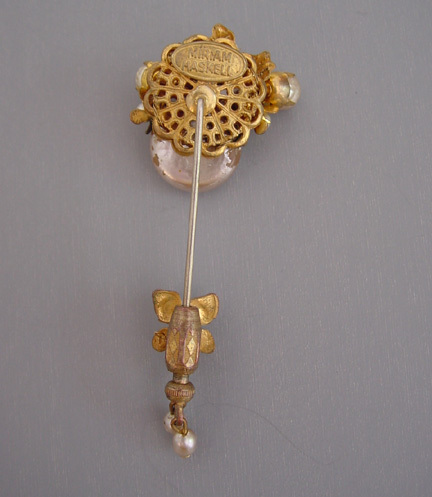 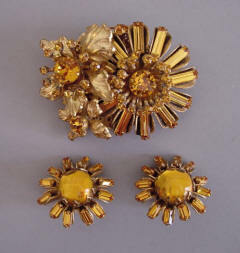 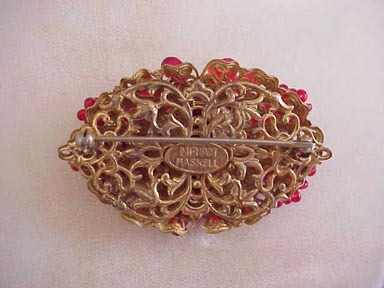 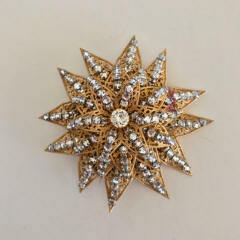 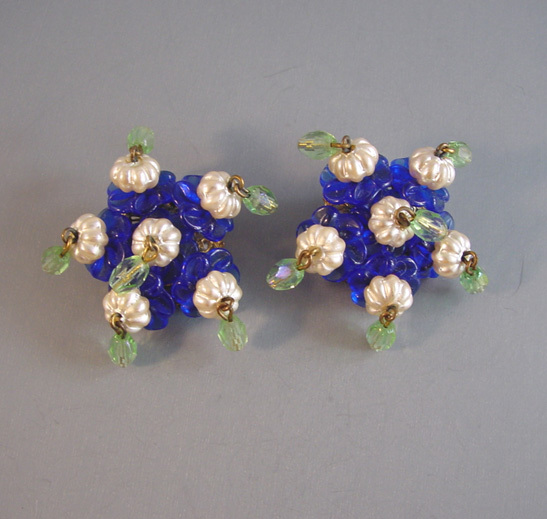 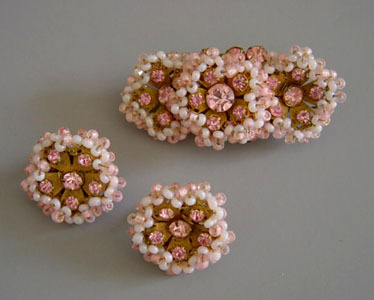 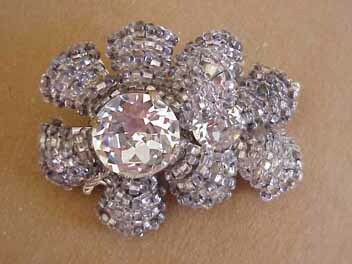 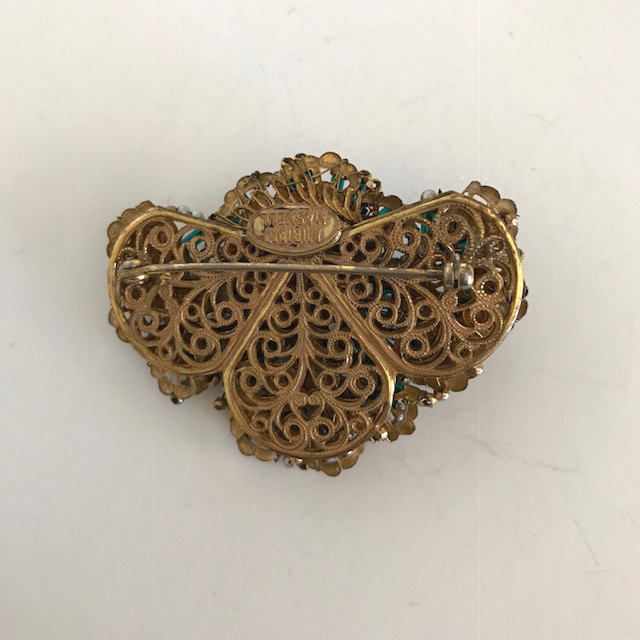 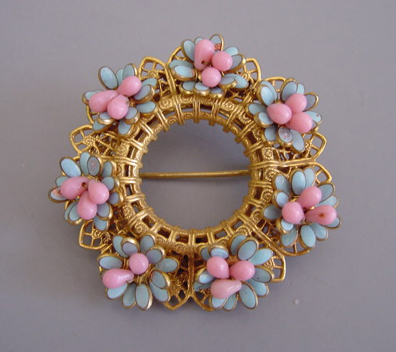 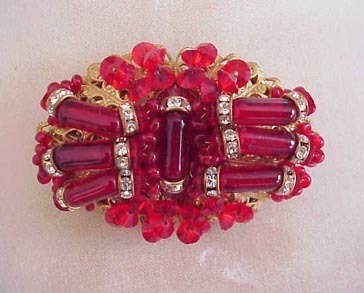 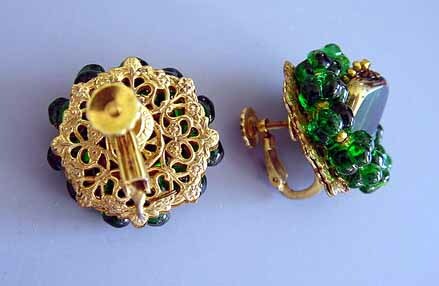 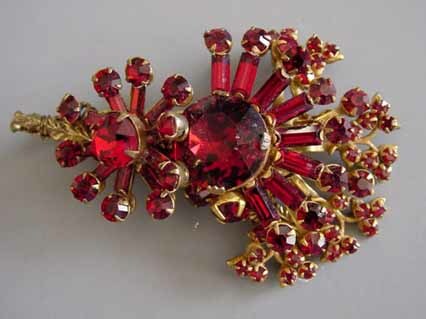 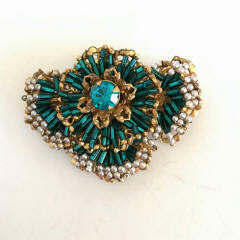 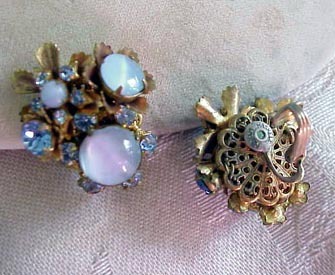 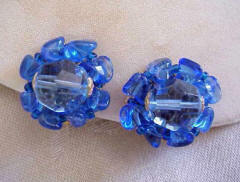 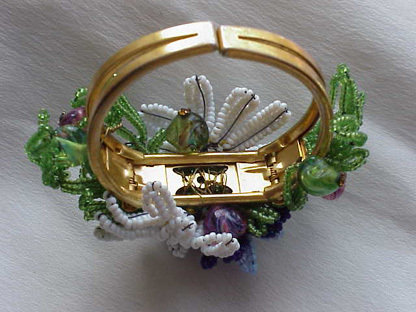 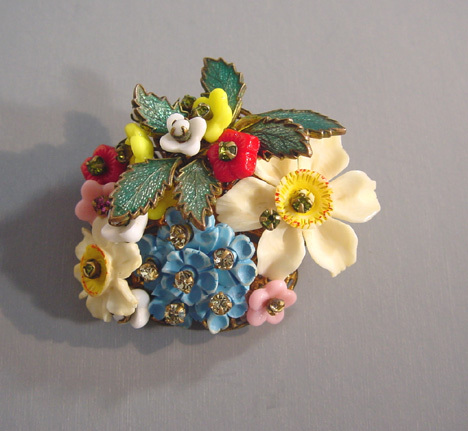 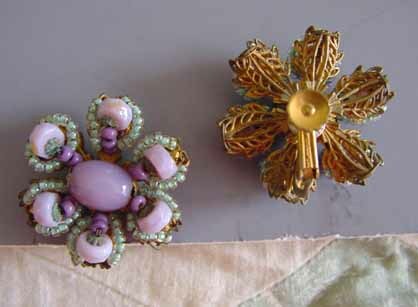 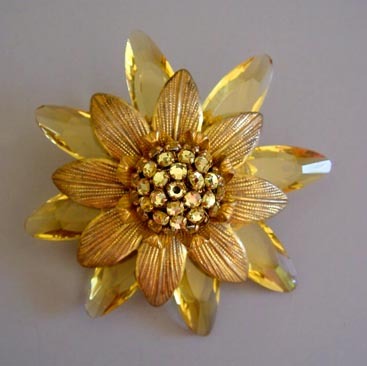 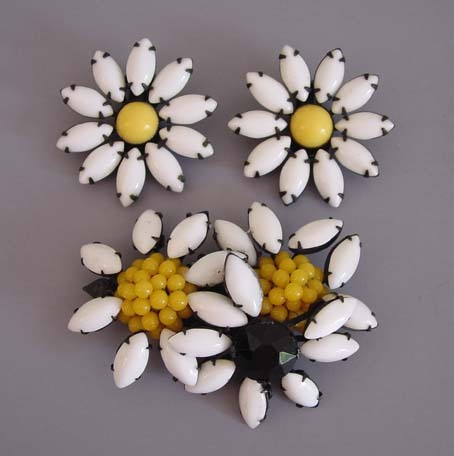 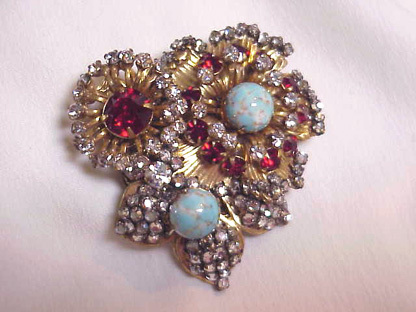 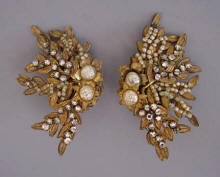 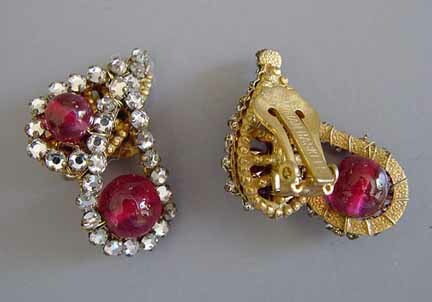 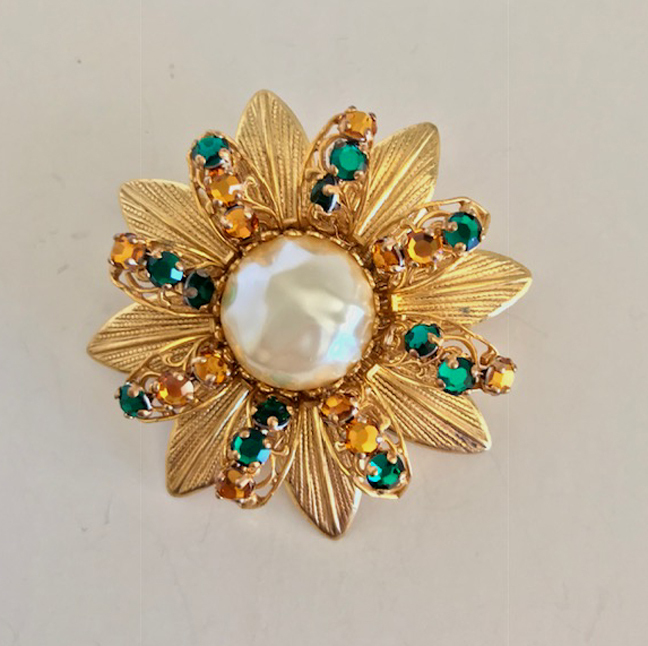 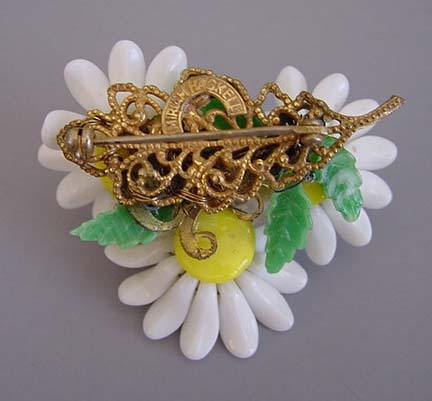 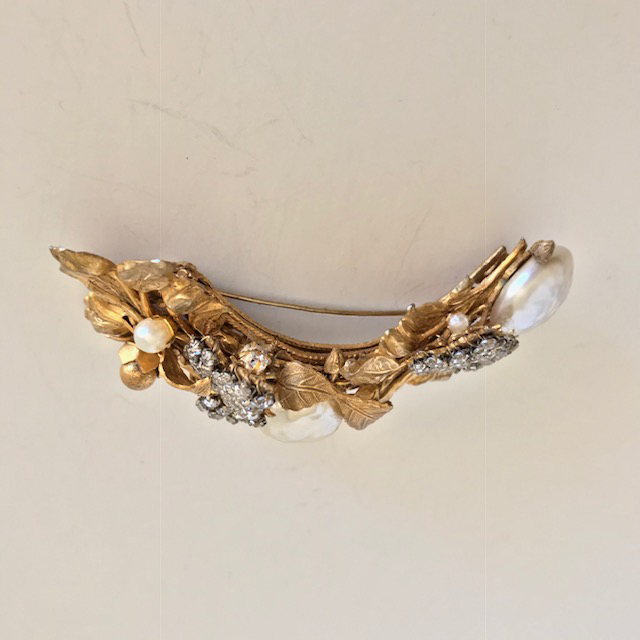 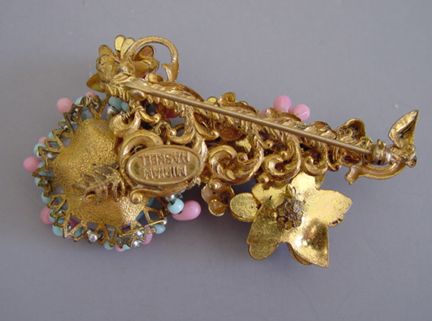 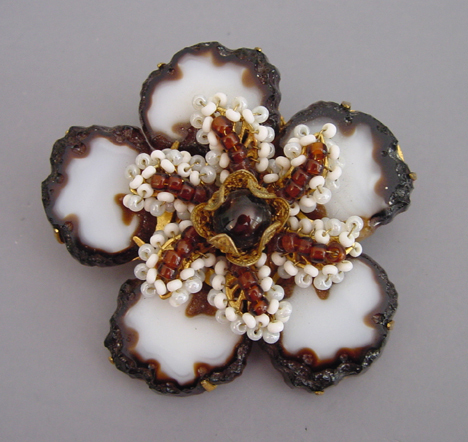 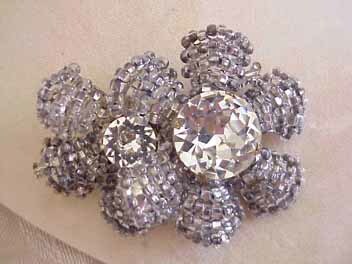 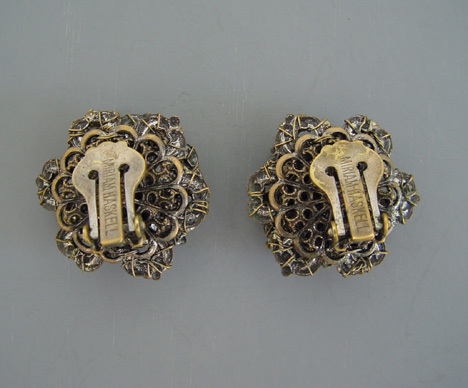 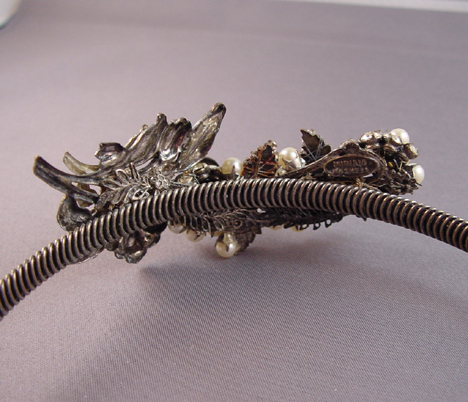 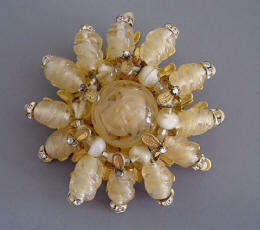 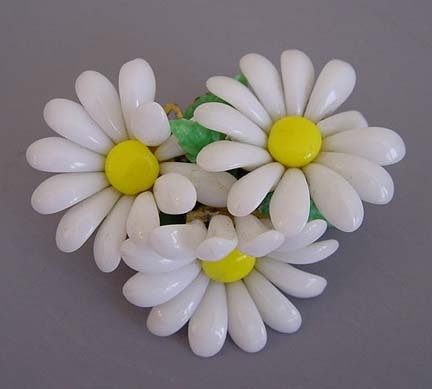 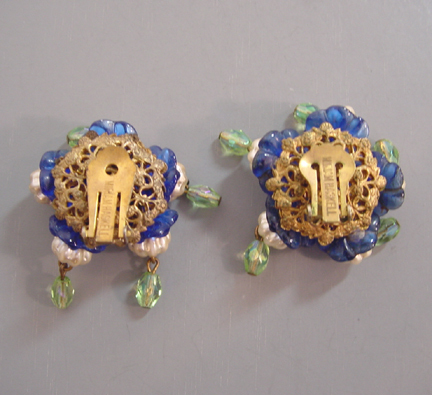 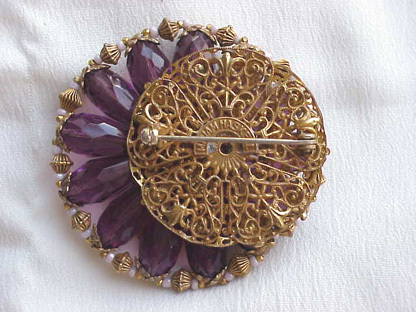 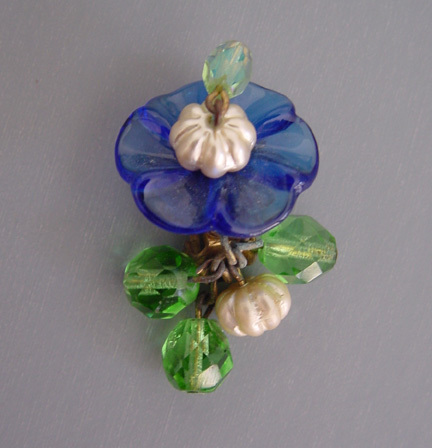 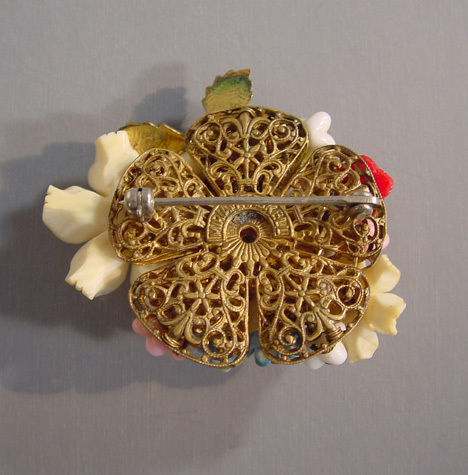 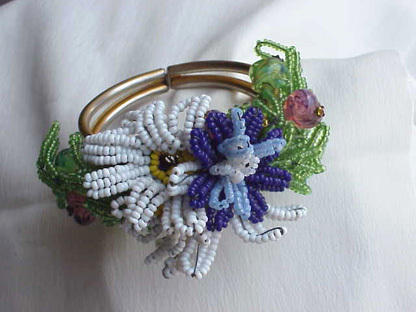 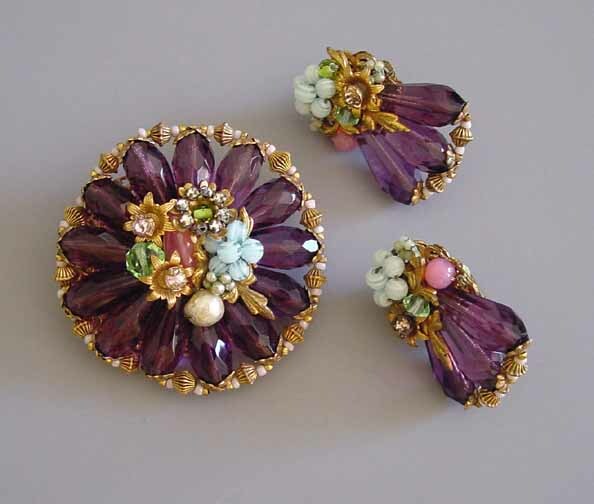 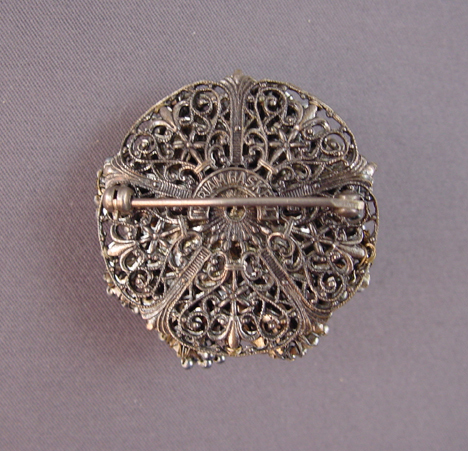 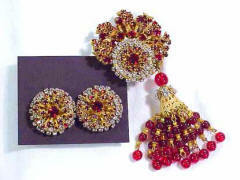 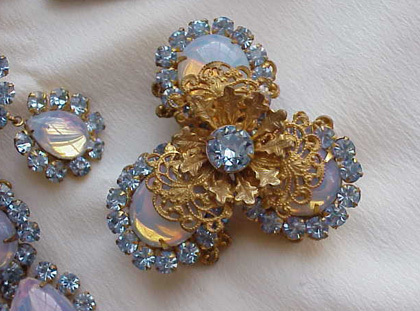 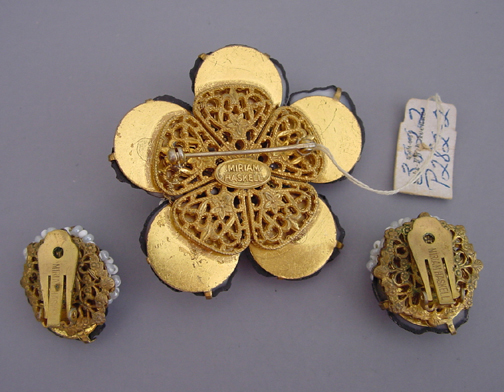 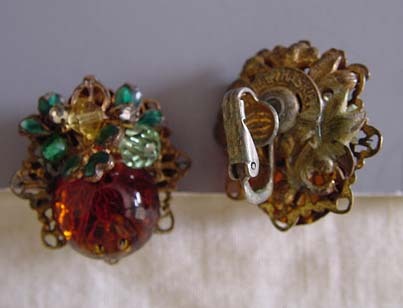 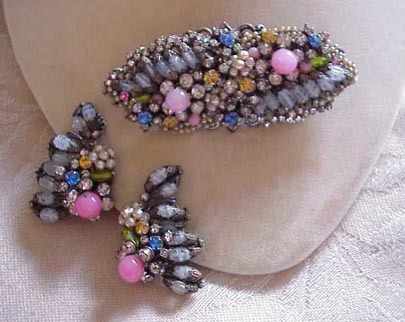 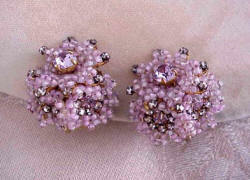 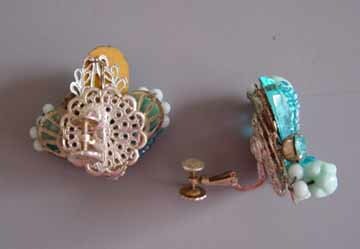 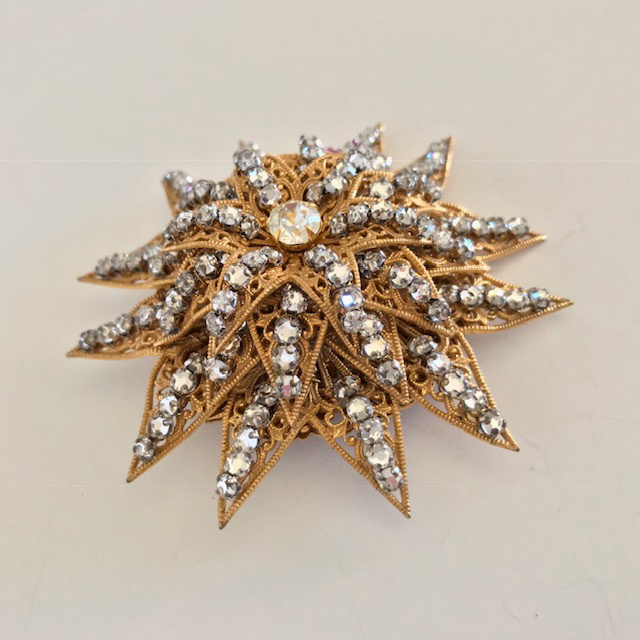 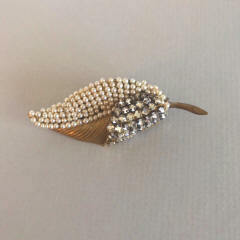 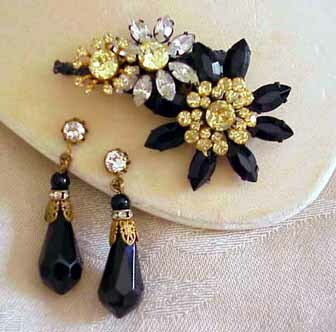 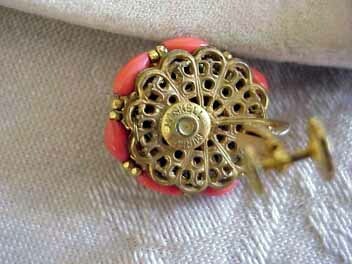 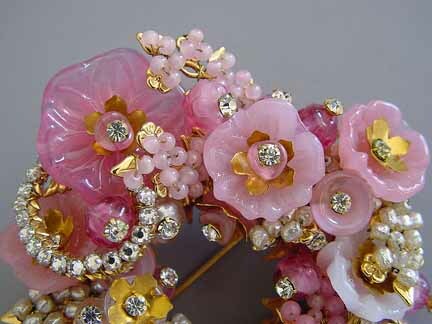 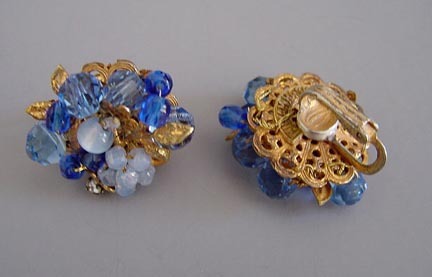 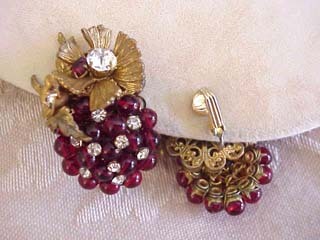 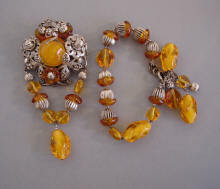 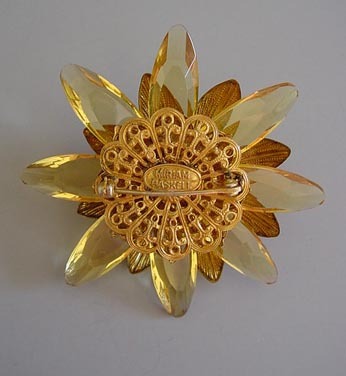 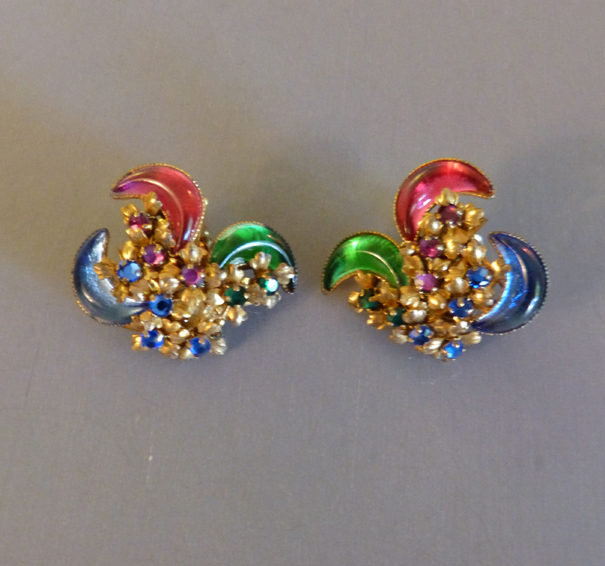 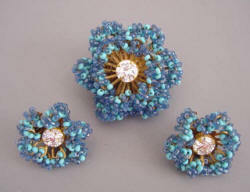 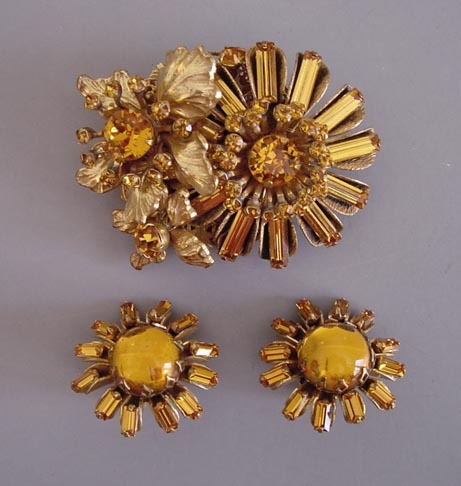 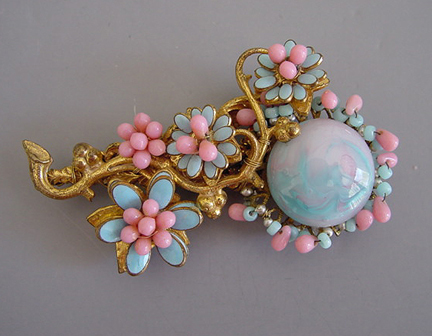 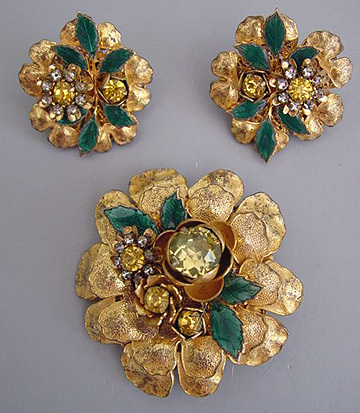 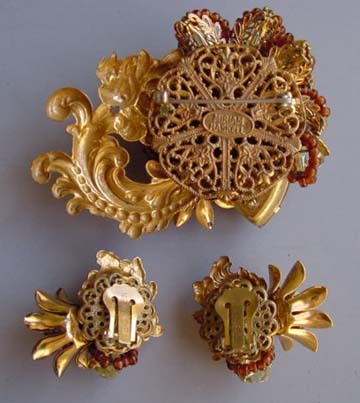 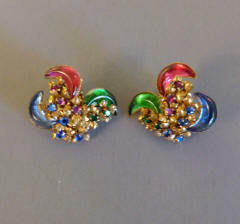 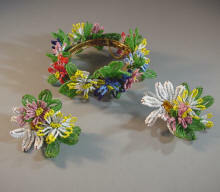 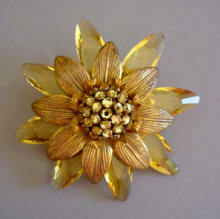 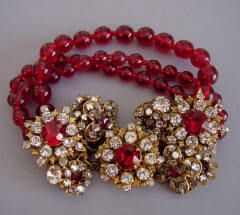 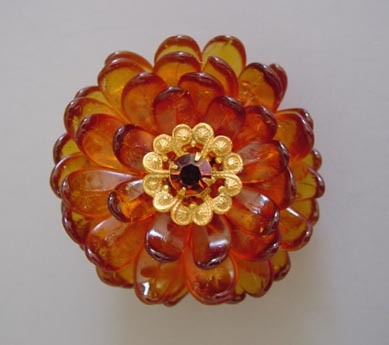 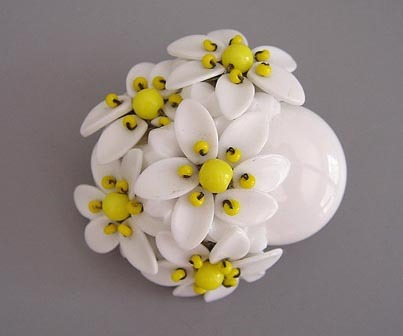 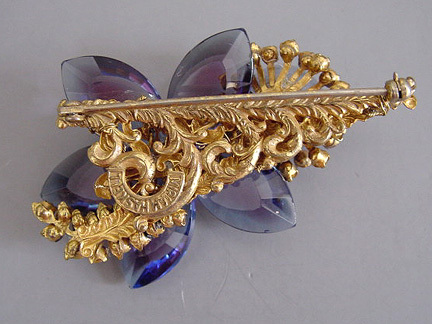 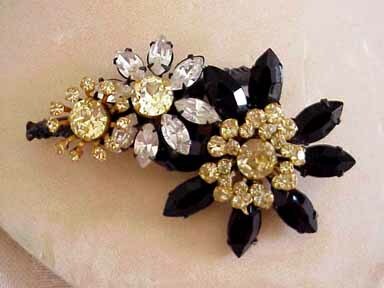 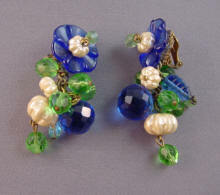 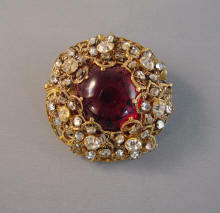 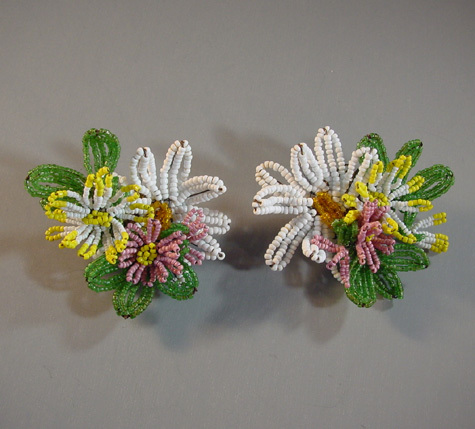 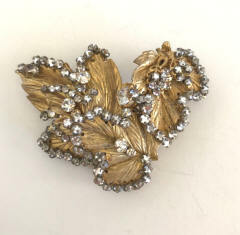 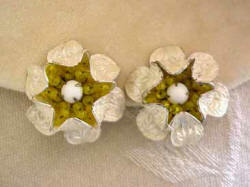 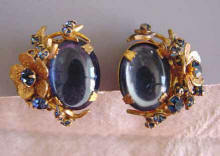 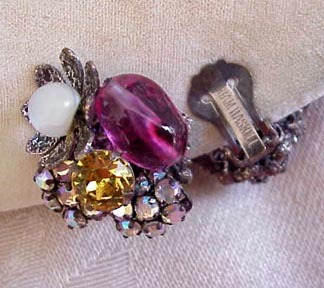 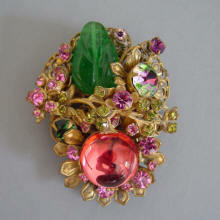 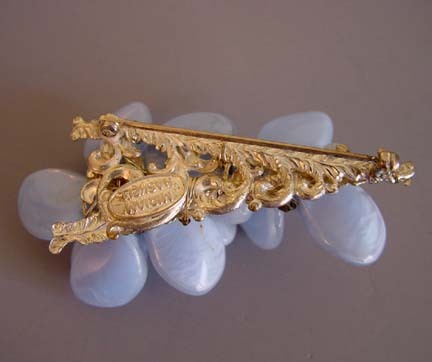 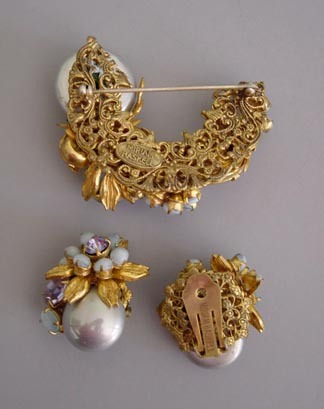 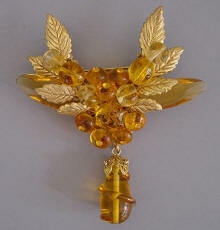 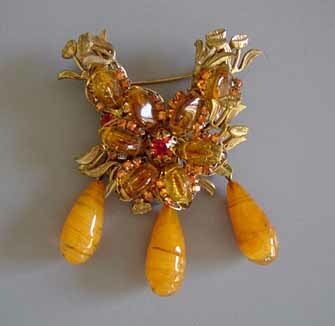 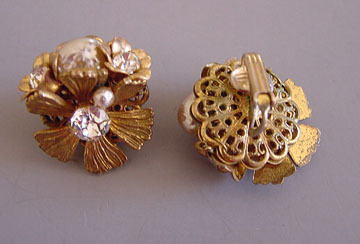 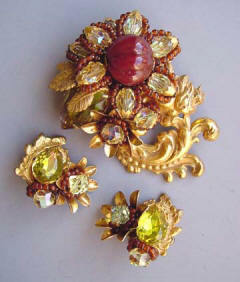 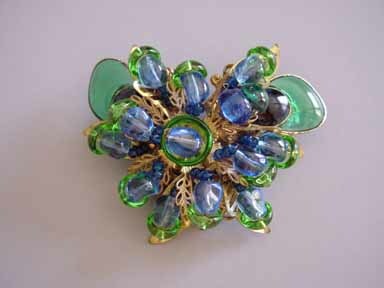 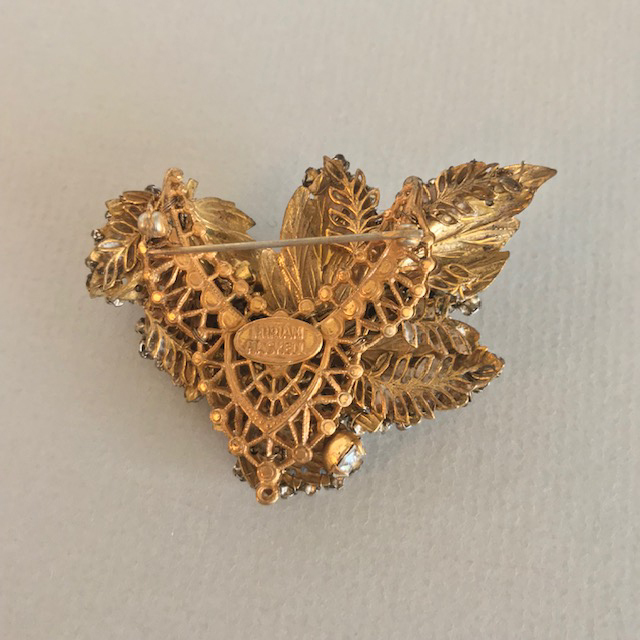 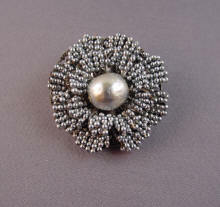 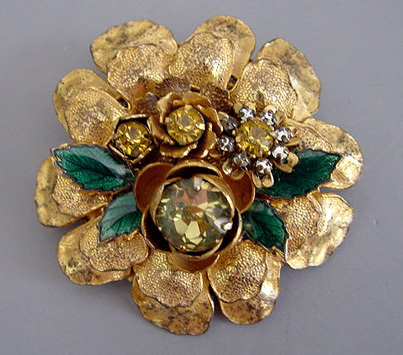 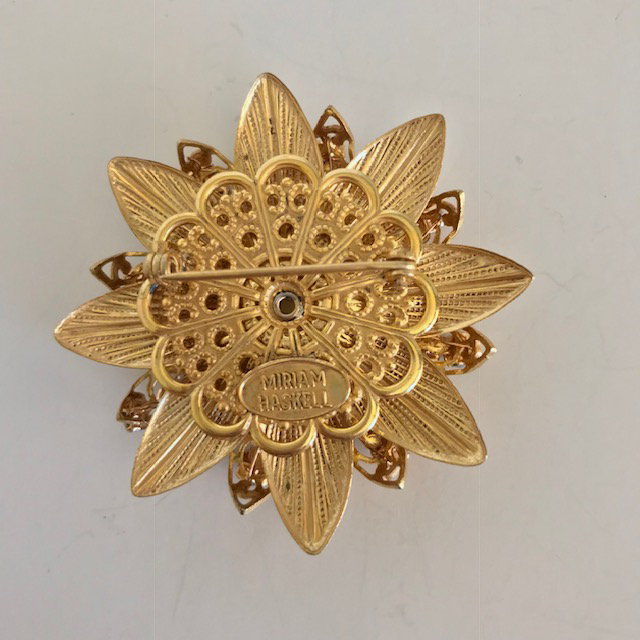 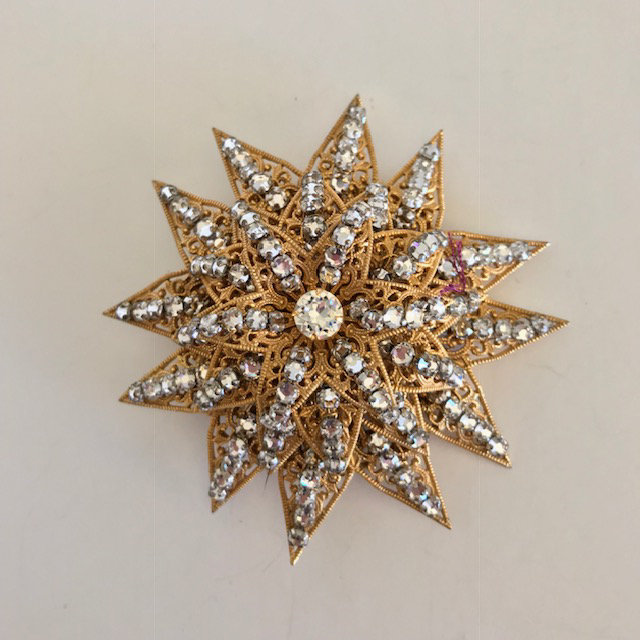 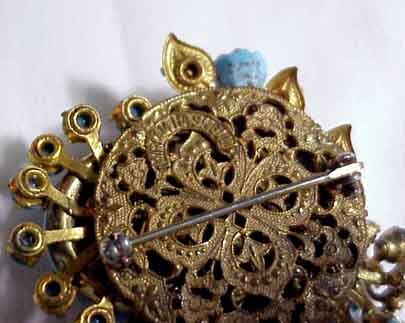 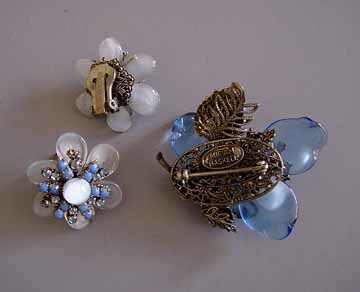 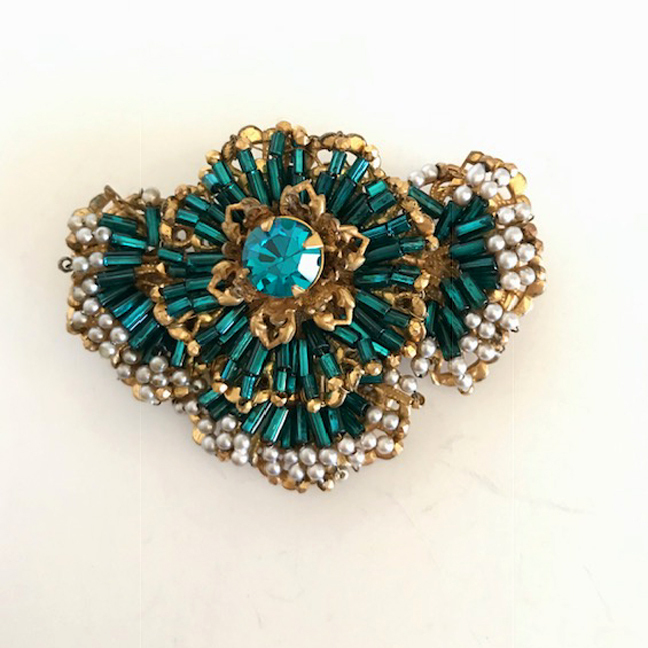 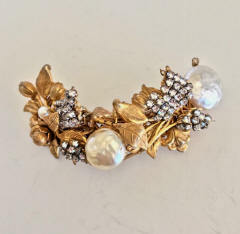 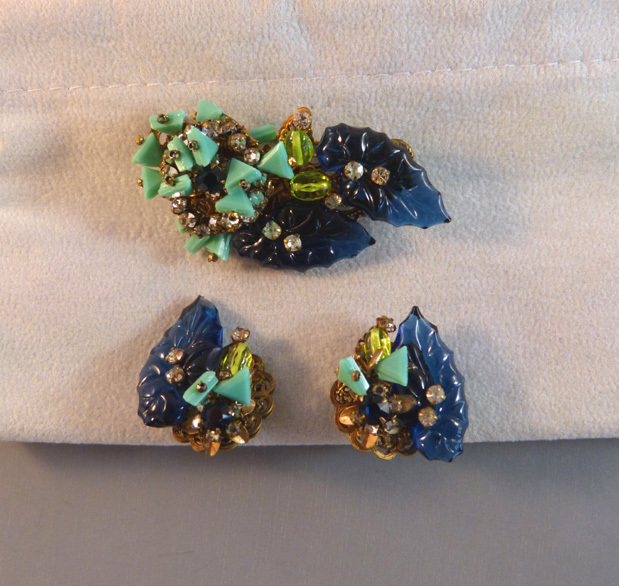 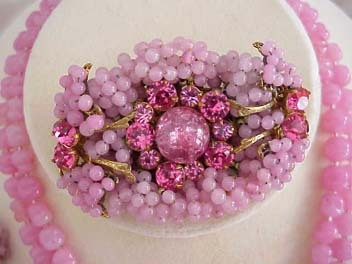 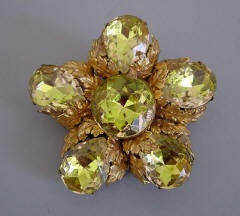 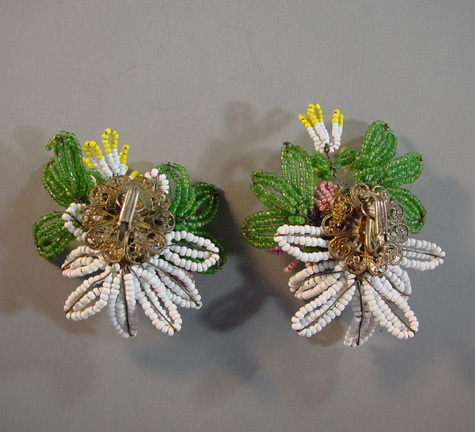 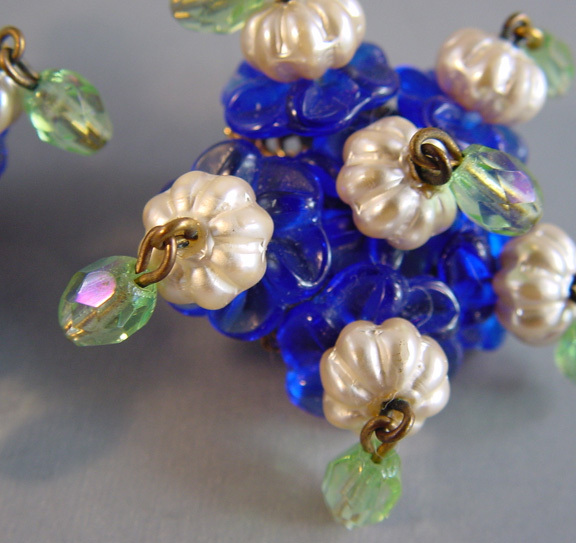 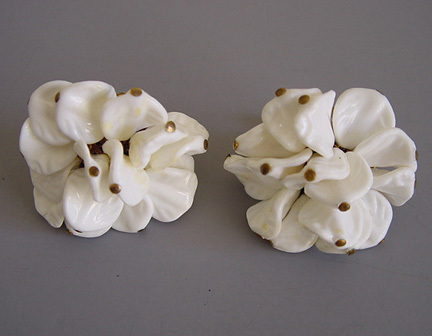 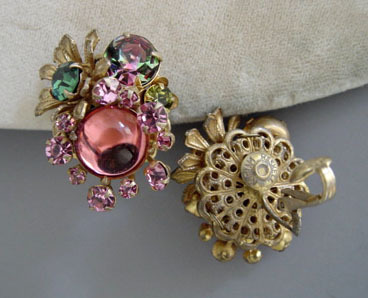 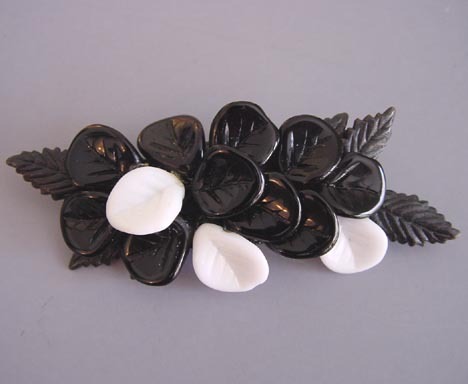 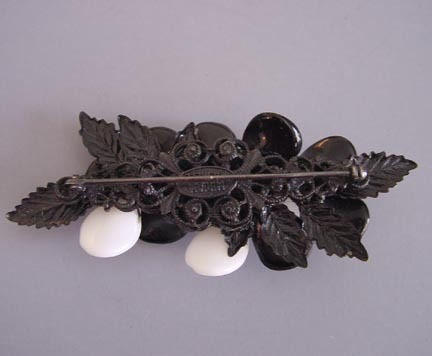 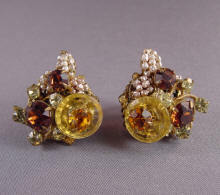 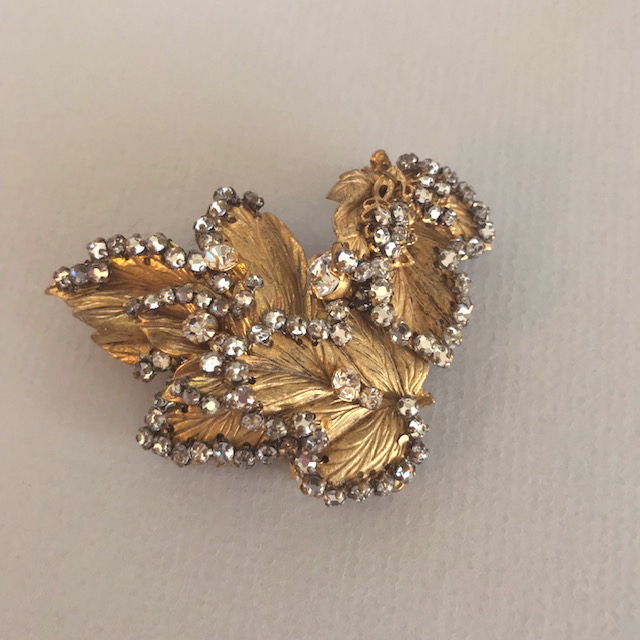 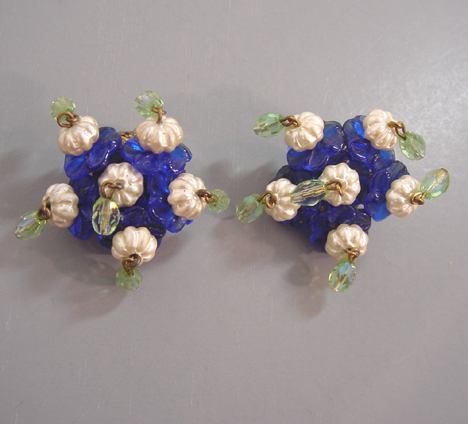 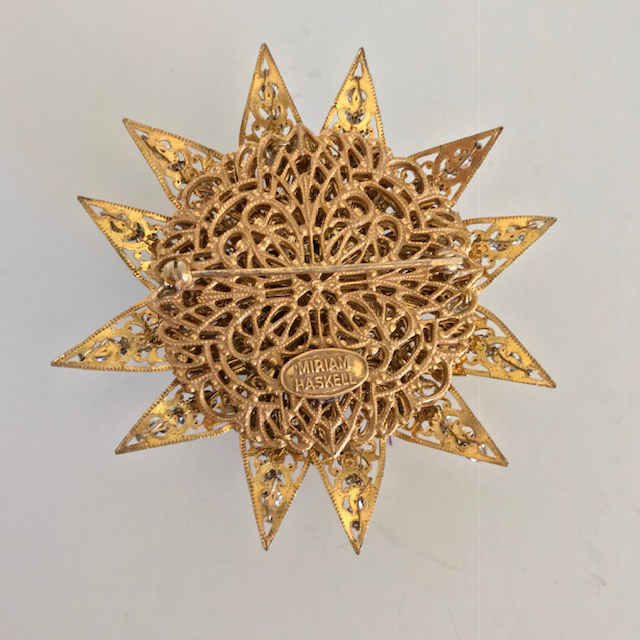 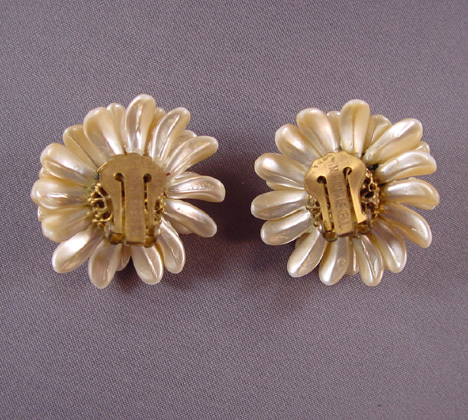 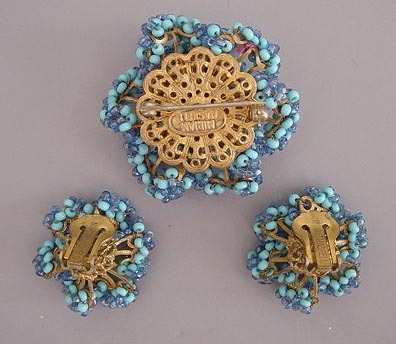 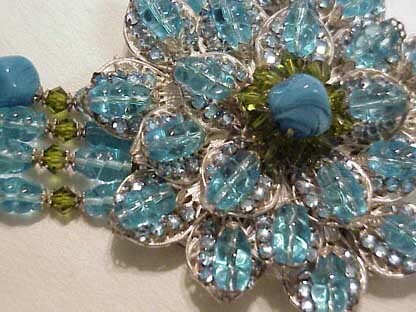 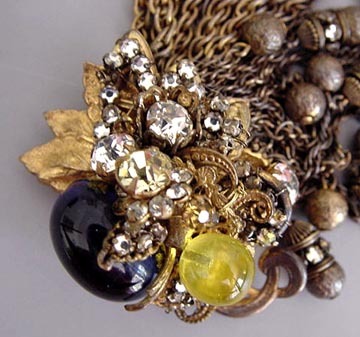 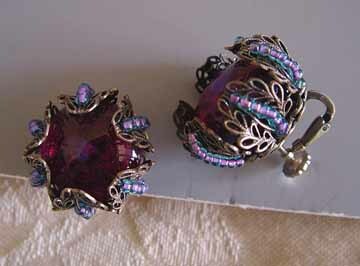 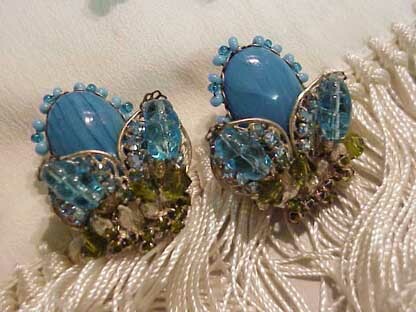 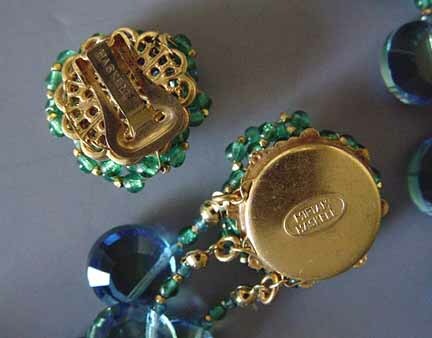 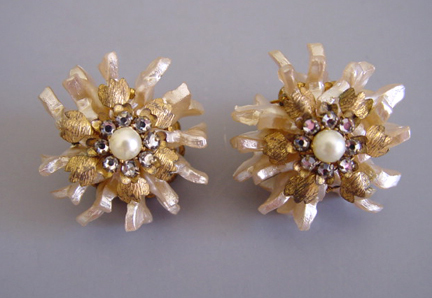 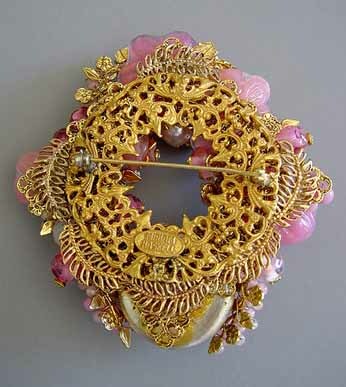 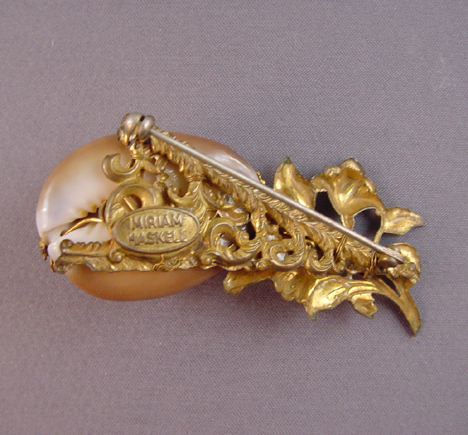 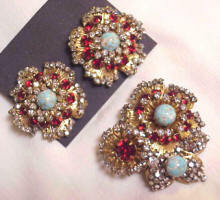 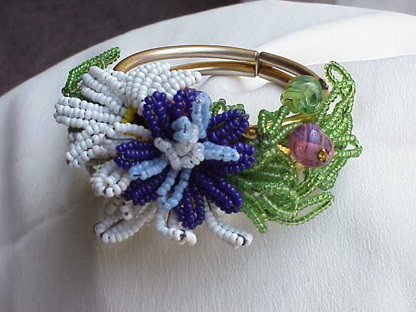 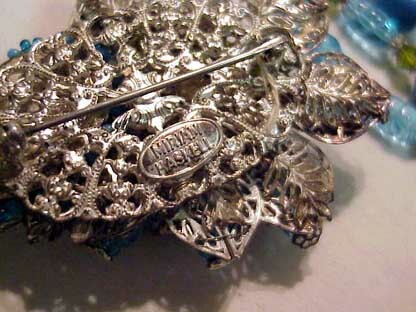 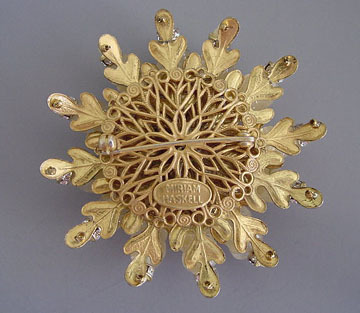 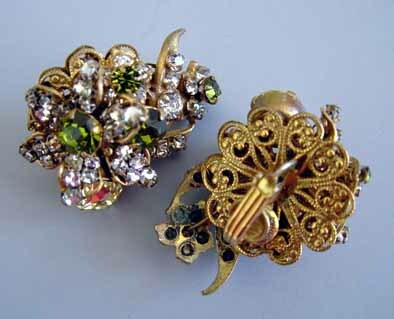 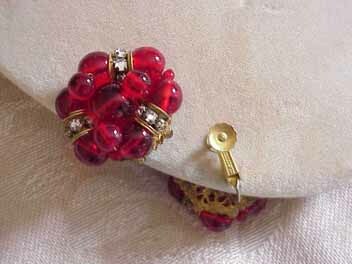 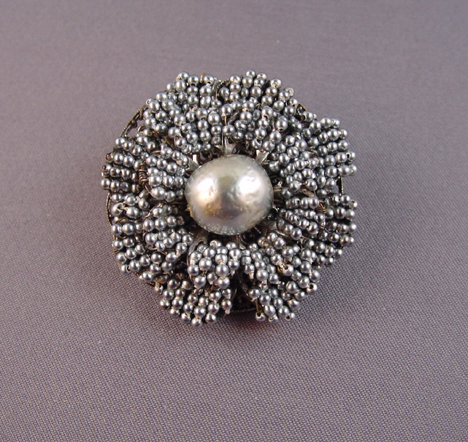 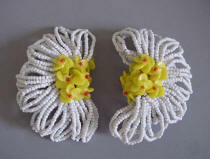 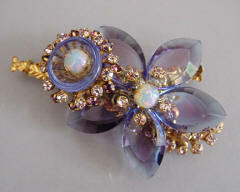 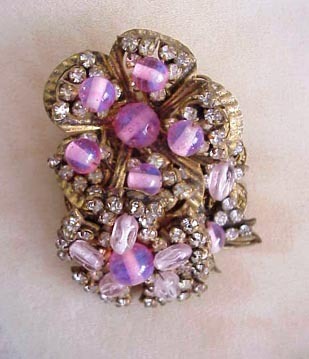 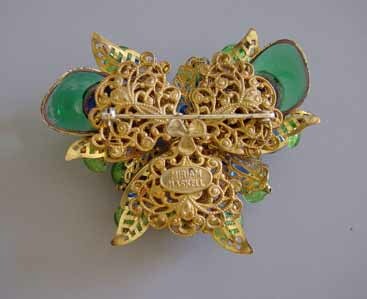 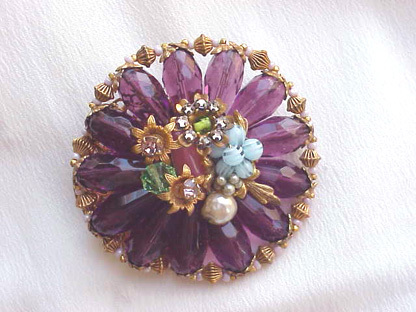 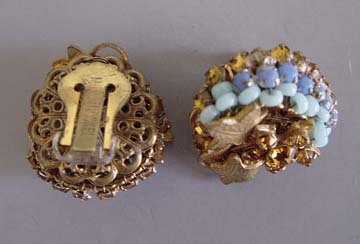 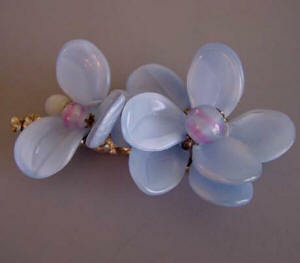 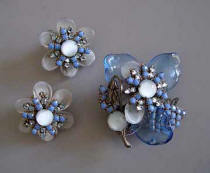 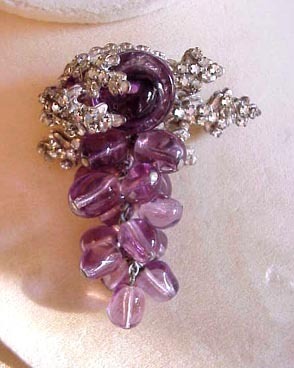 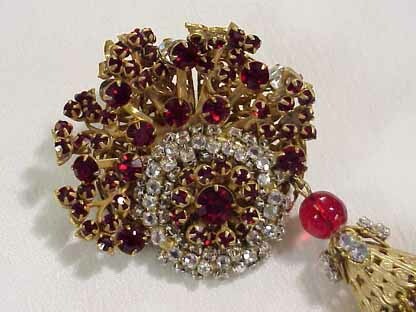 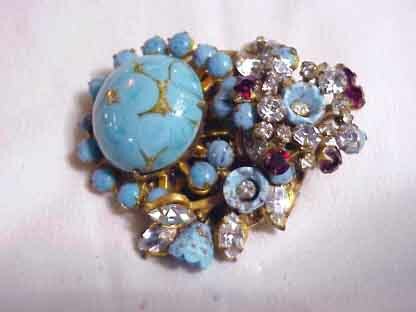 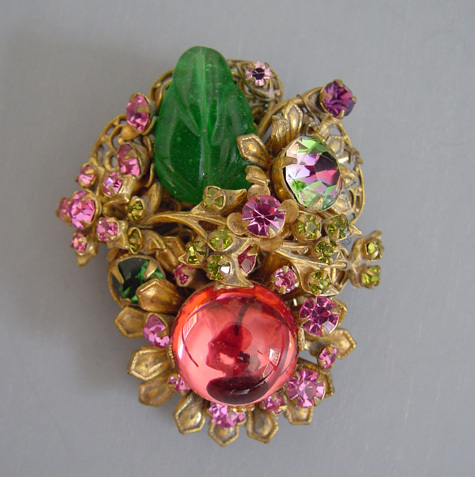 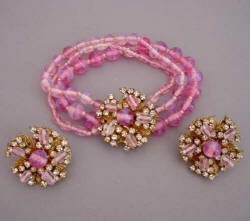 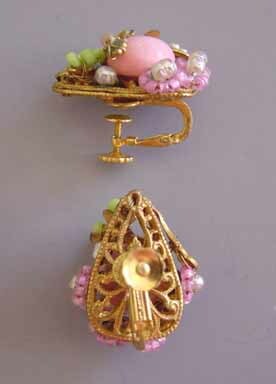 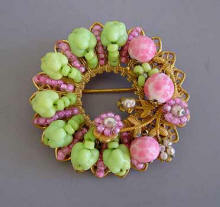 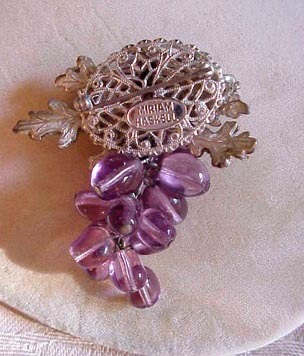 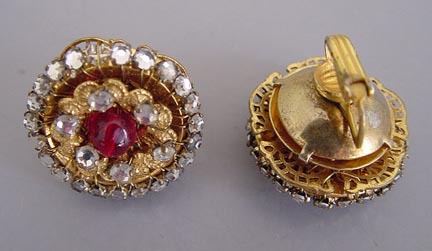 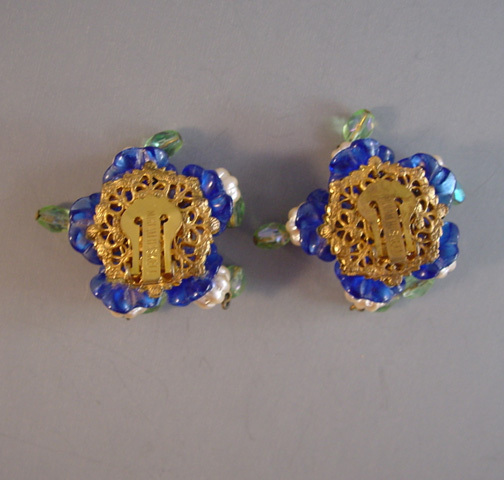 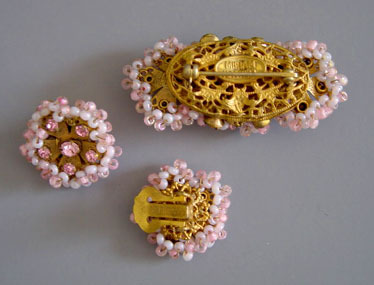 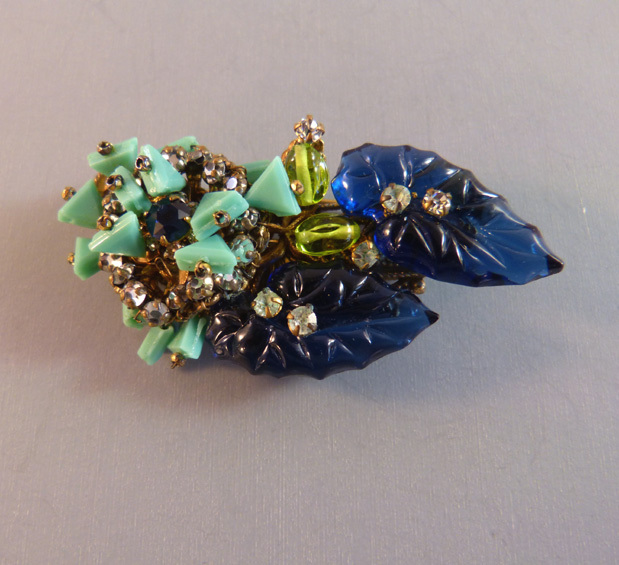 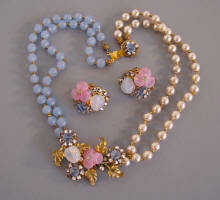 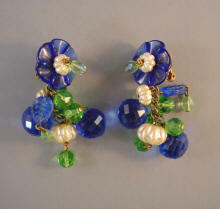 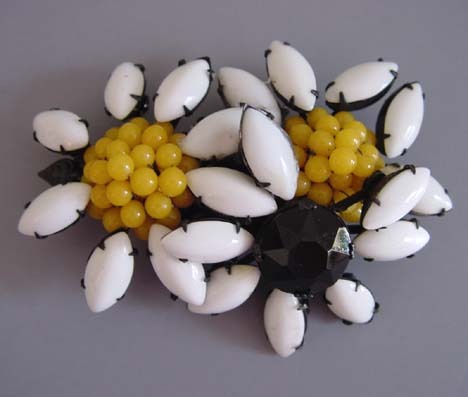 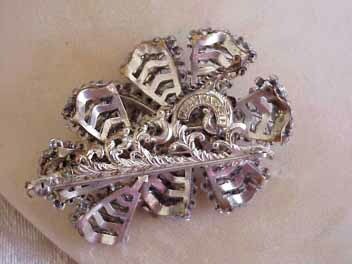 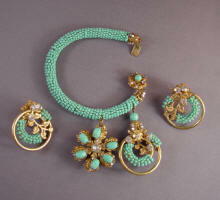 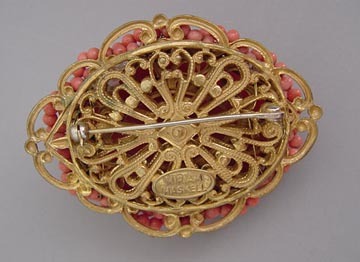 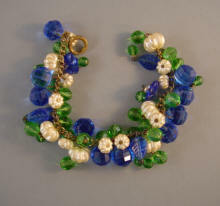 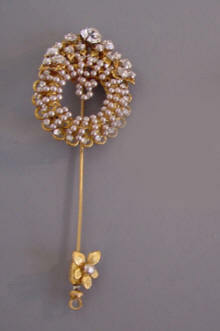 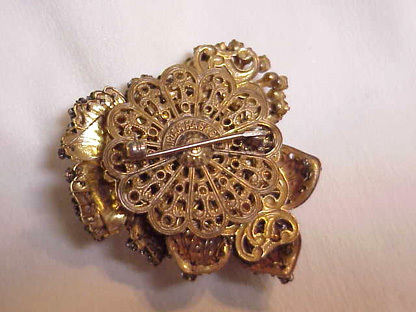 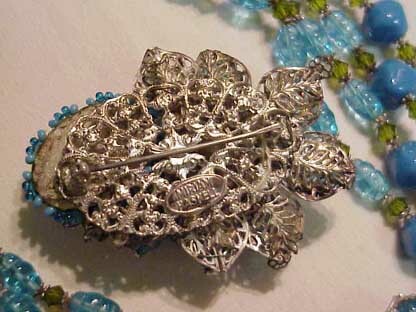 The matching 2-1/2" wide brooch was created from vintage parts, also by Millie Petronzio, especially to go with this set. 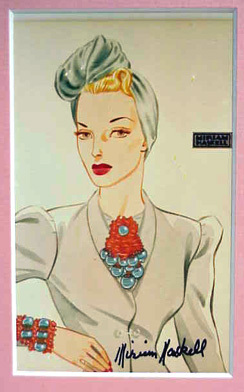 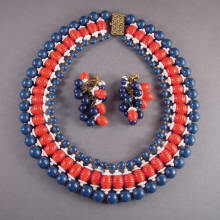 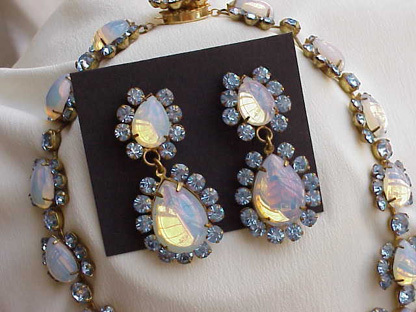 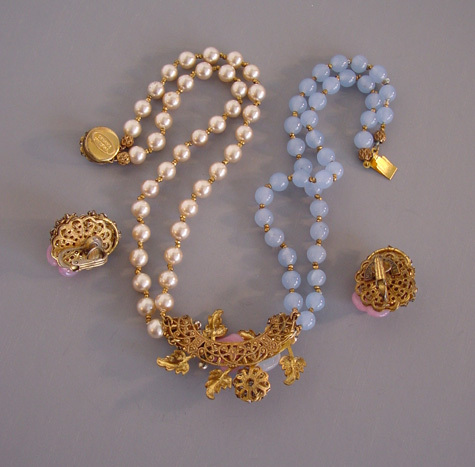 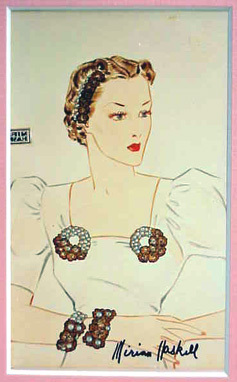 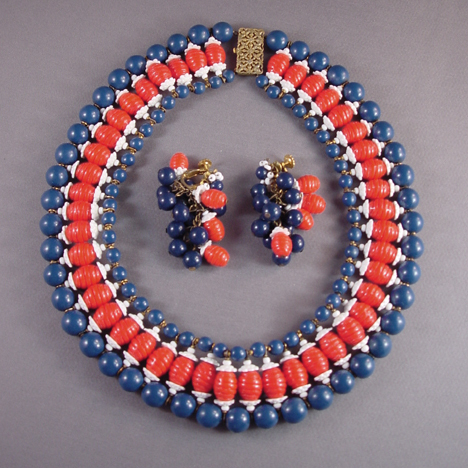 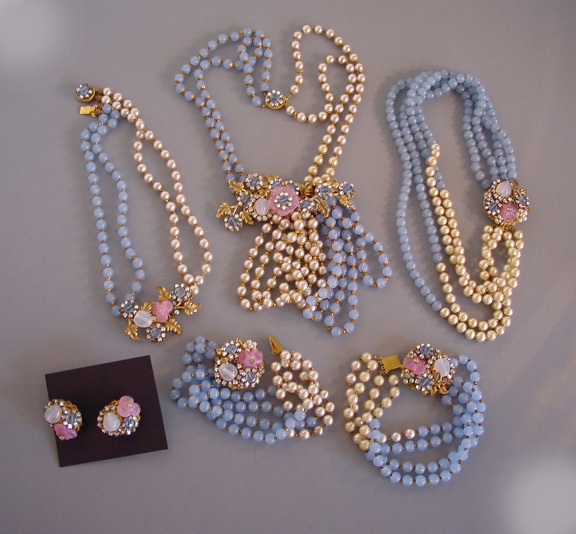 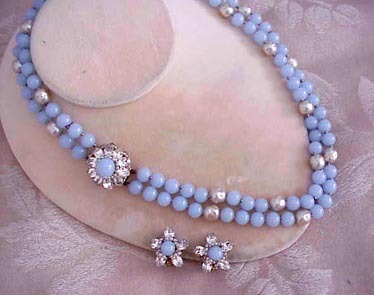 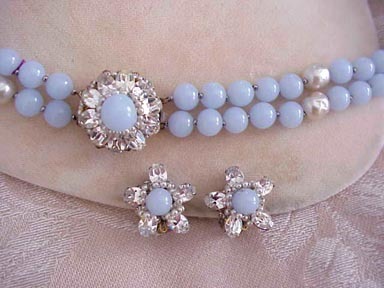 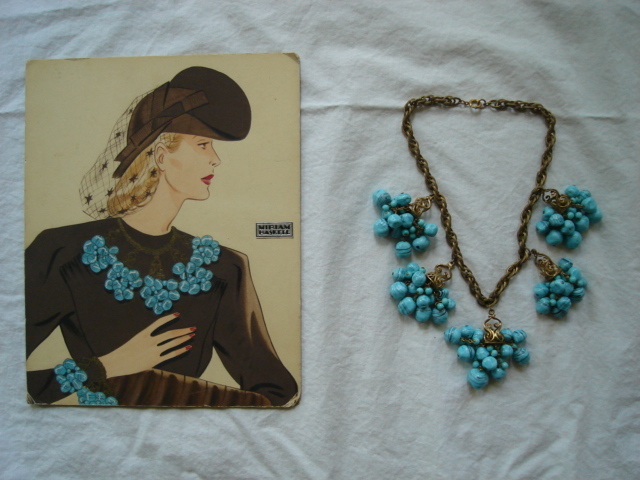 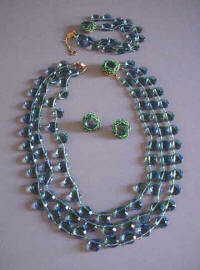 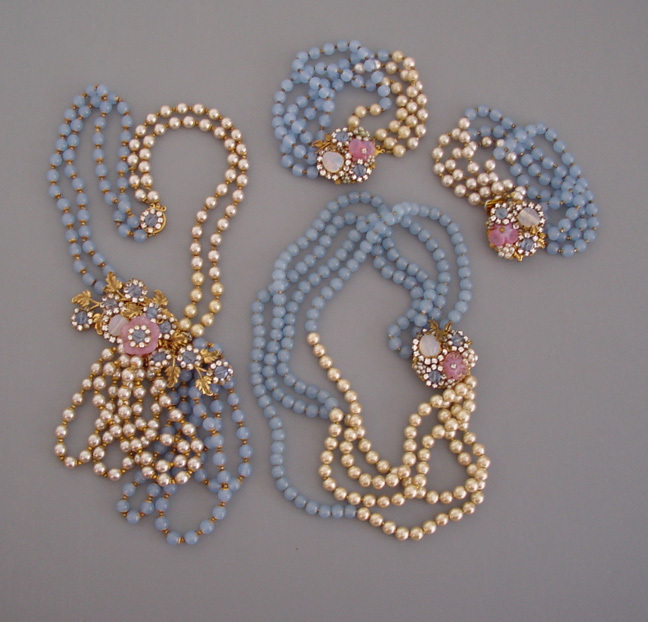 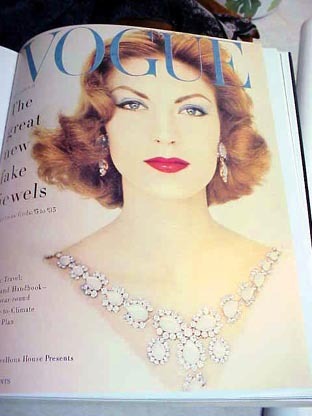 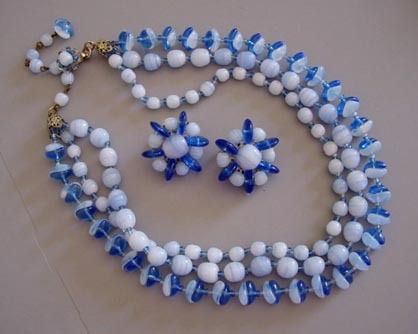 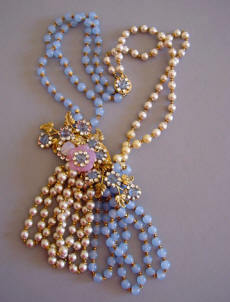 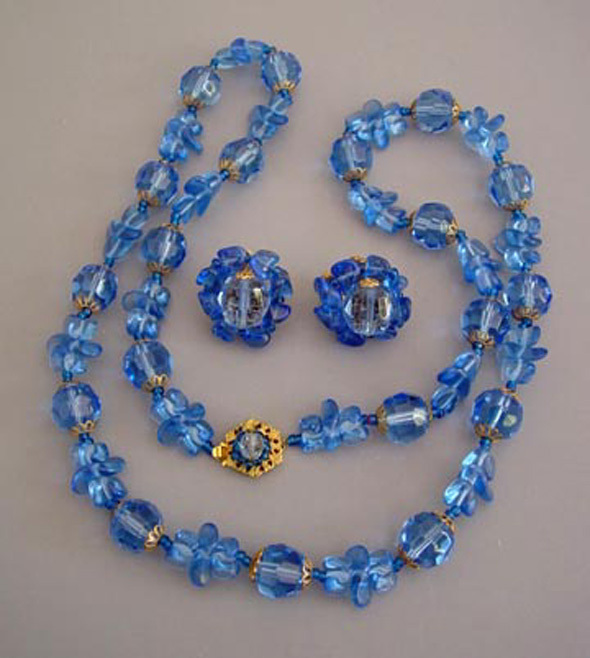 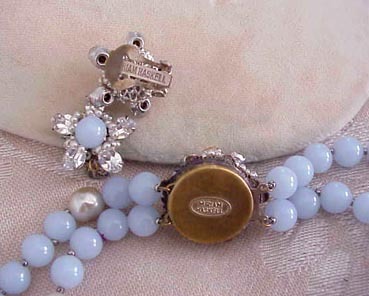 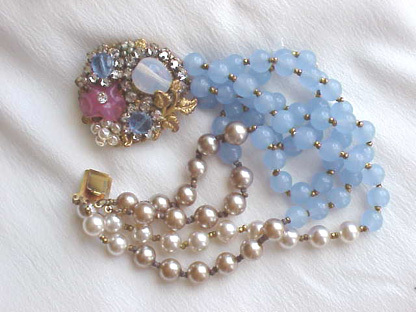 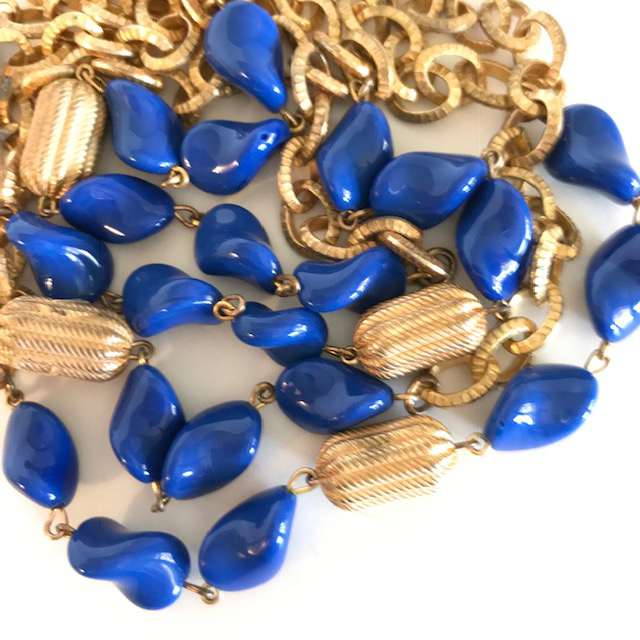 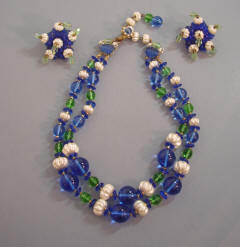 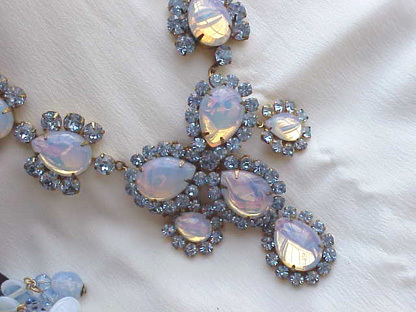 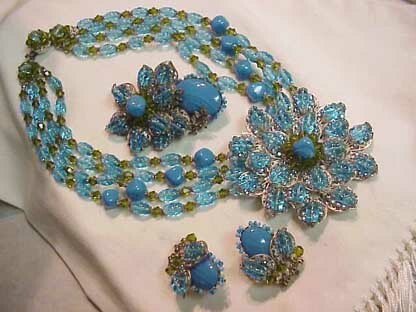 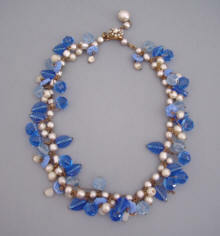 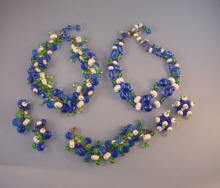 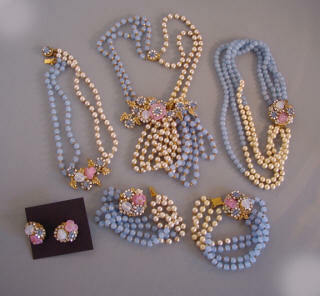 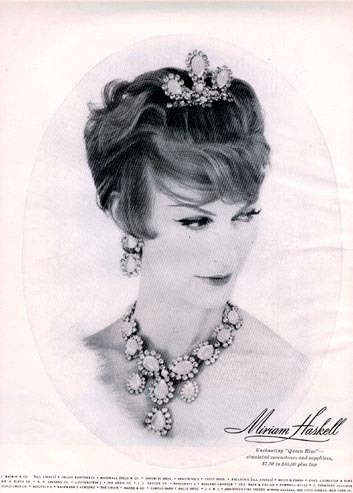 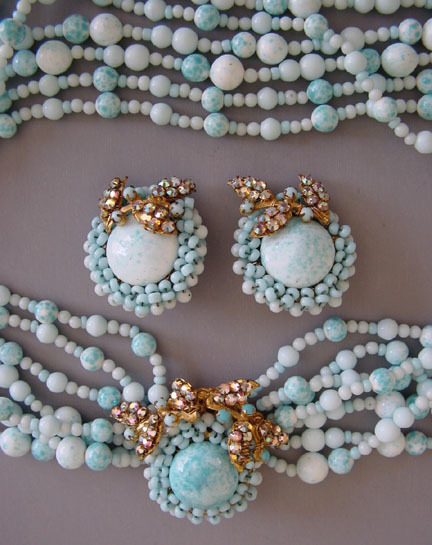 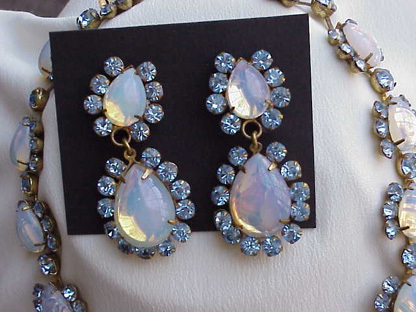 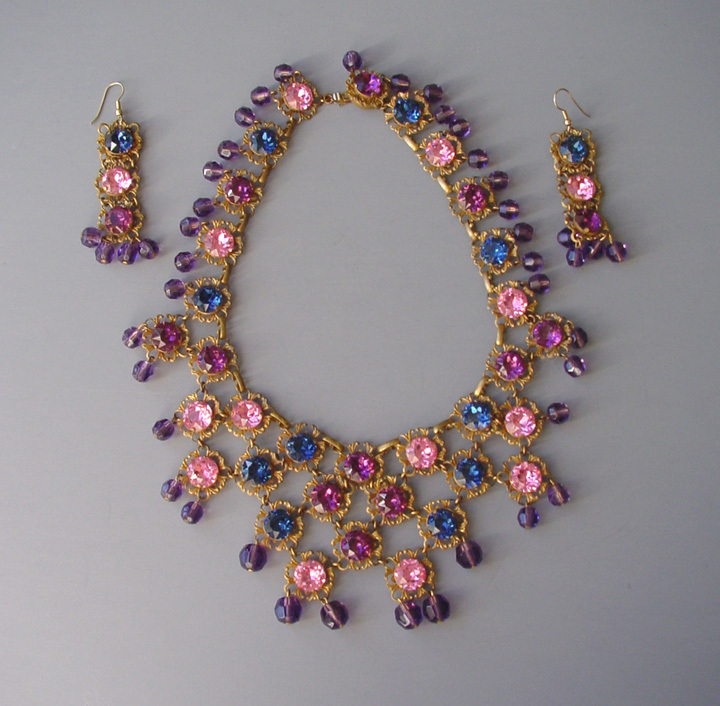 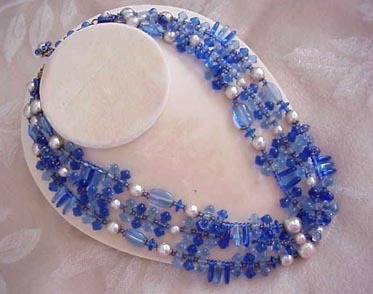 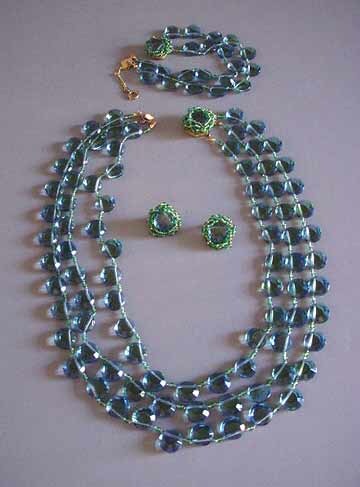 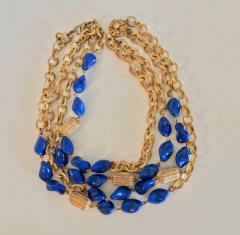 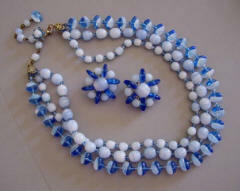 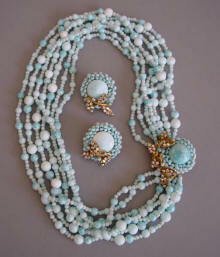 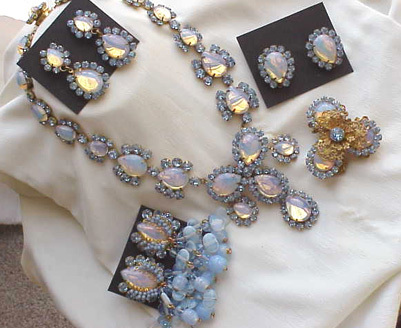 Haskell "Queen Blue" necklace and earrings ad as seen on cover of VOGUE. 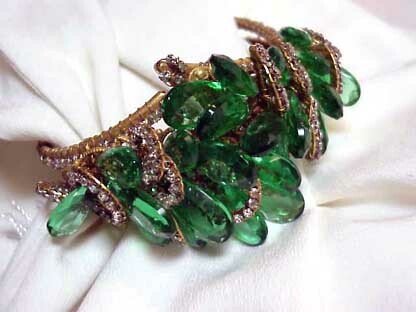 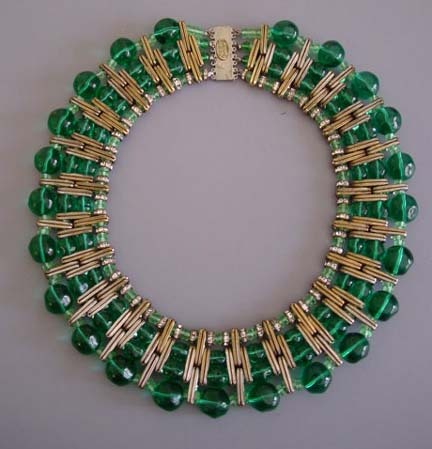 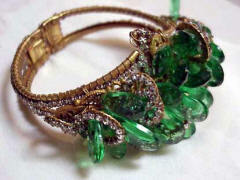 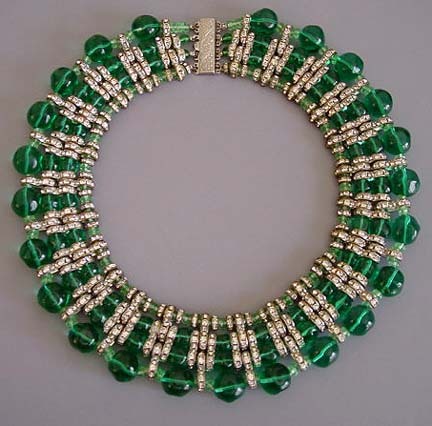 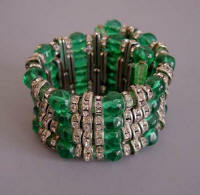 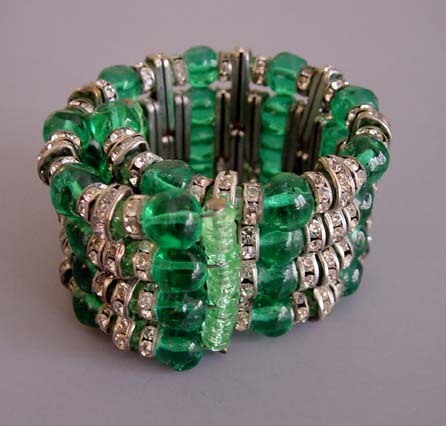 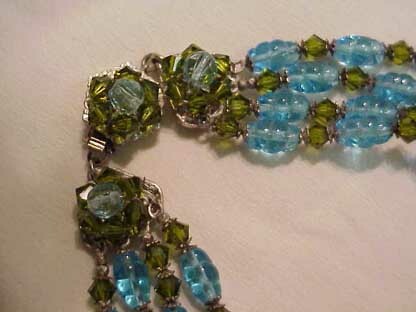 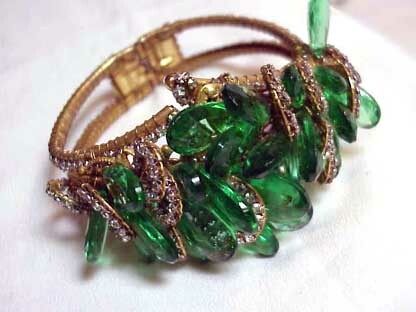 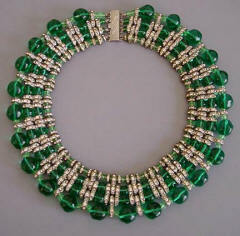 HASKELL Hess early unsigned green glass melon-shaped beads and clear rhinestone roundelles coil bracelet, circa 1940, 6-1/2" by 1-1/3". 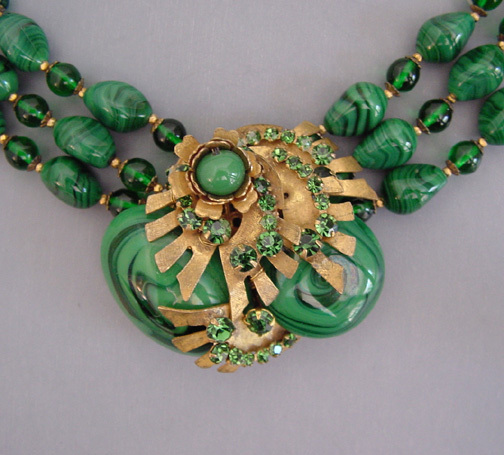 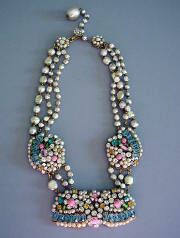 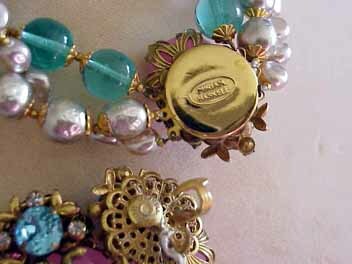 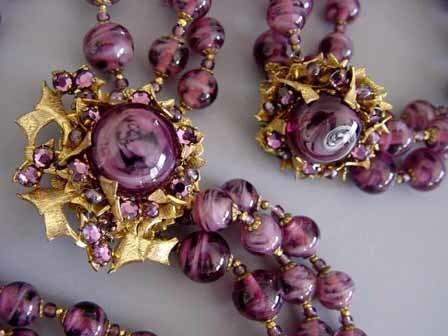 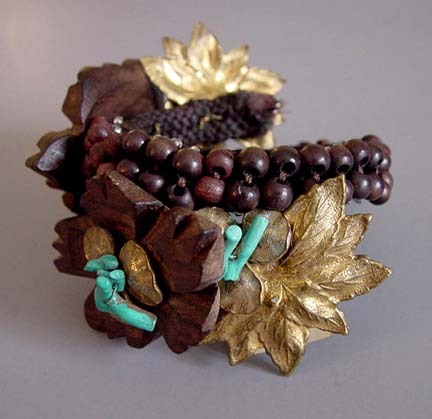 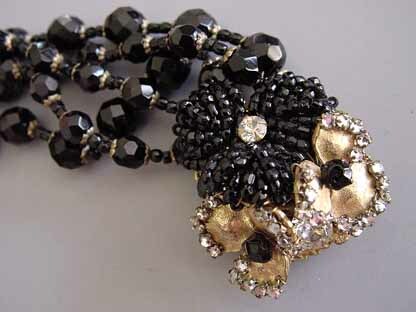 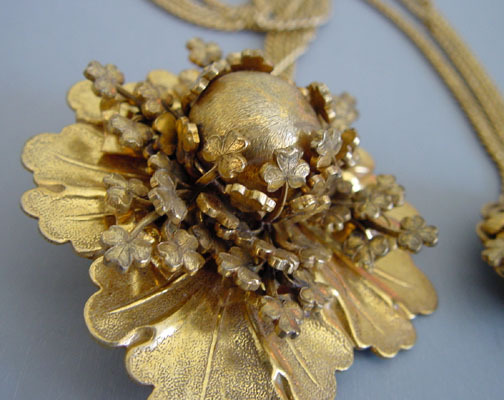 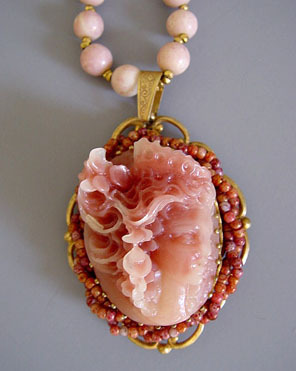 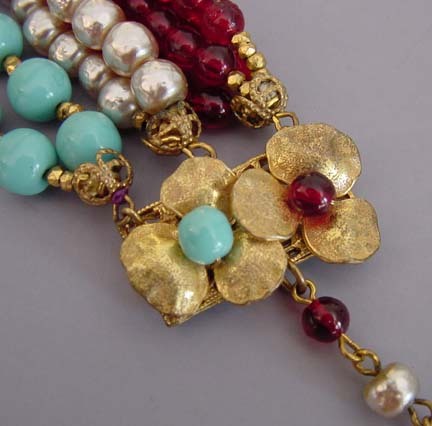 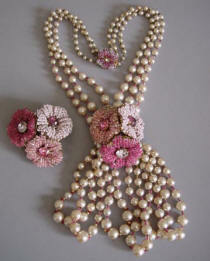 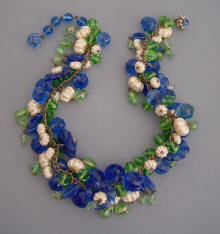 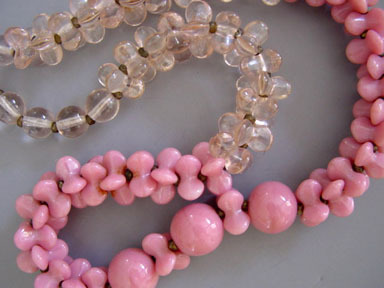 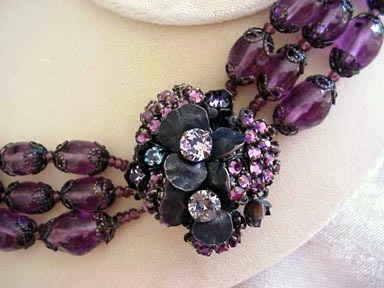 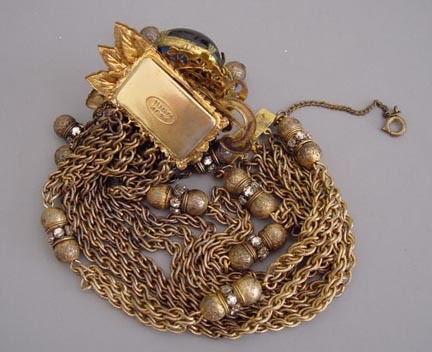 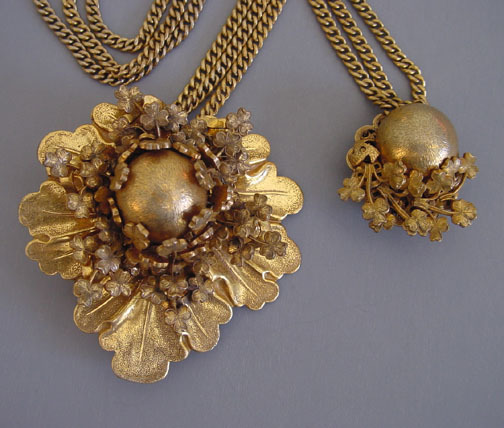 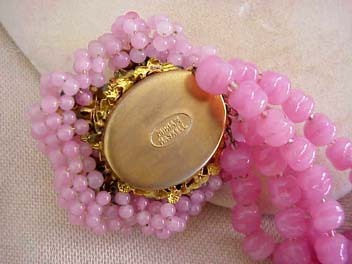 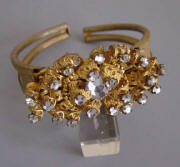 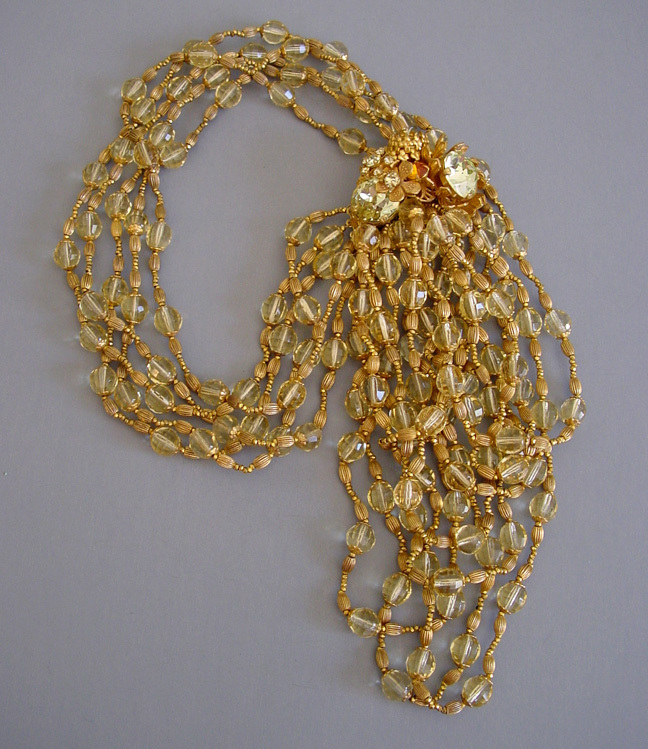 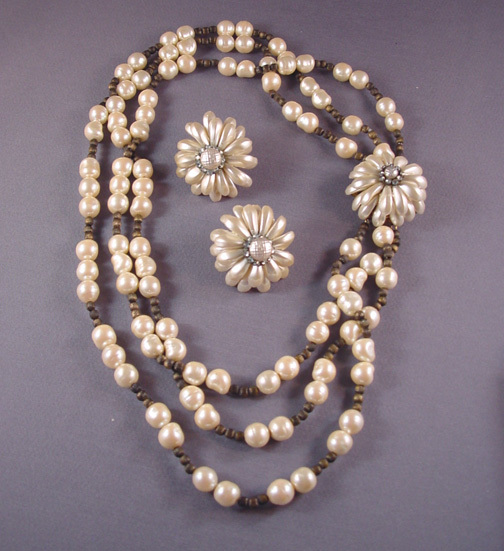 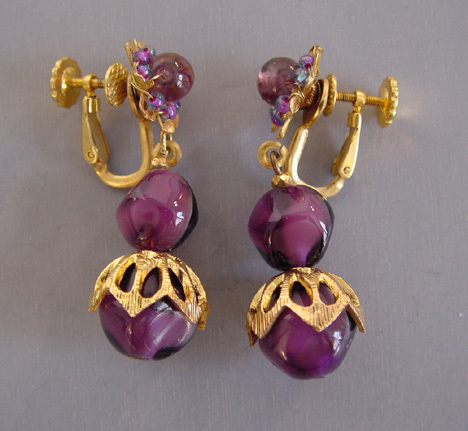 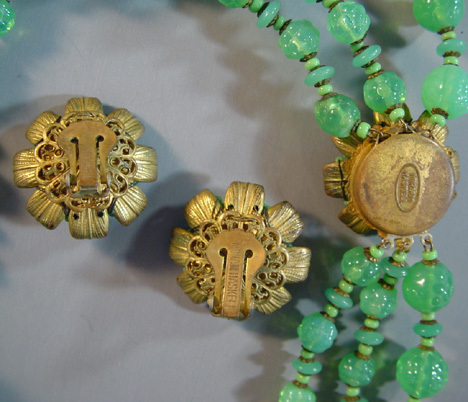 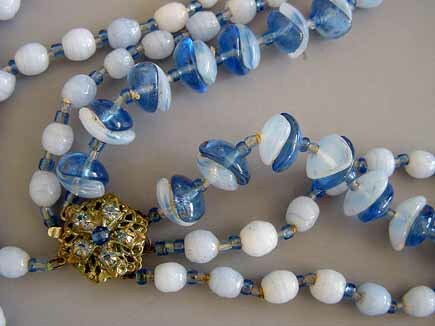 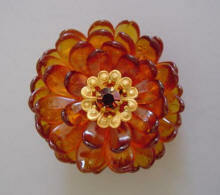 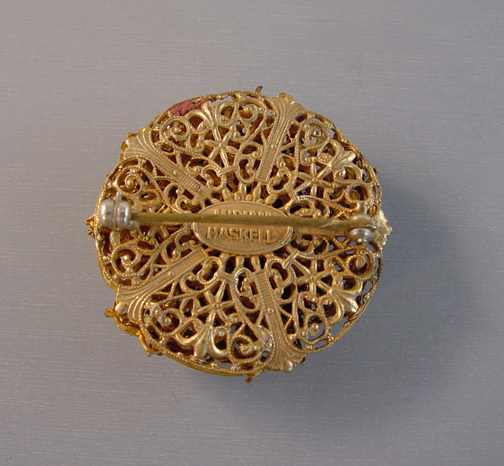 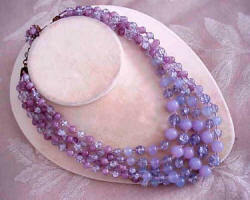 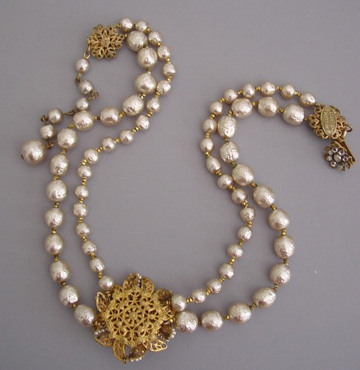 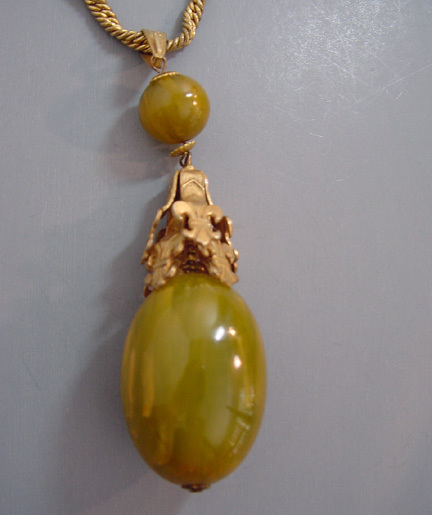 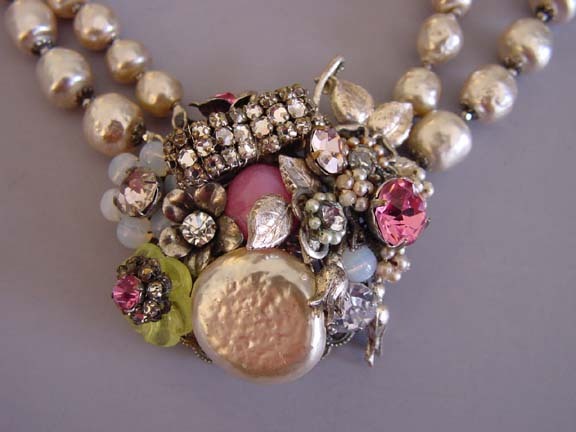 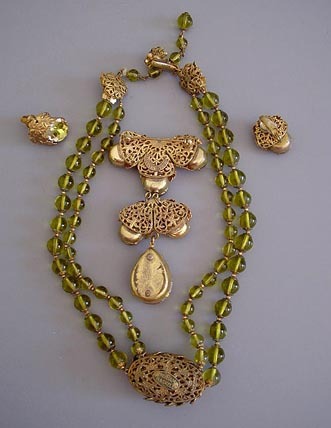 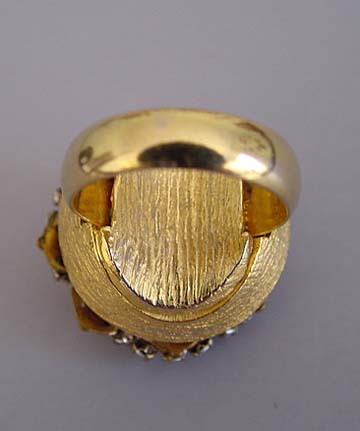 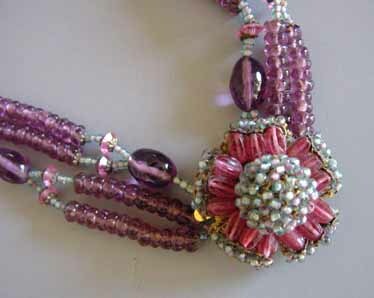 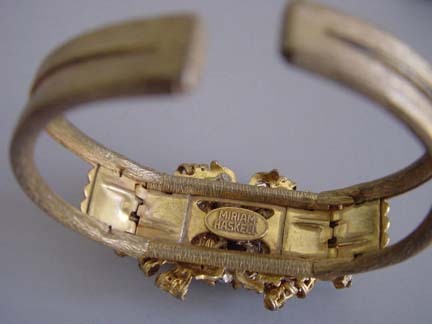 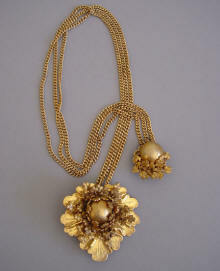 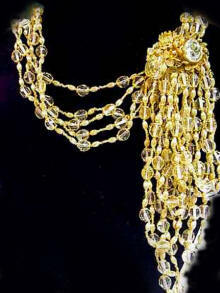 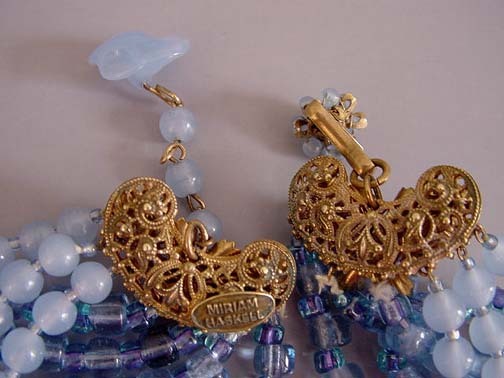 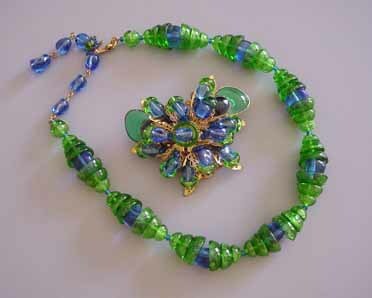 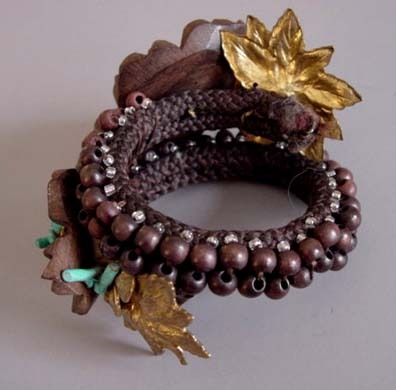 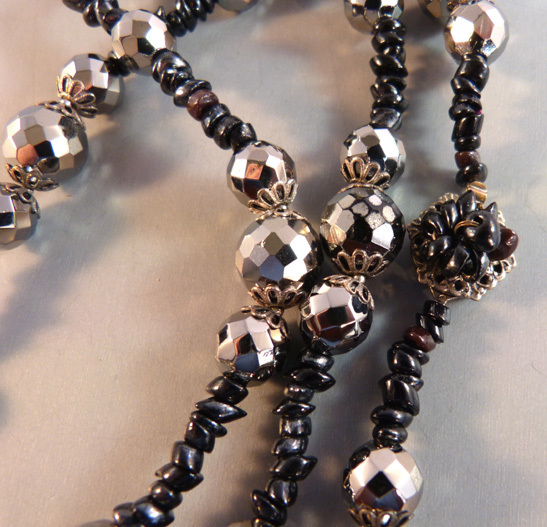 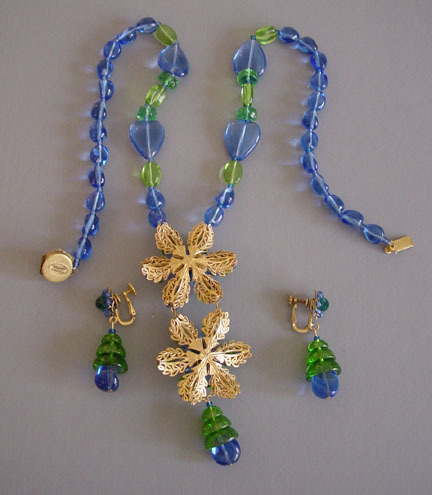 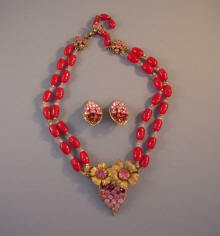 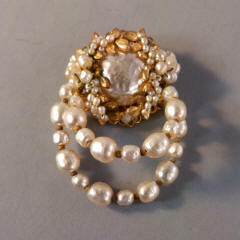 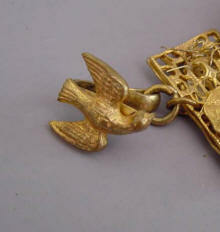 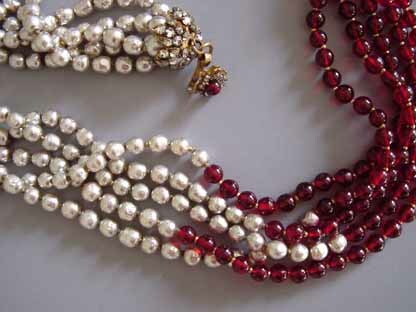 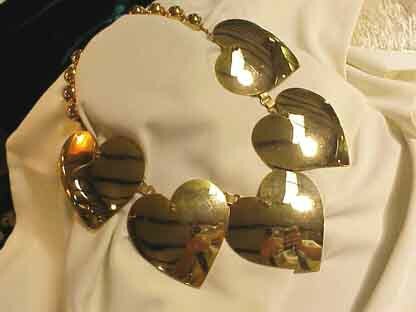 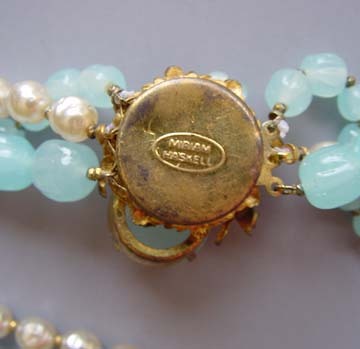 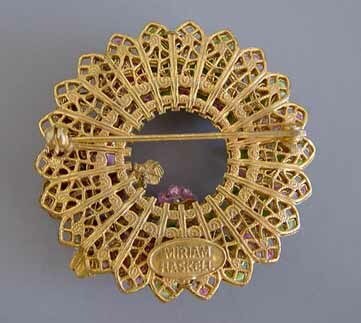 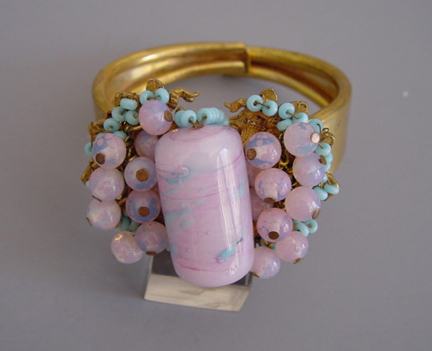 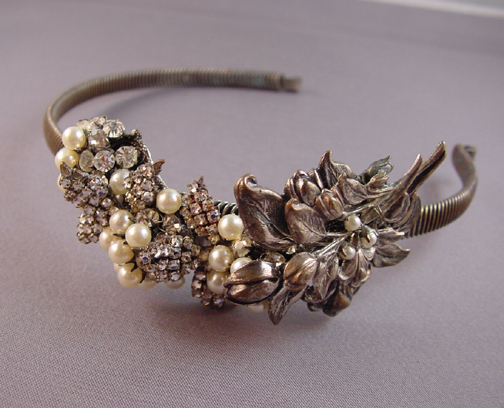 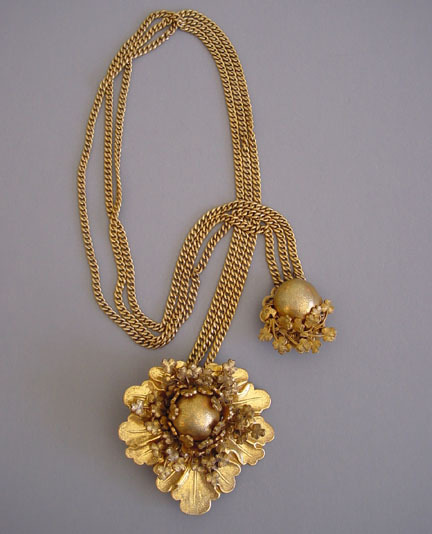 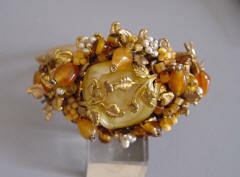 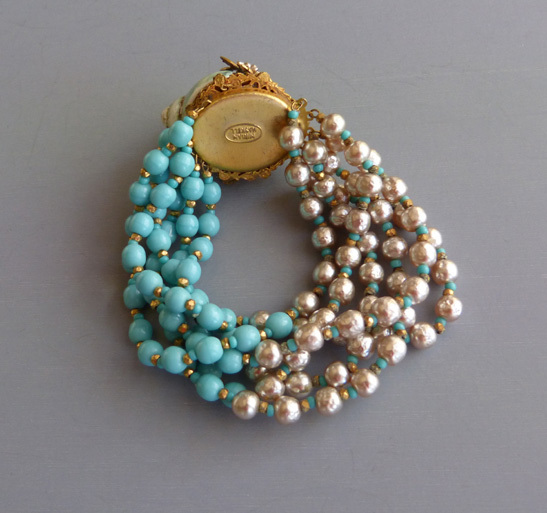 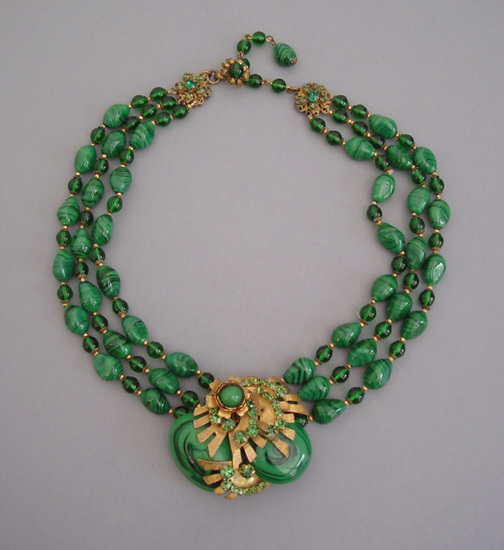 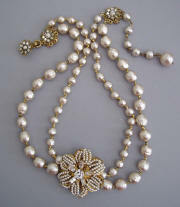 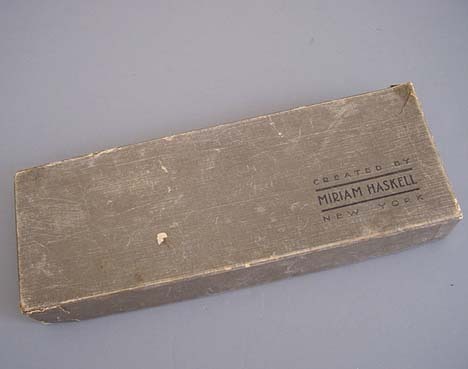 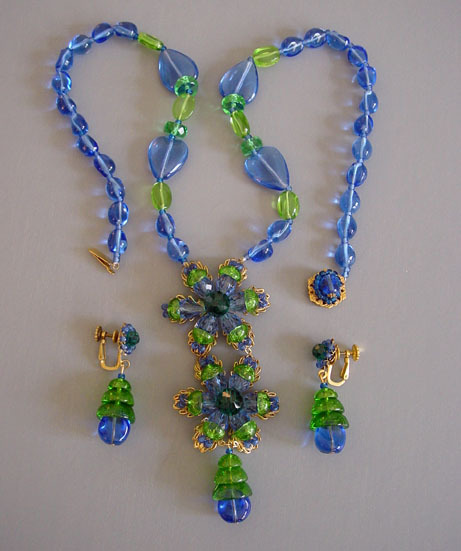 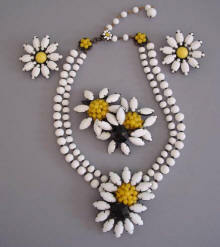 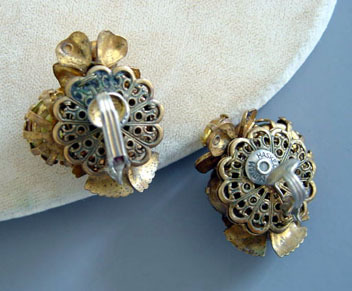 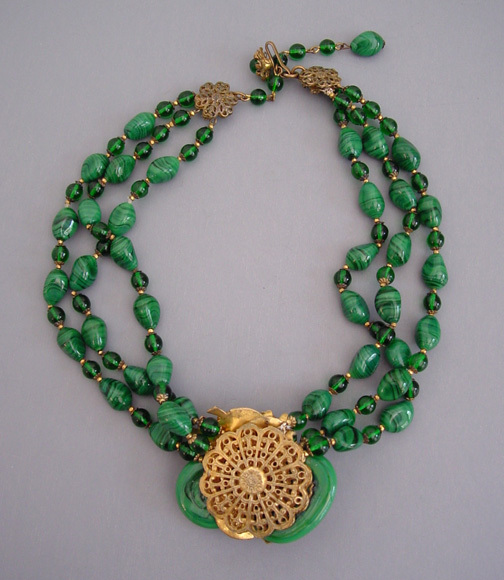 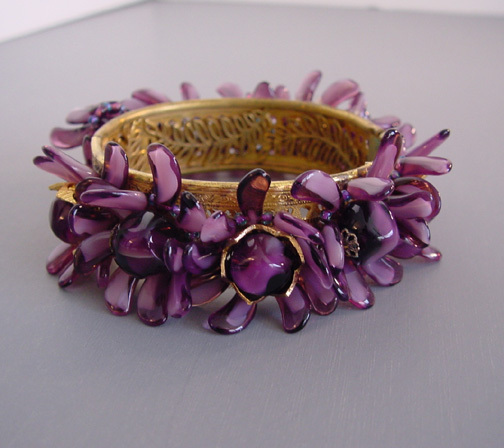 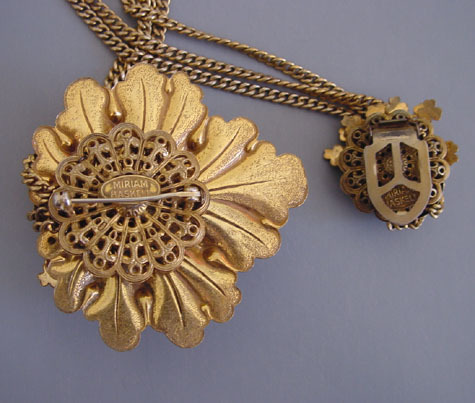 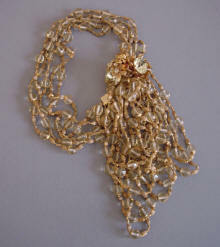 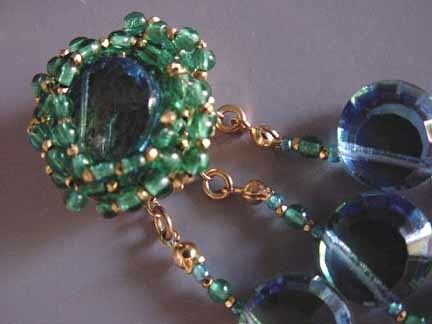 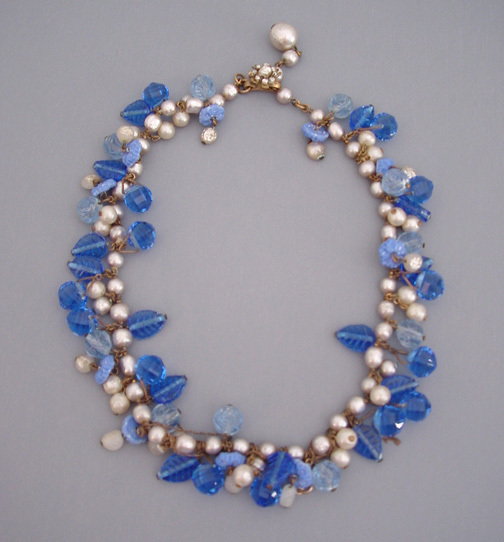 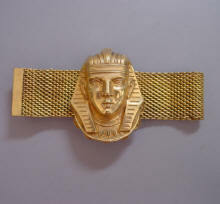 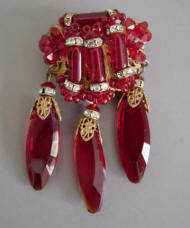 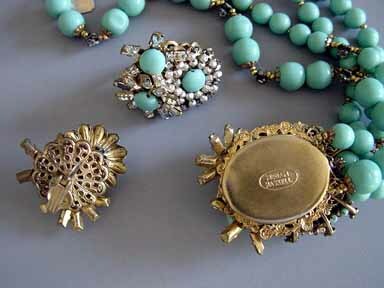 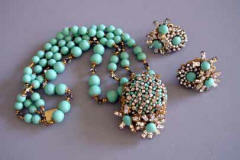 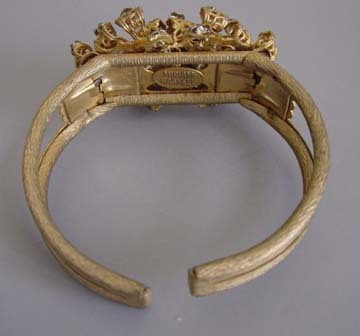 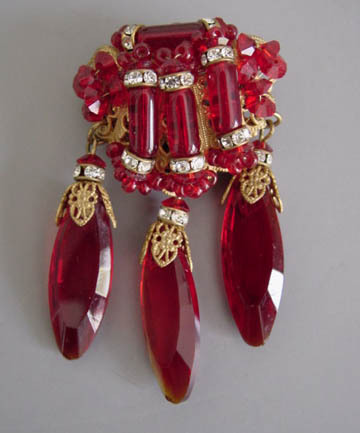 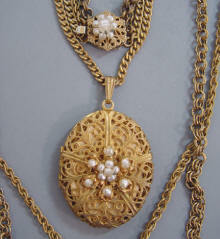 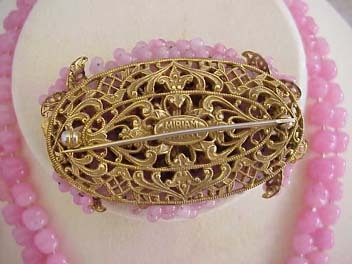 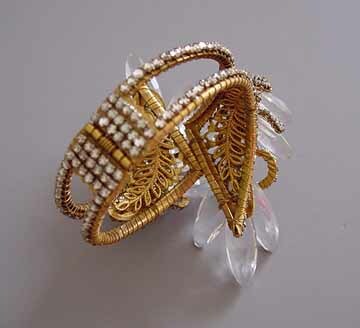 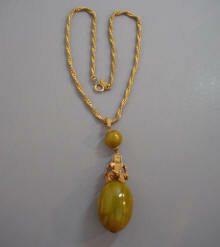 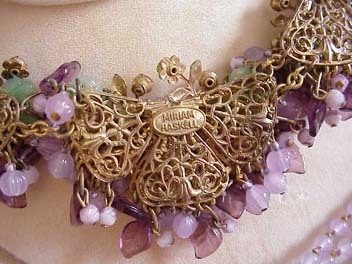 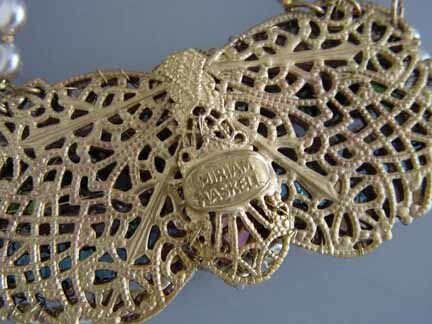 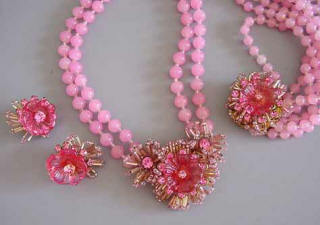 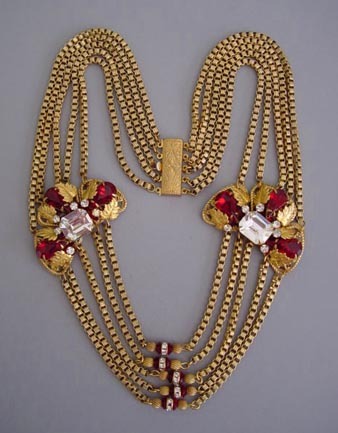 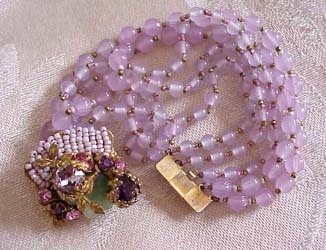 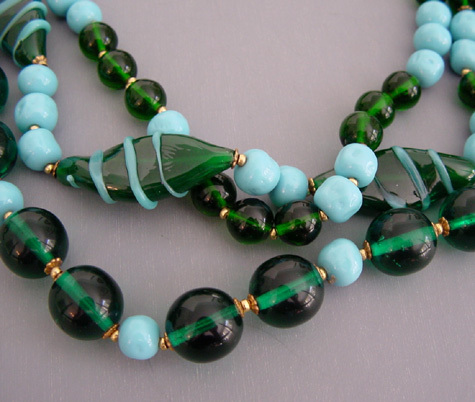 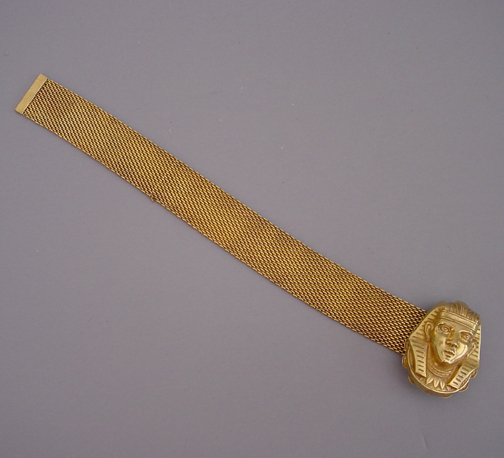 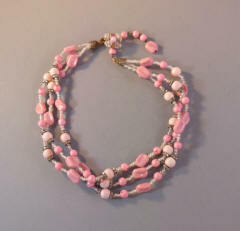 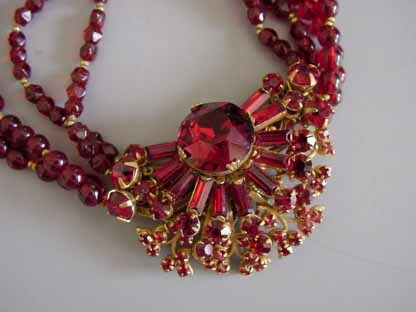 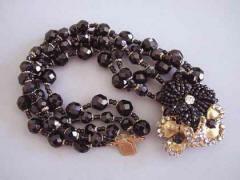 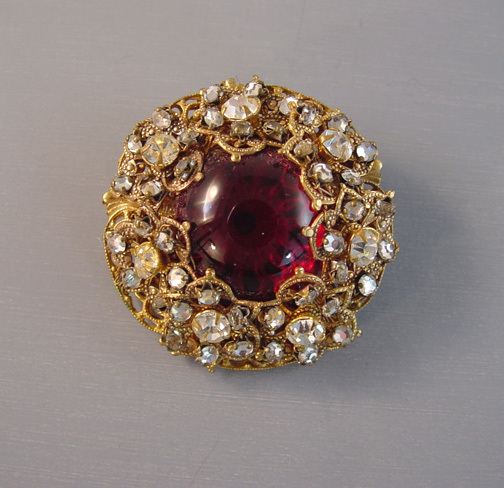 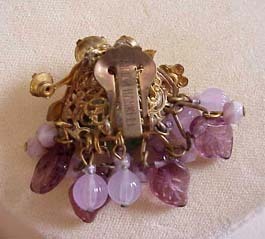 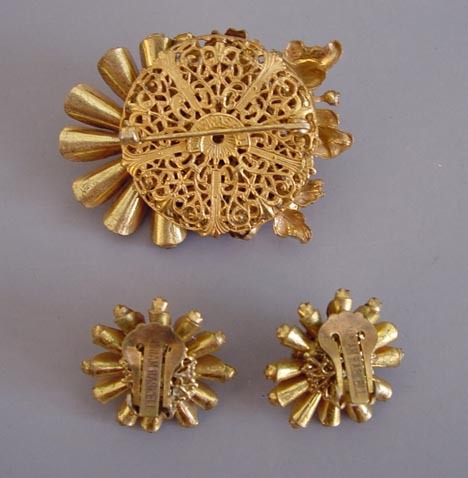 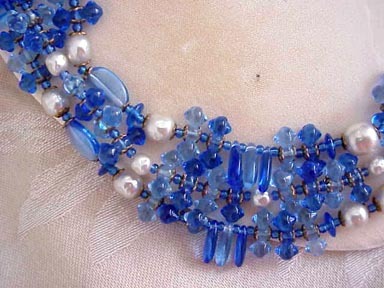 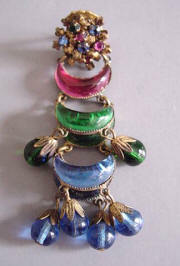 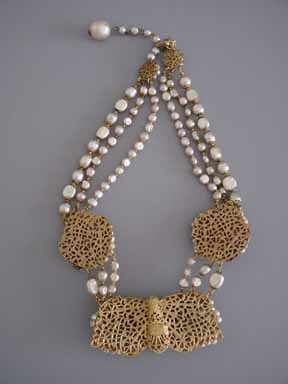 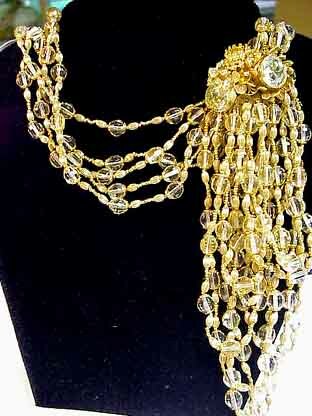 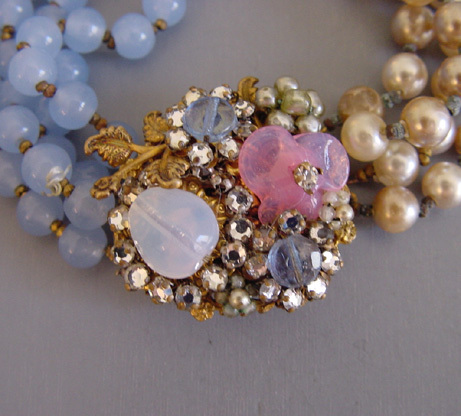 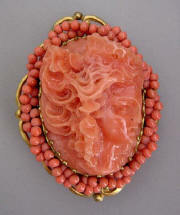 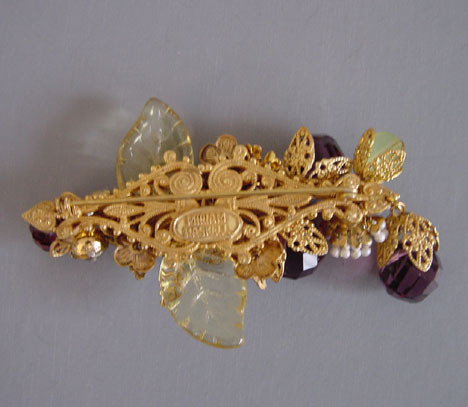 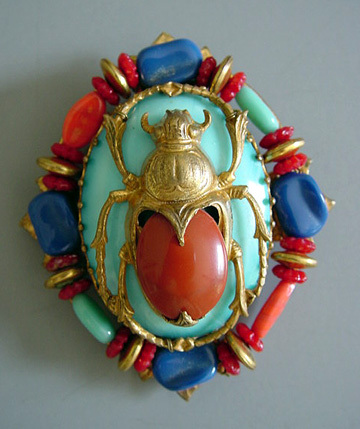 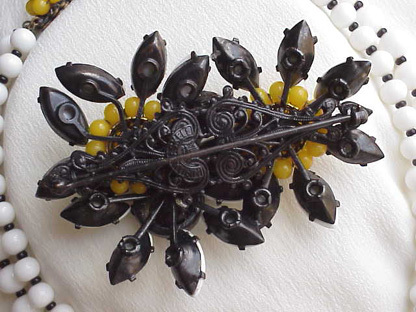 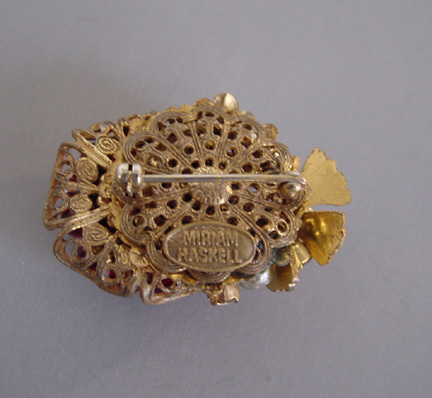 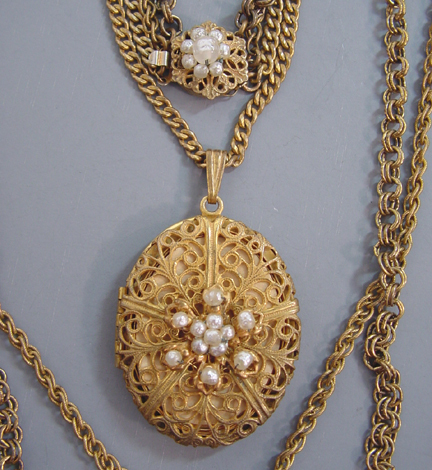 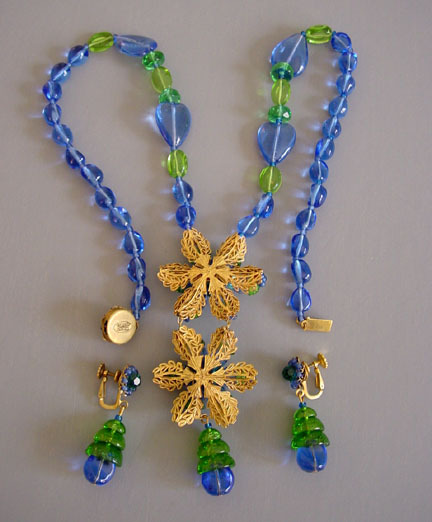 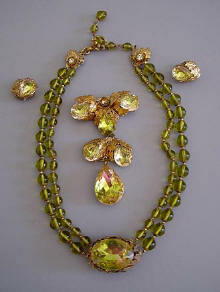 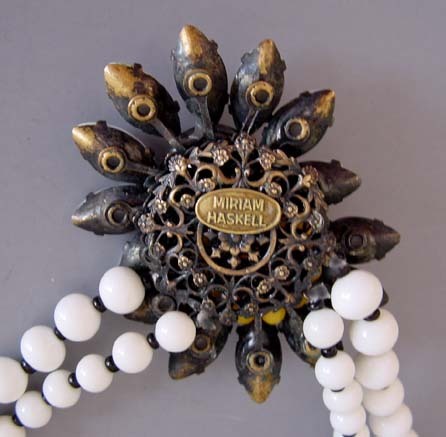 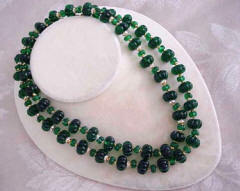 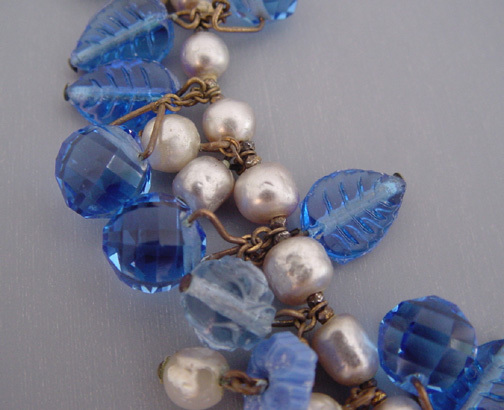 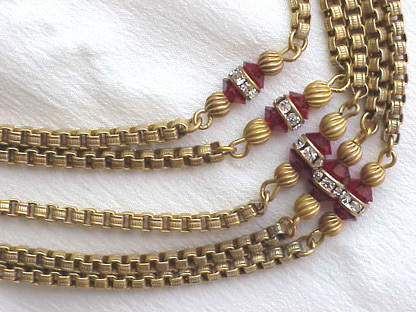 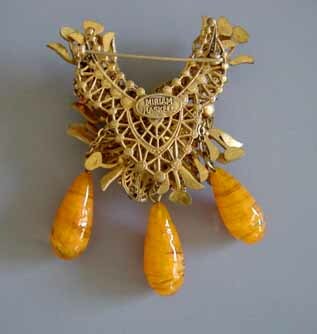 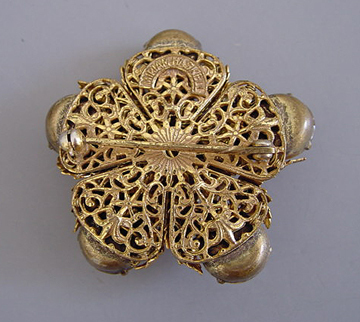 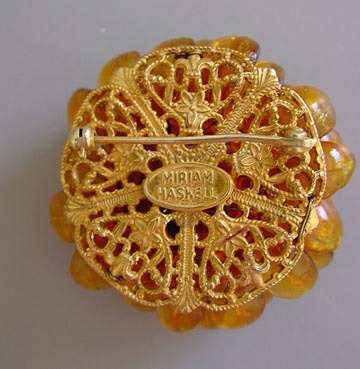 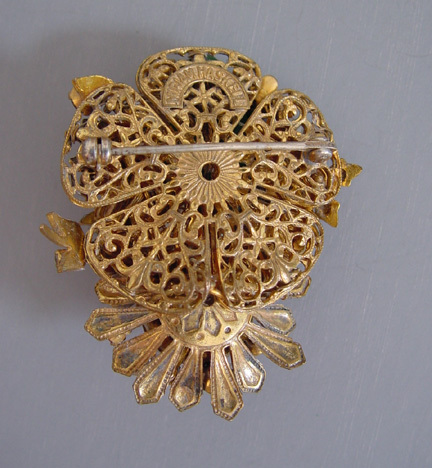 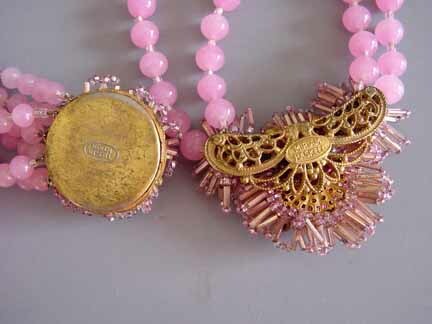 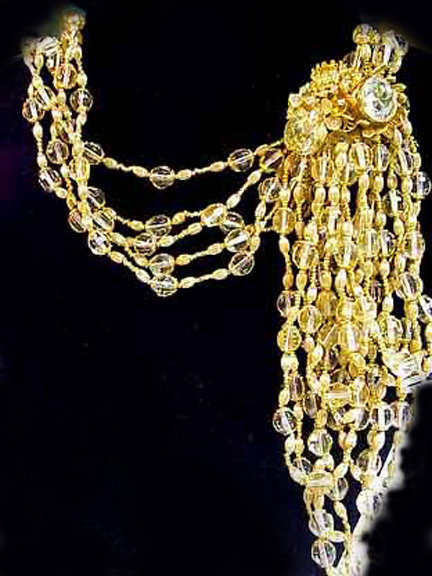 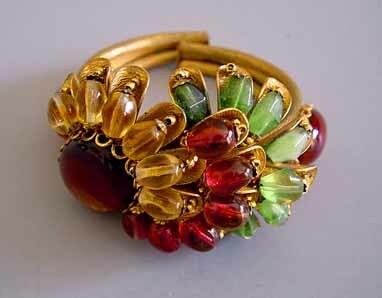 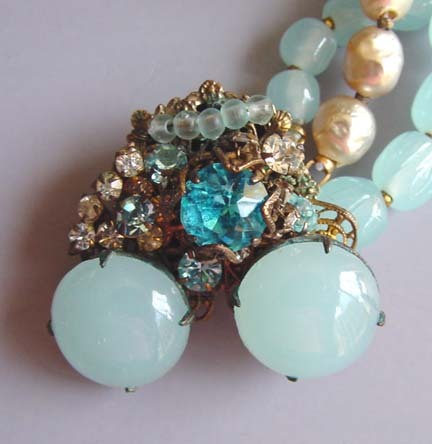 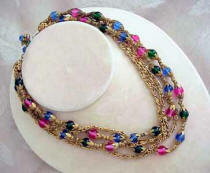 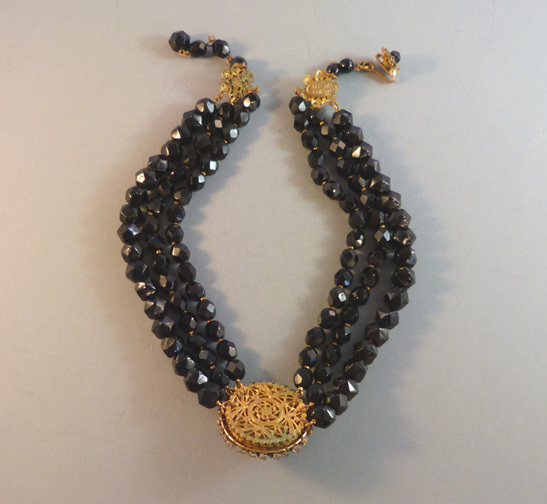 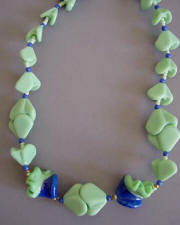 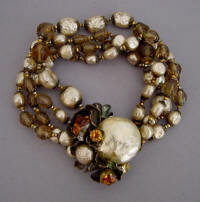 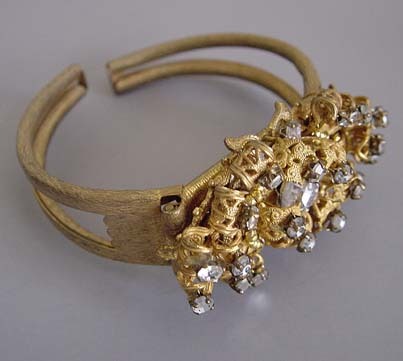 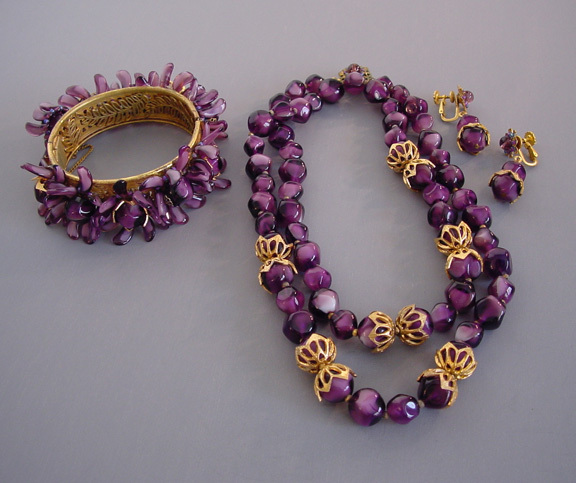 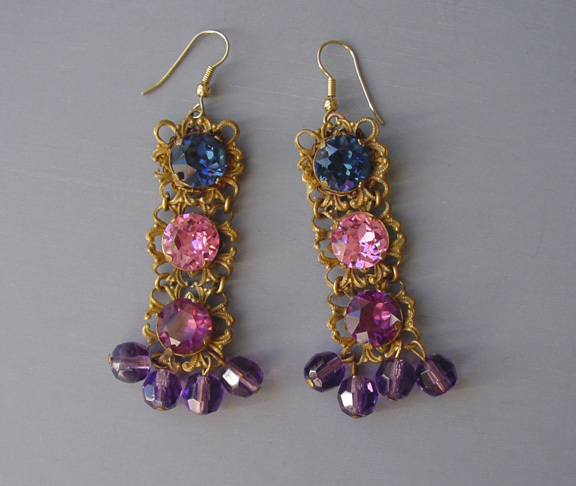 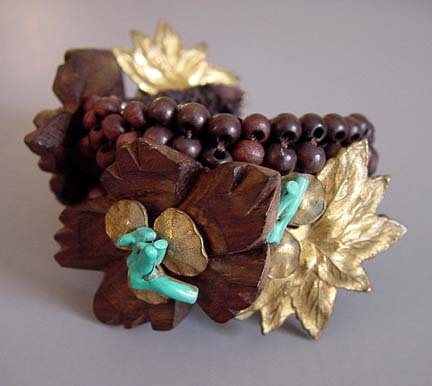 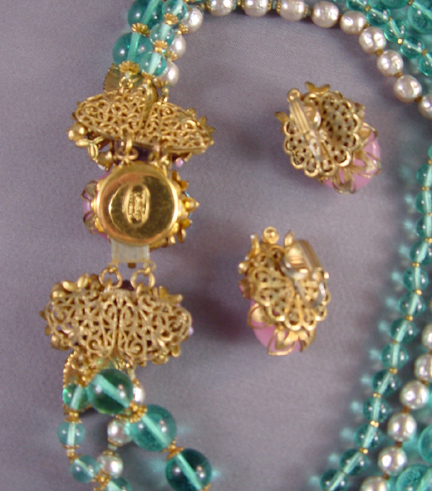 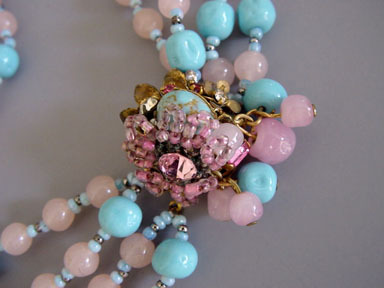 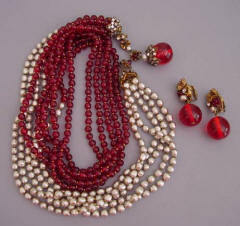 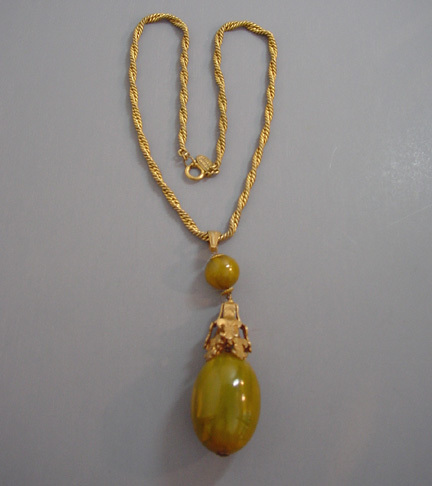 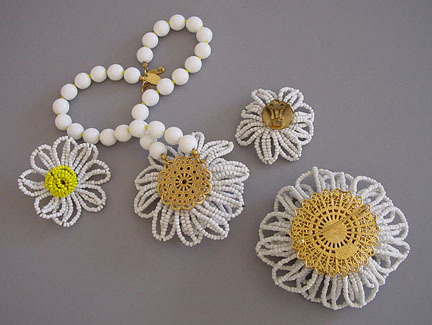 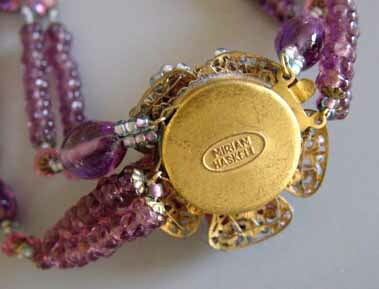 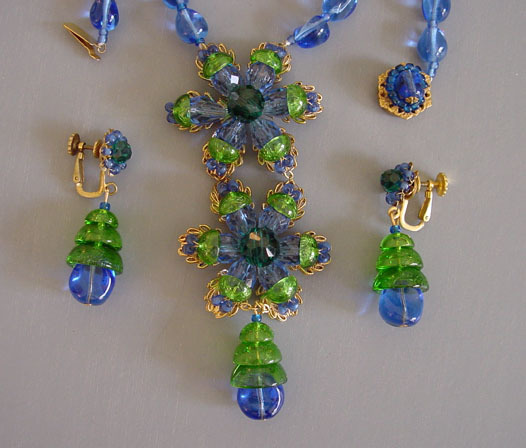 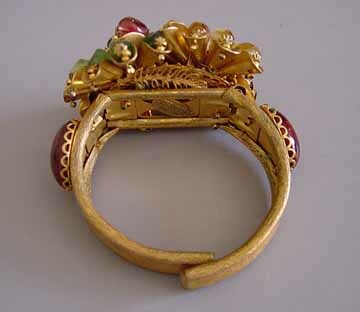 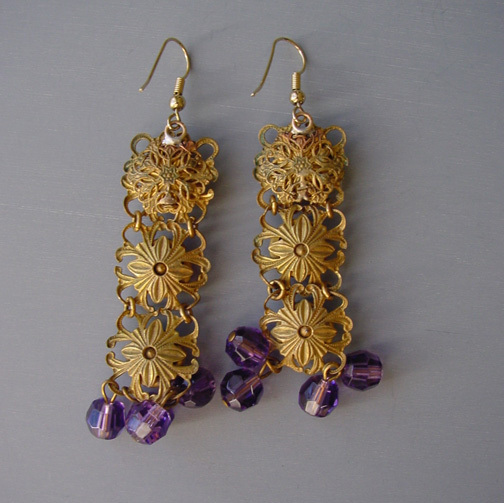 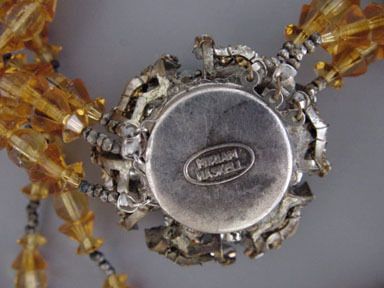 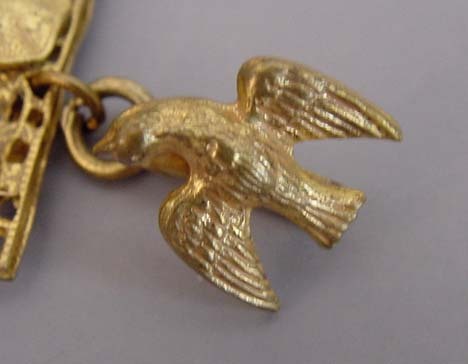 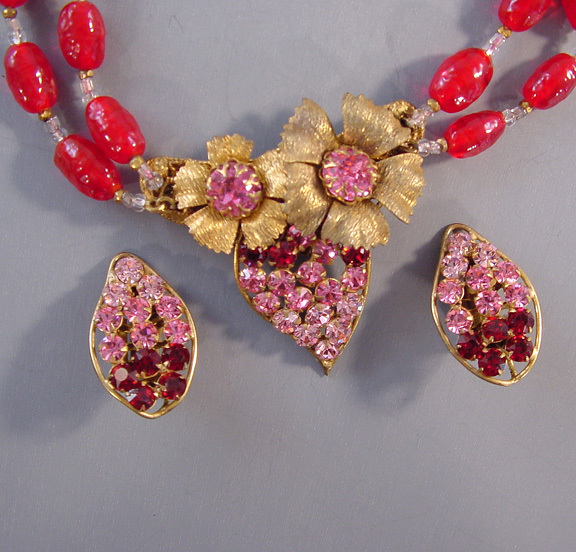 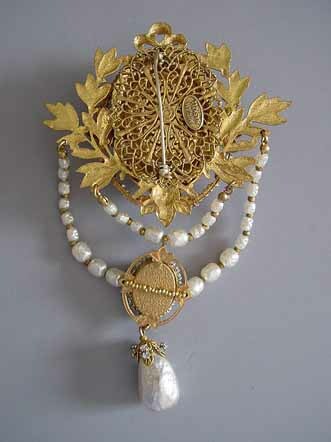 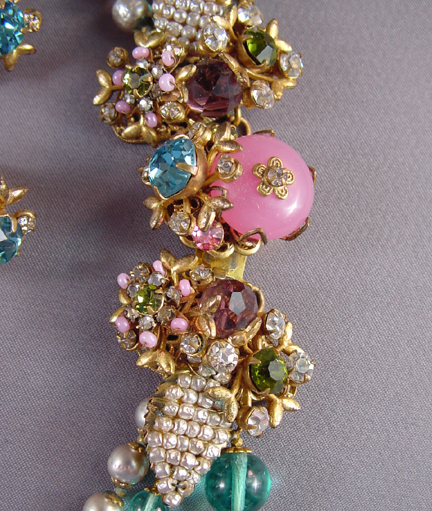 Similar pieces seen in Pamfiloff & Gordon "Miriam Haskell Jewelry" on page 141. 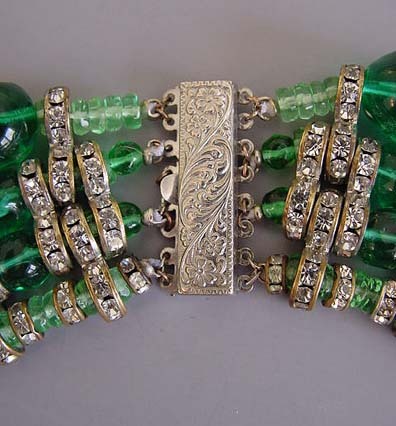 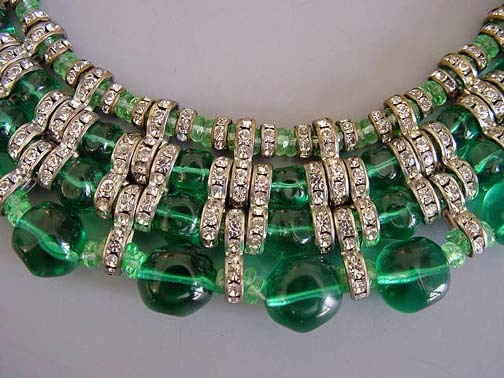 View #H31787 HASKELL fabulous green glass beads collar with clear rhinestone and silver tone roundelles set in a symmetrical design that lays flatteringly on the neck, a fabulous collar. 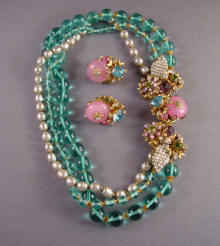 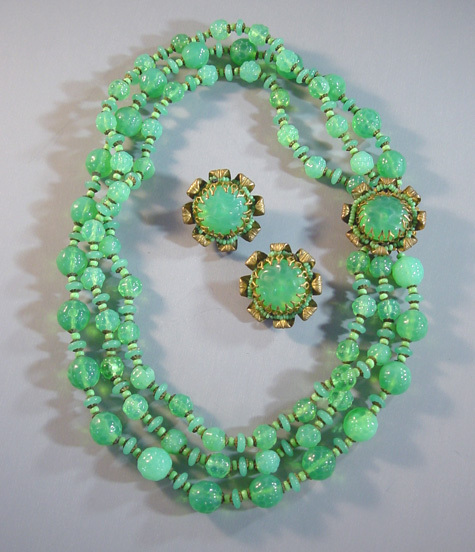 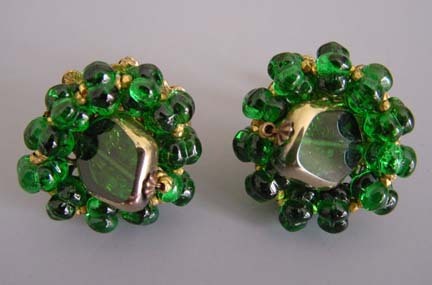 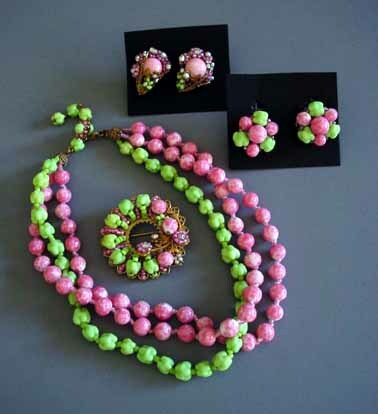 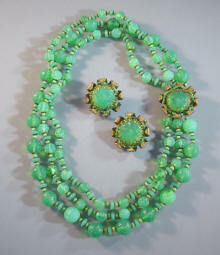 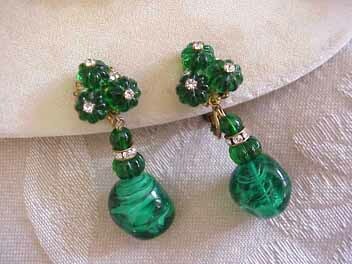 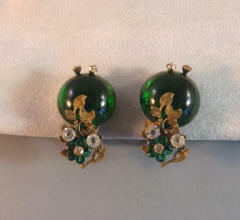 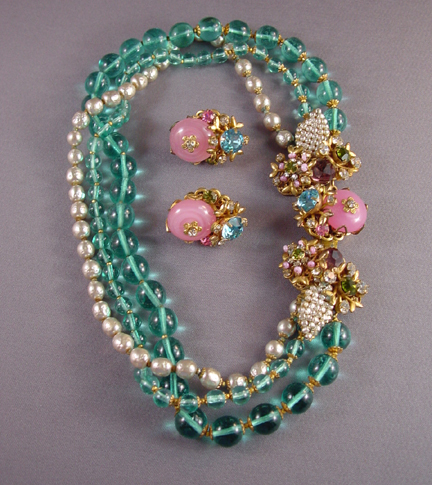 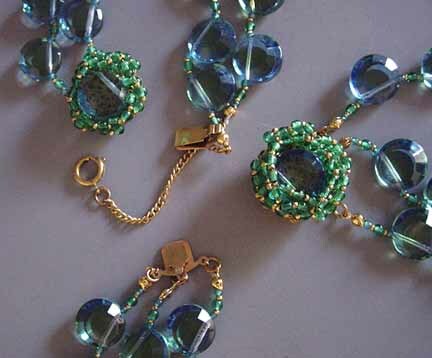 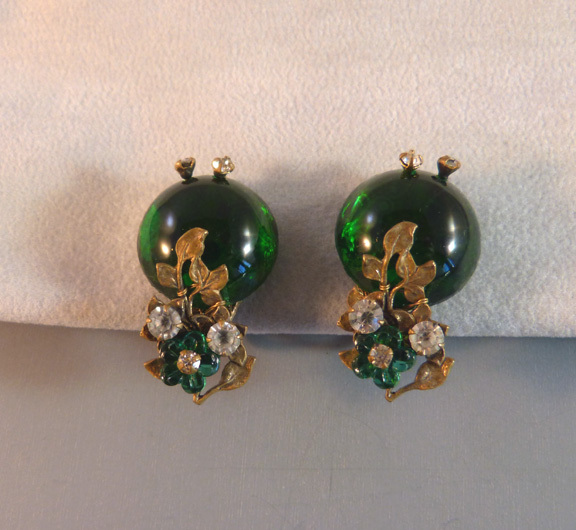 View View View #H29751 HASKELL green glass melon shaped beads and rose montee 1" earrings. 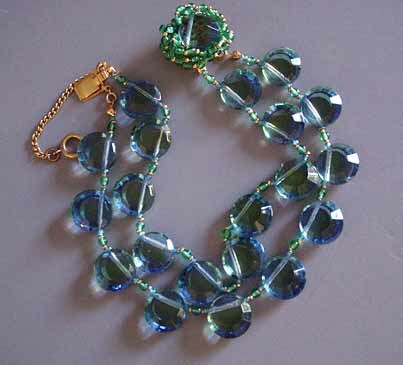 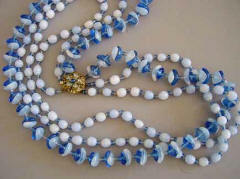 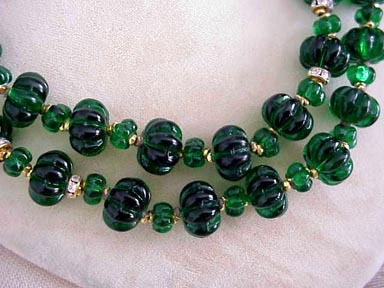 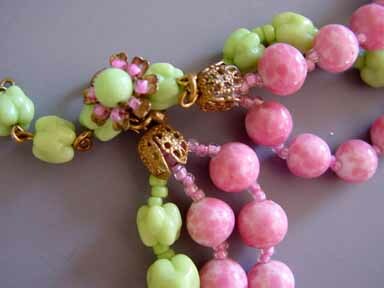 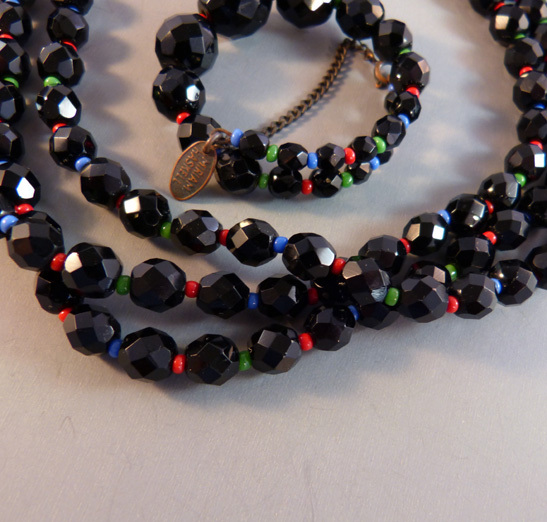 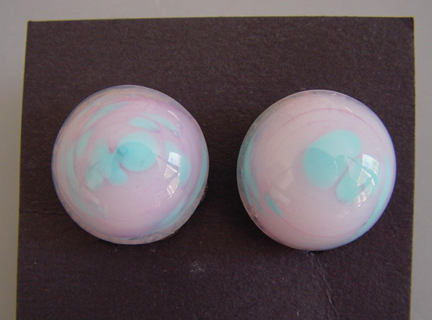 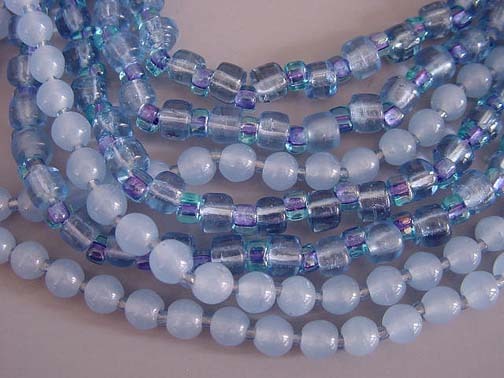 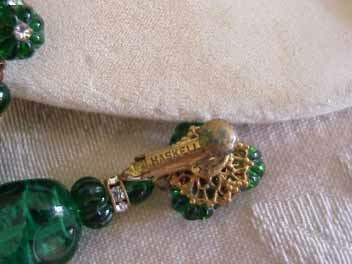 The melon shaped glass beads were a Hess favorite. #H23998 , and they're a favorite of mine too! 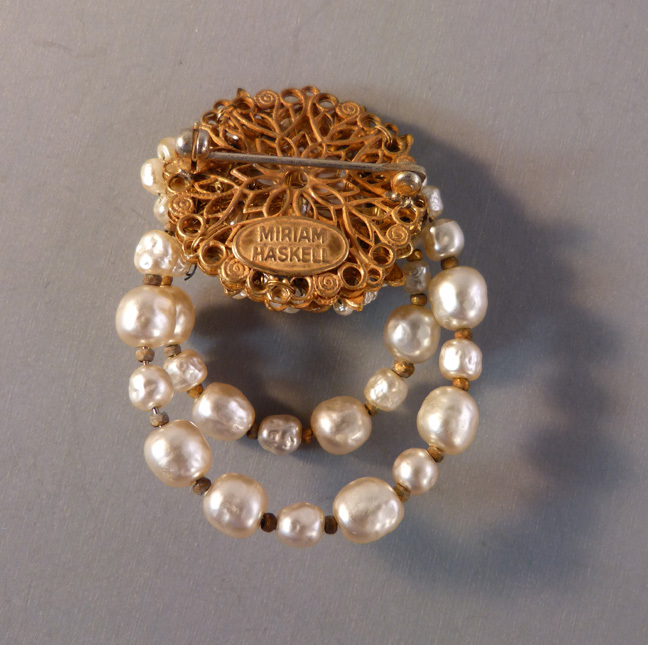 To read more about HASKELL EARLY UNSIGNED JEWELRY, see our article in JEWEL CHAT on line Magazine and the feature on HASKELL ART WORK & ADVERTISING.